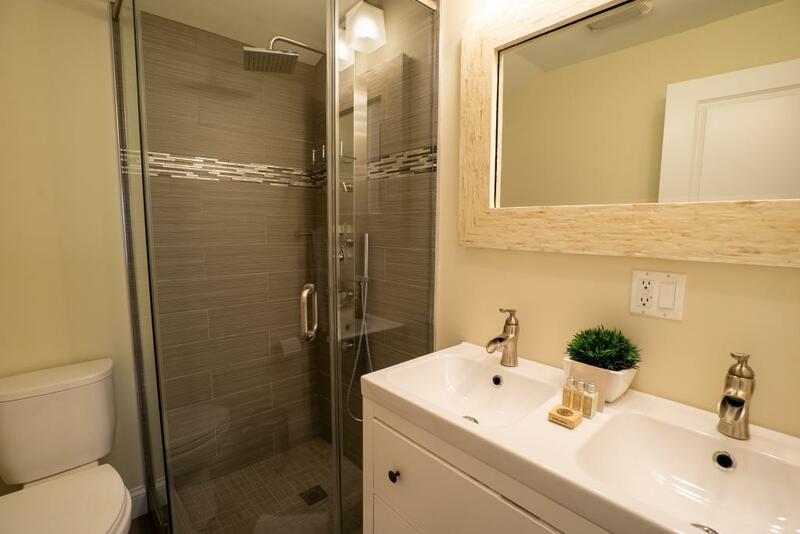 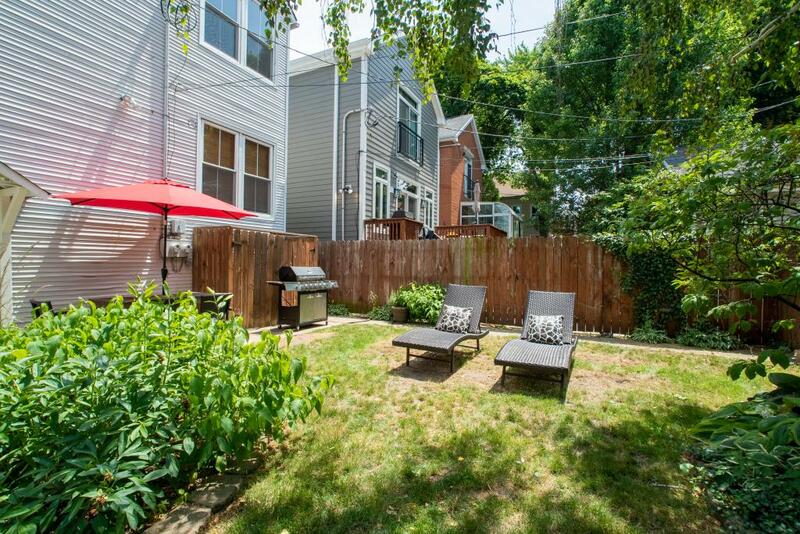 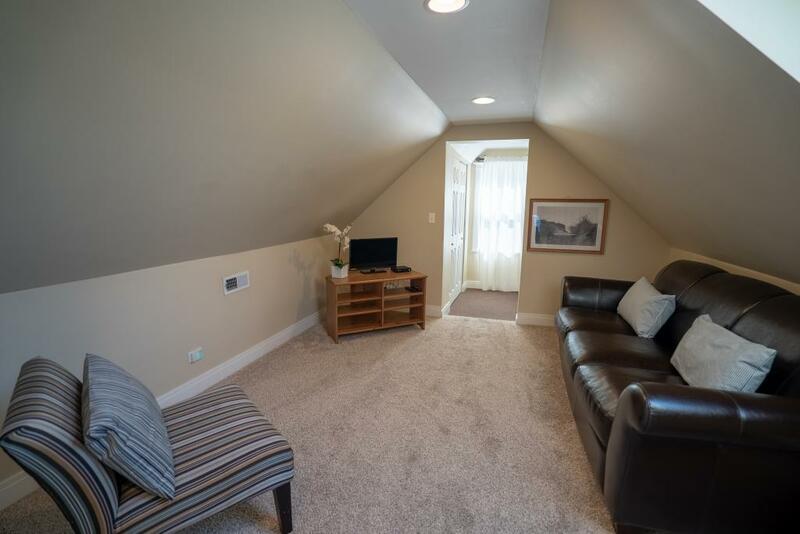 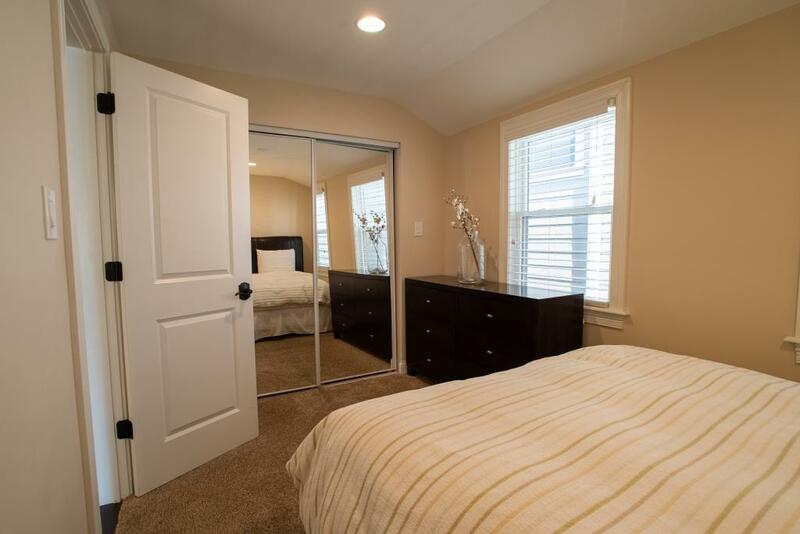 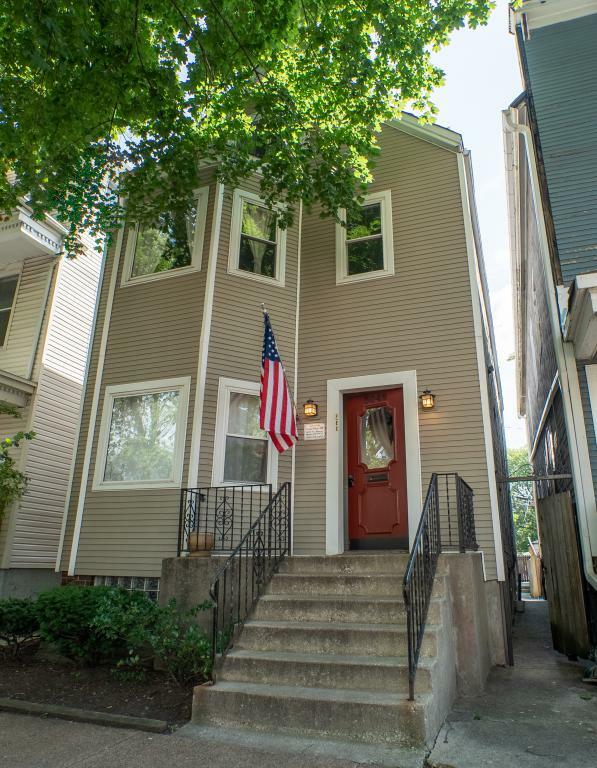 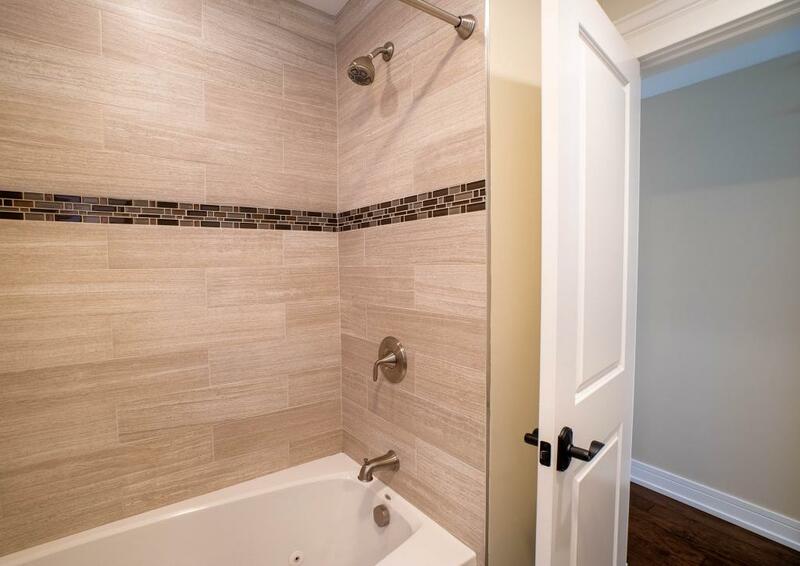 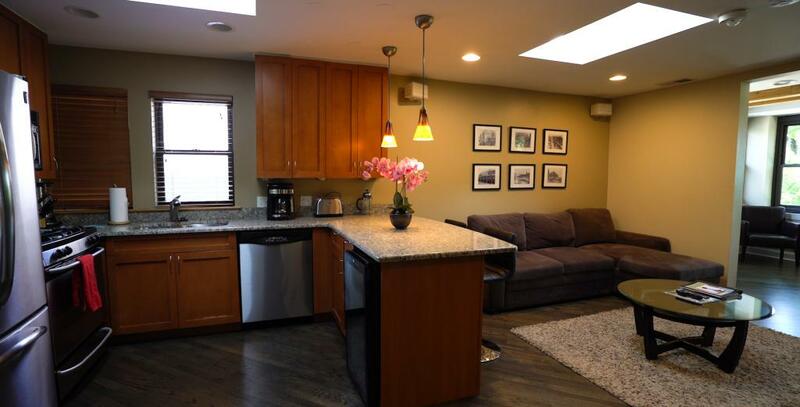 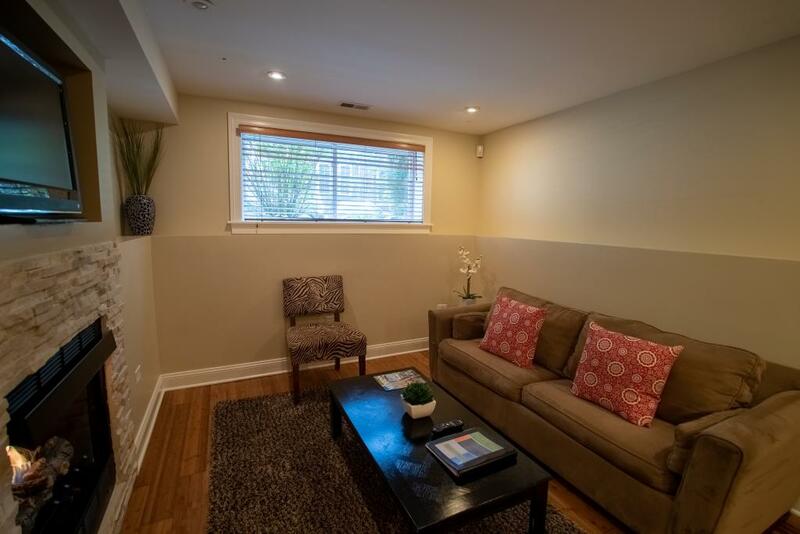 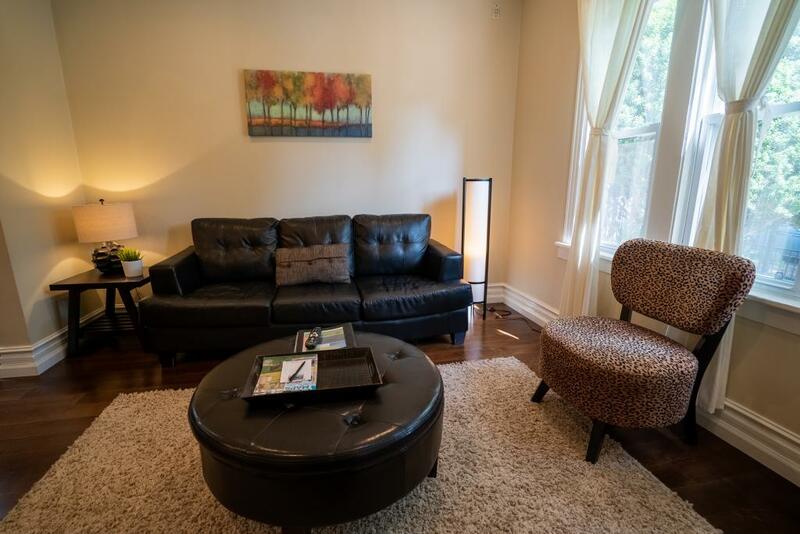 East Roscoe #1 is a first floor apartment, fully furnished and tastefully decorated. 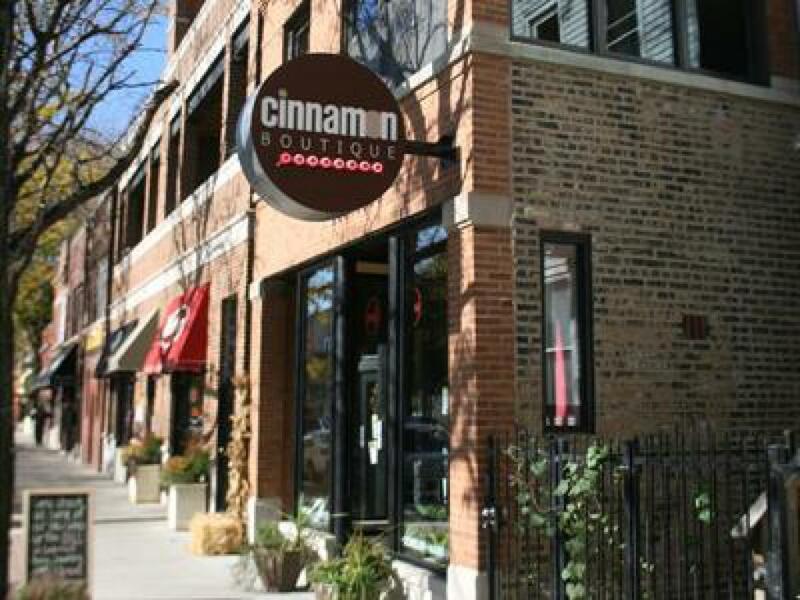 Located on Roscoe & Damen in Roscoe Village. 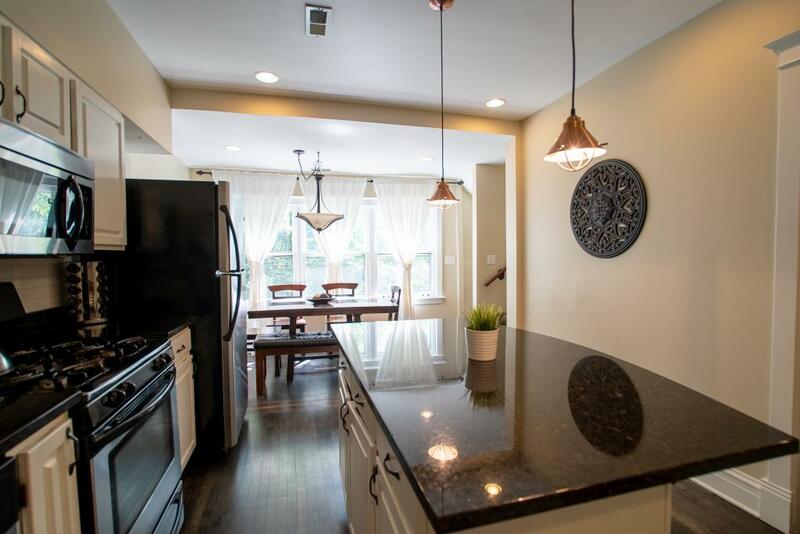 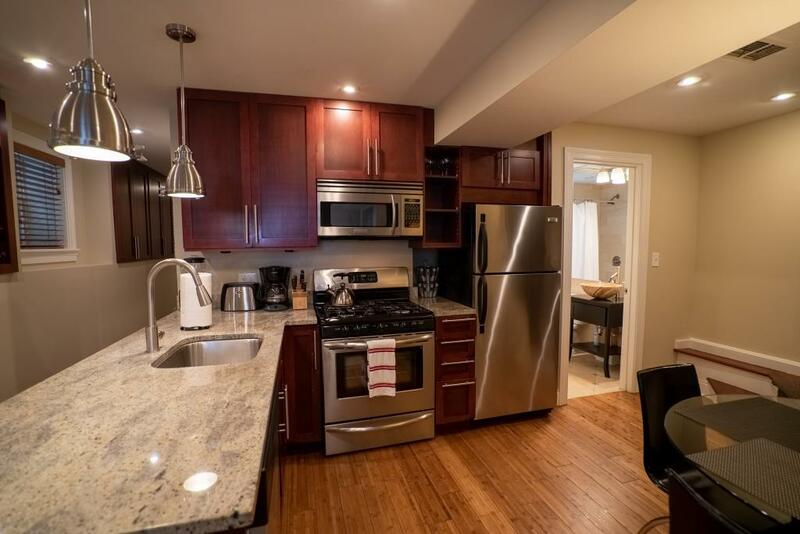 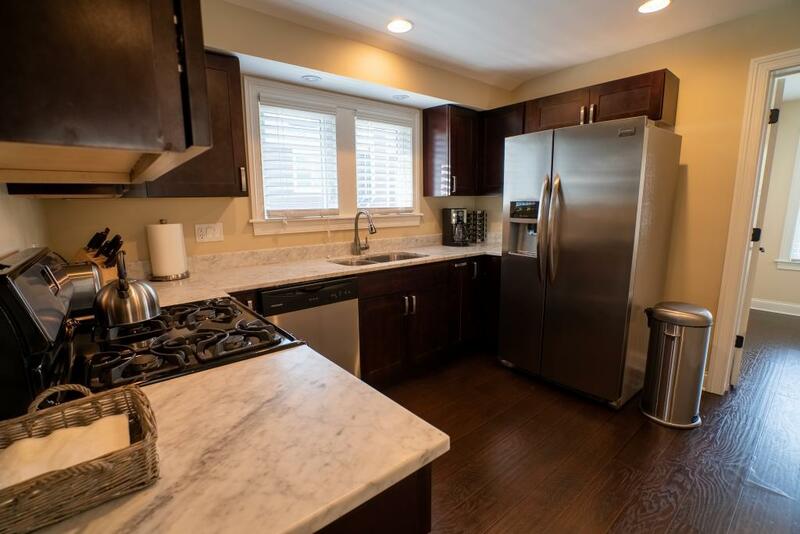 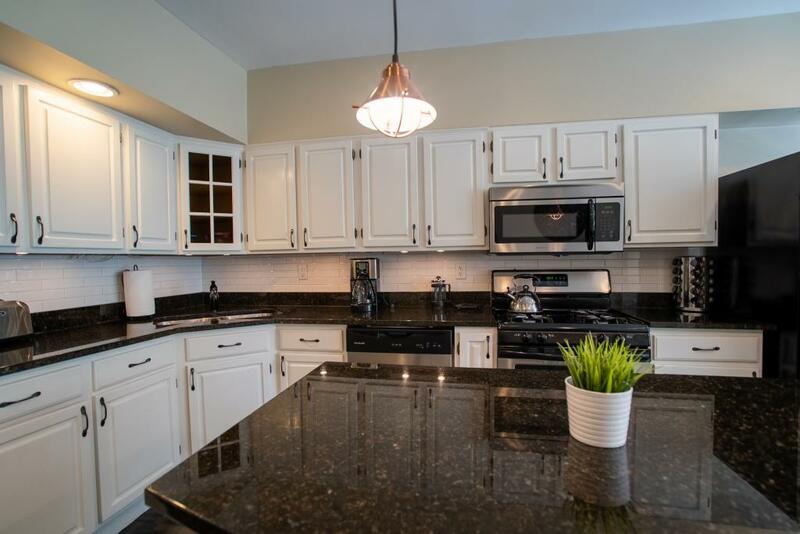 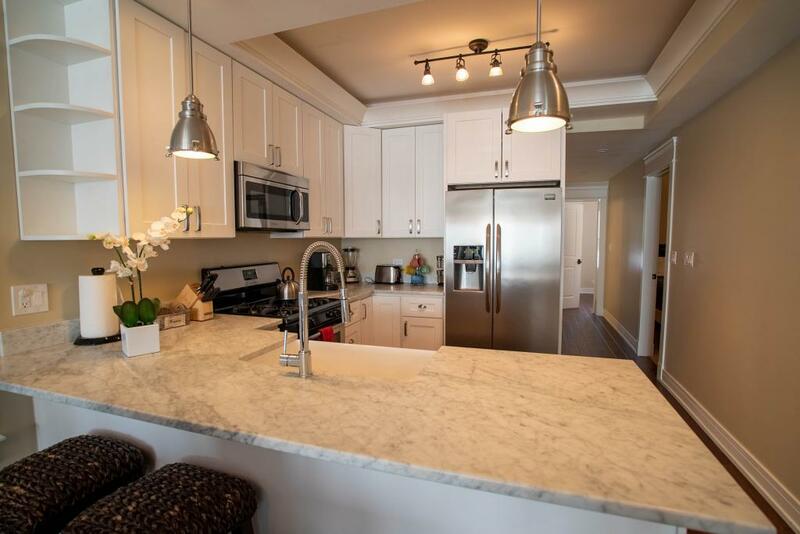 In the kitchen you will find stocked shelves with kitchenware along with with stainless steel appliances, coffee pot, complimentary coffee, tea & sugar. 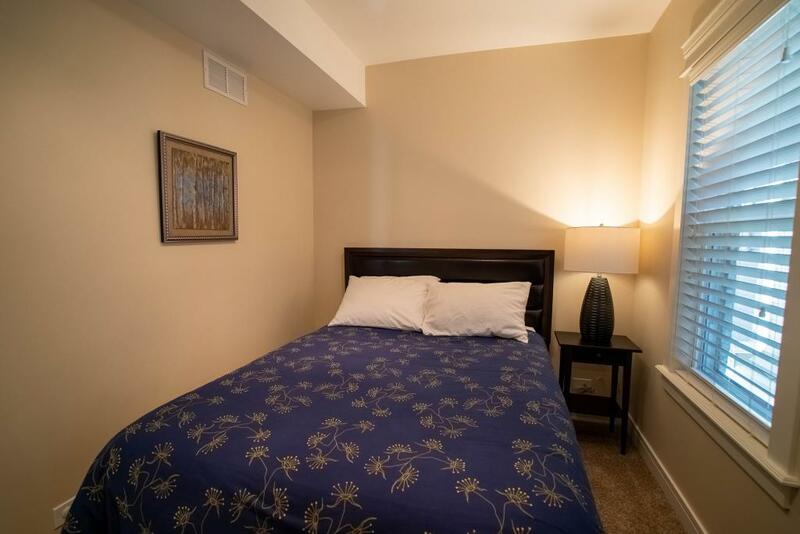 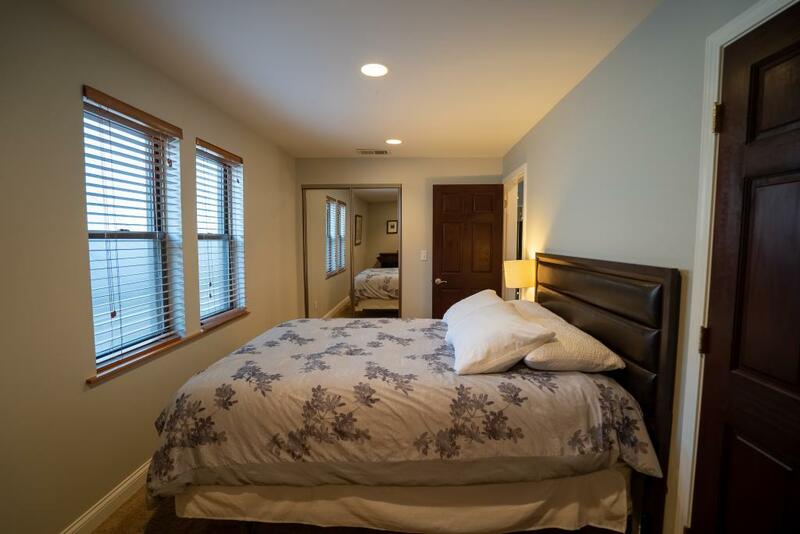 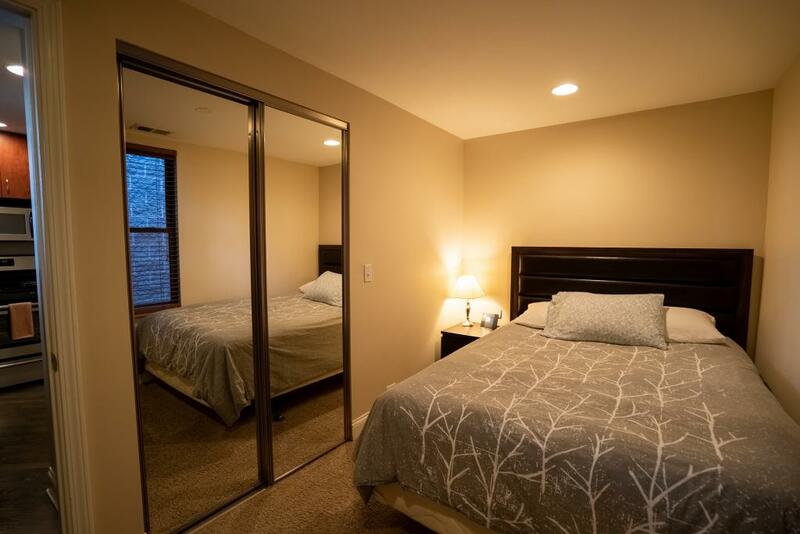 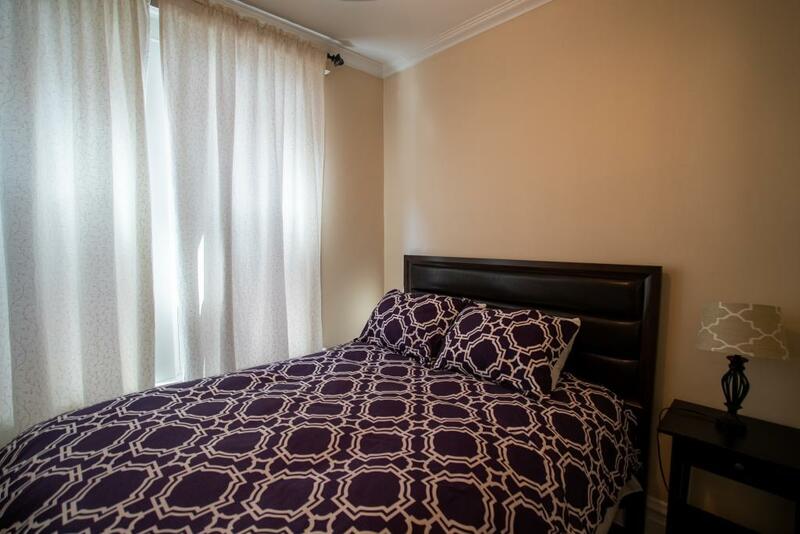 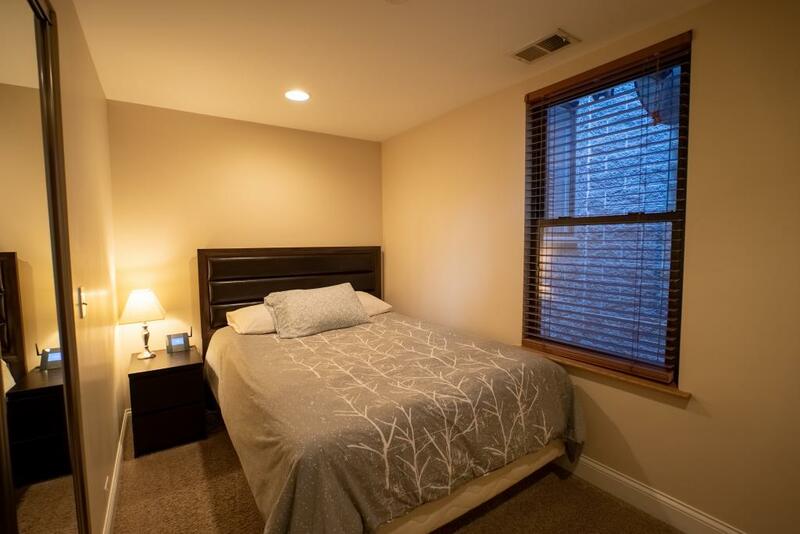 In the bedrooms you will find custom made beds with an independent spring system, memory foam pad, 400-1000 high thread count sheets and down comforters. 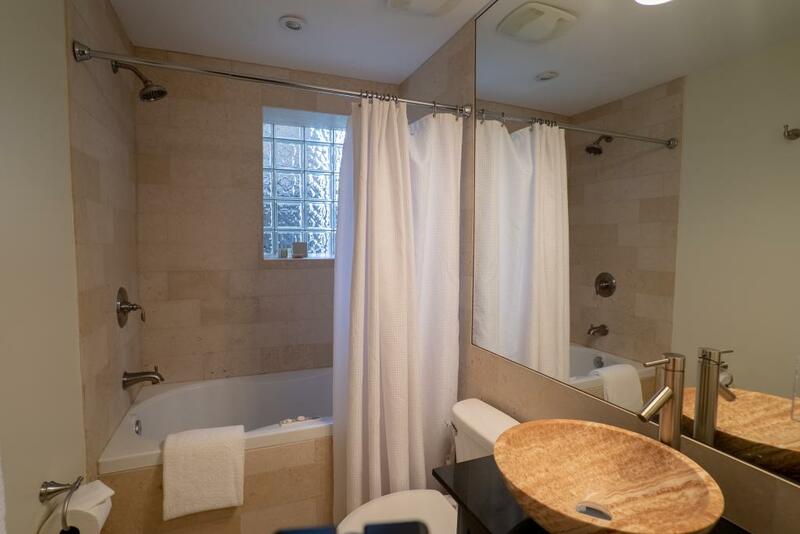 The bathrooms have lush towels and L'Occitane En Provence Verbena amenities. 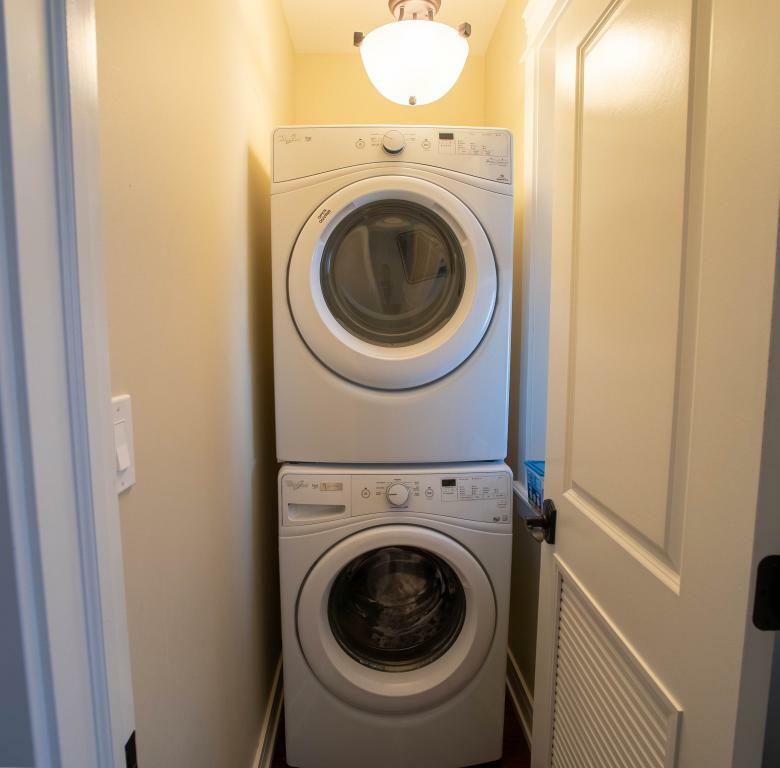 This apartment has a shared washer and dryer inside the building. 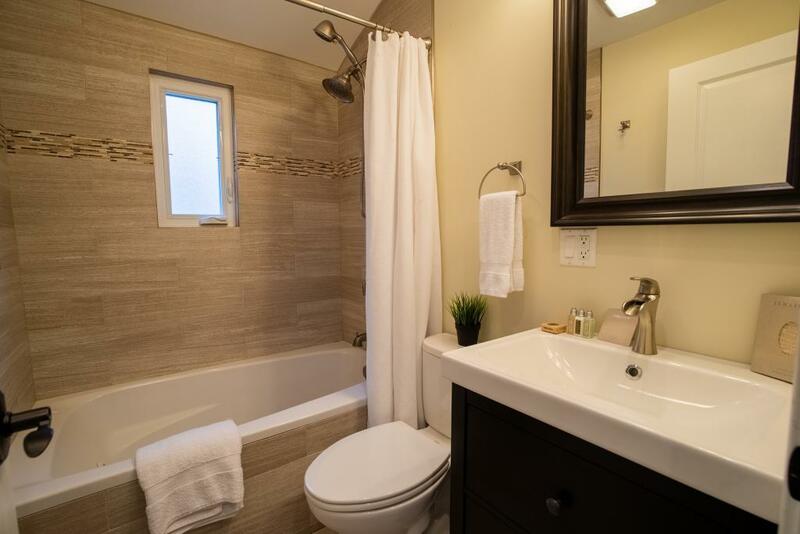 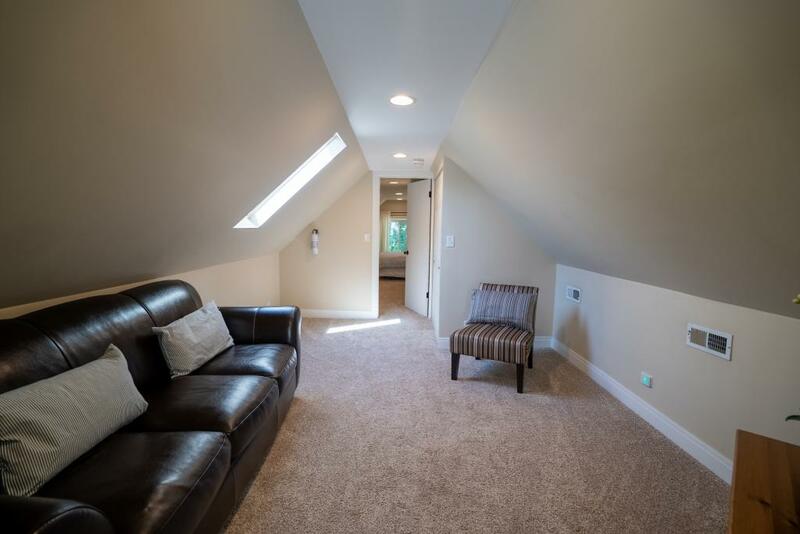 East Roscoe #2 is a second and third floor apartment, fully furnished and tastefully decorated. 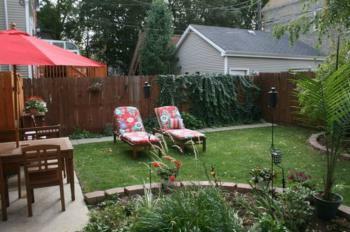 Located on Roscoe & Damen in Roscoe Village. 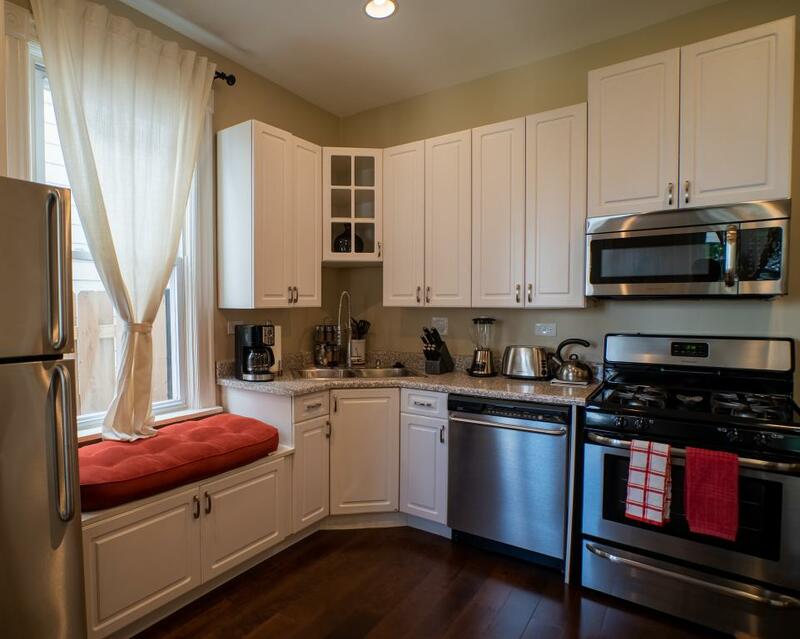 In the kitchen you will find stocked shelves with kitchenware along with with stainless steel appliances, coffee pot, complimentary coffee, tea & sugar. 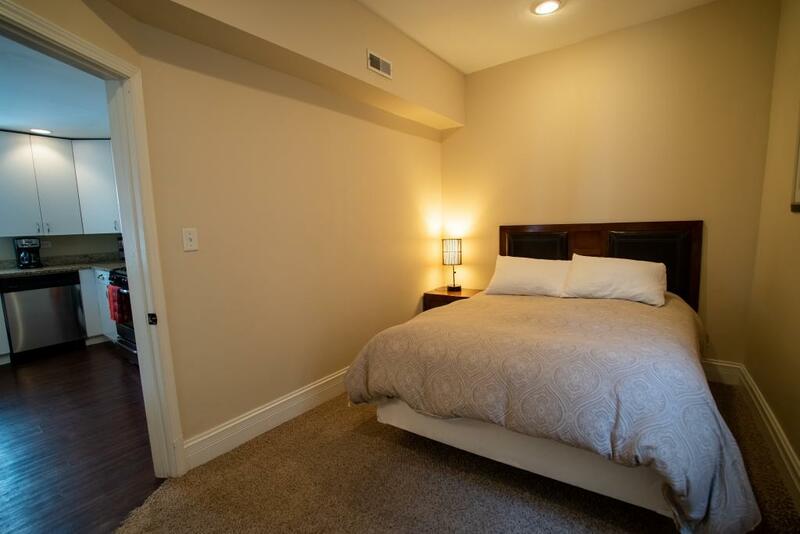 In the bedrooms you will find custom made beds with an independent spring system, memory foam pad, 400-1000 high thread count sheets and down comforters. 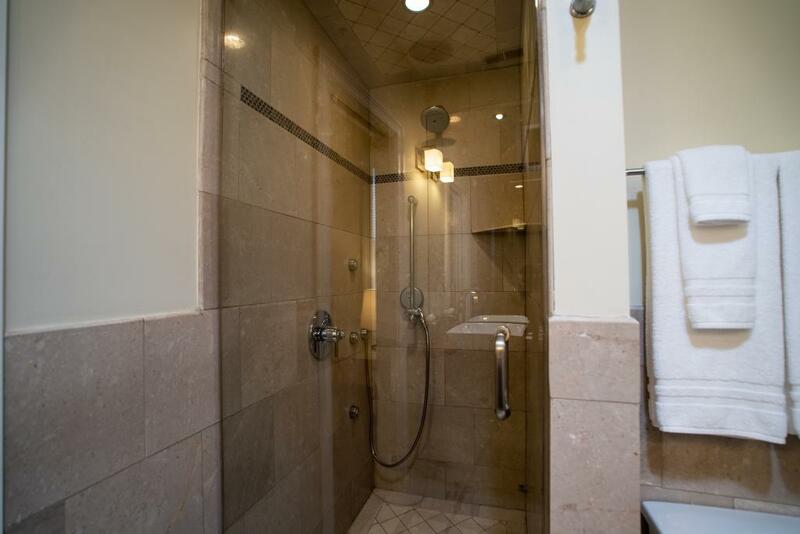 The bathrooms have lush towels and L'Occitane En Provence Verbena amenities. This apartment has a shared washer and dryer inside the building. 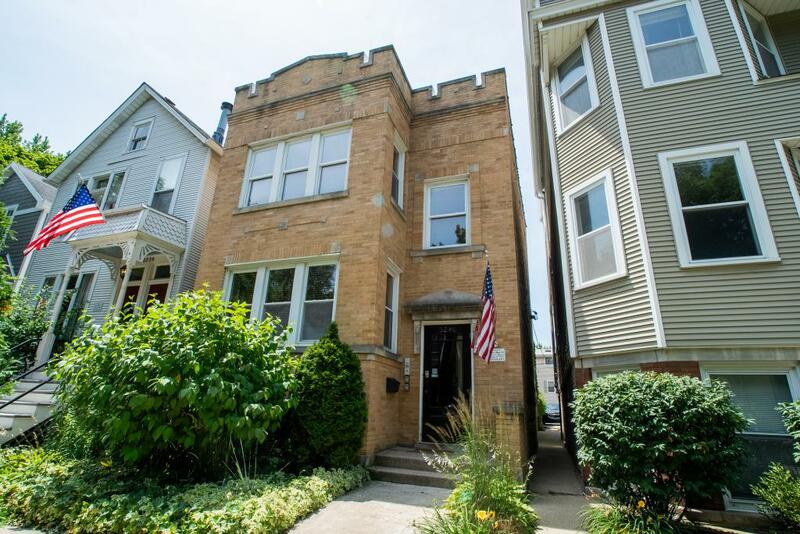 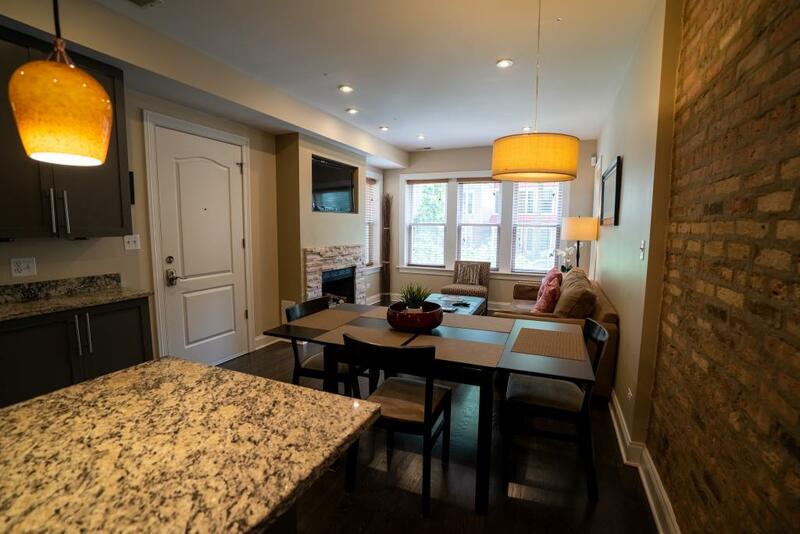 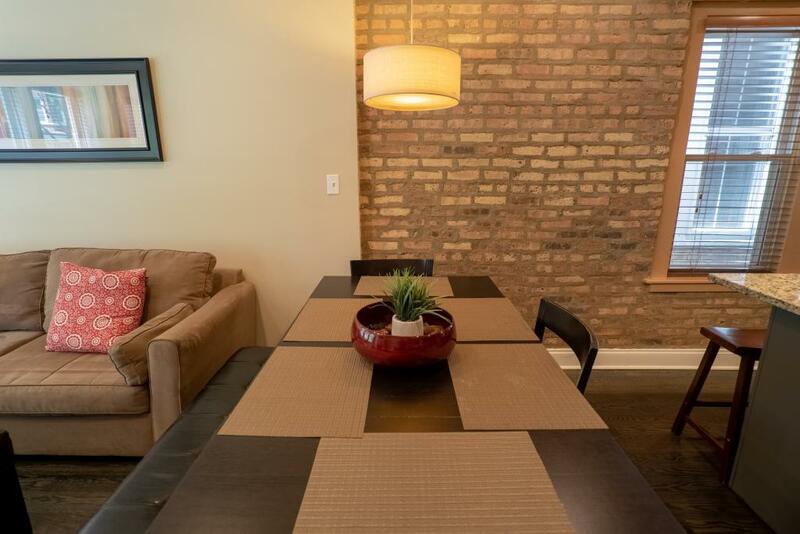 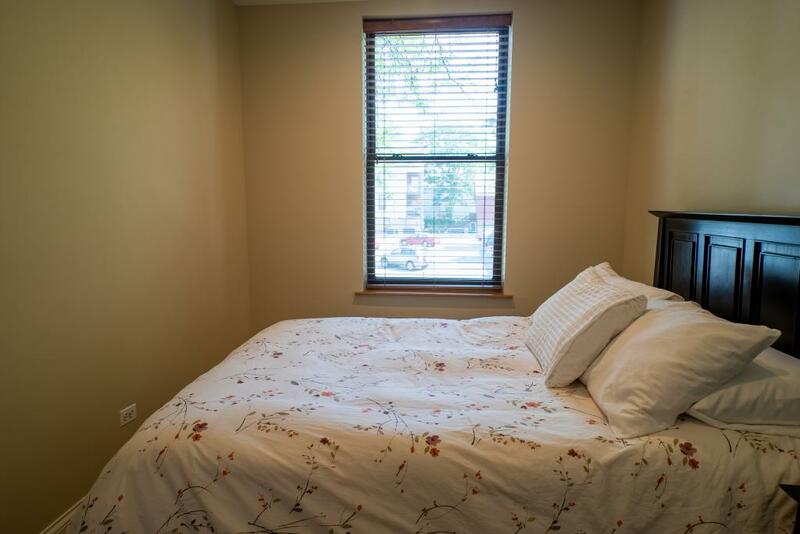 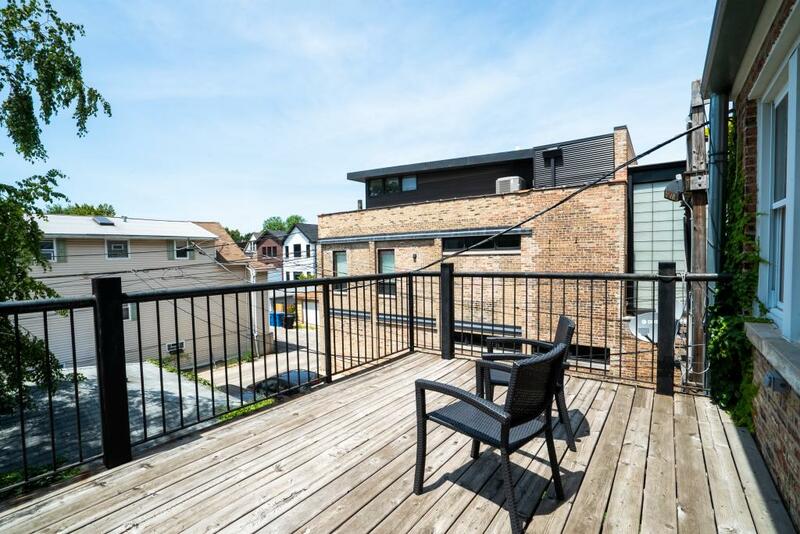 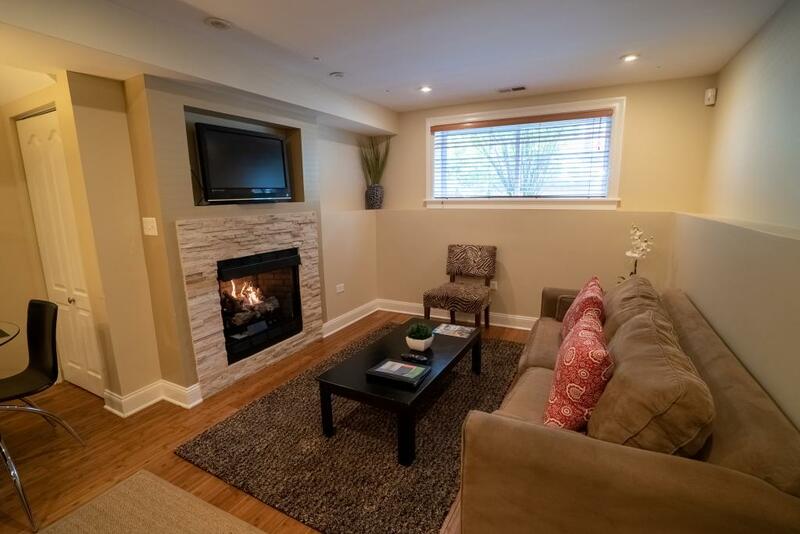 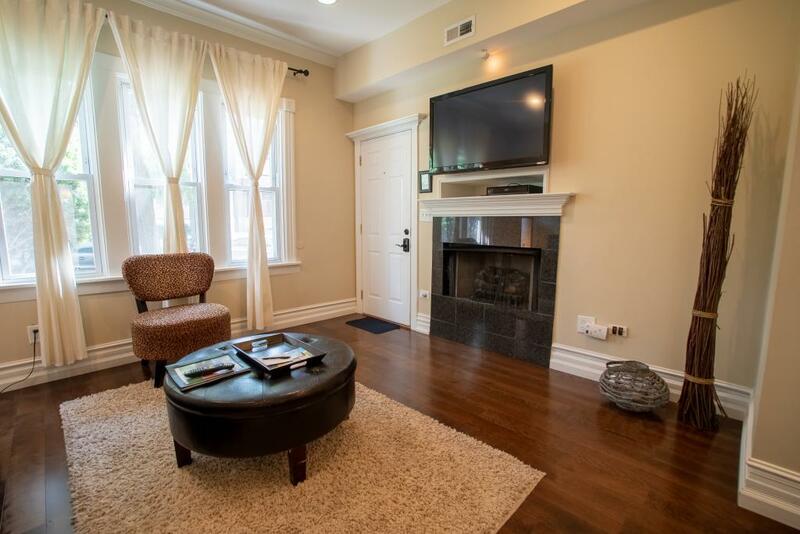 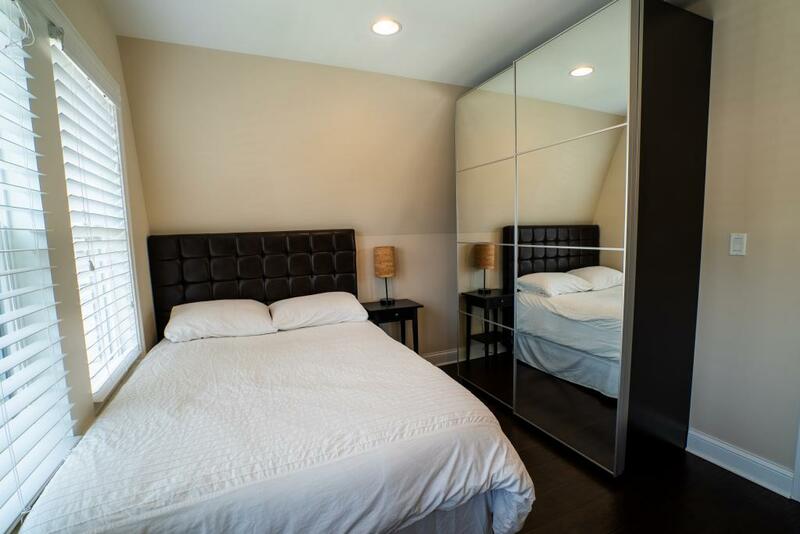 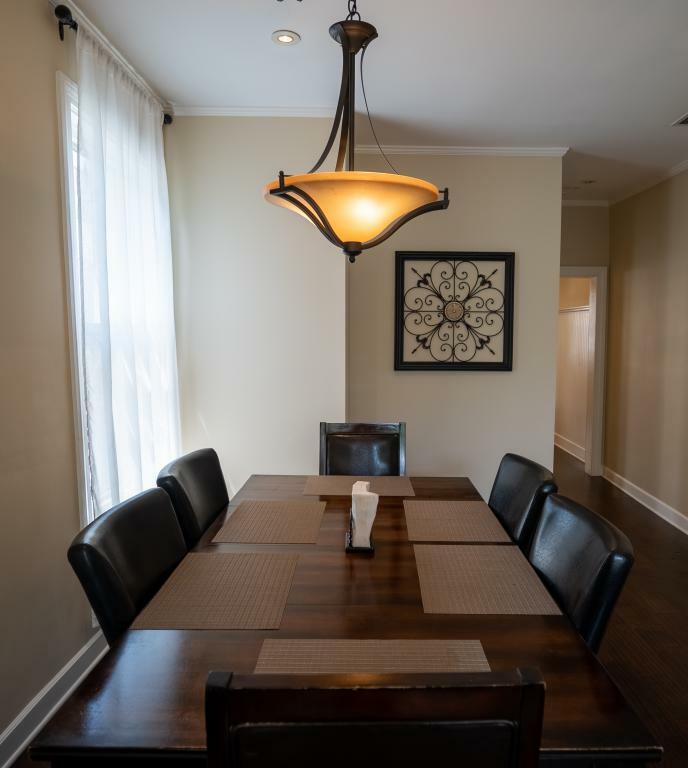 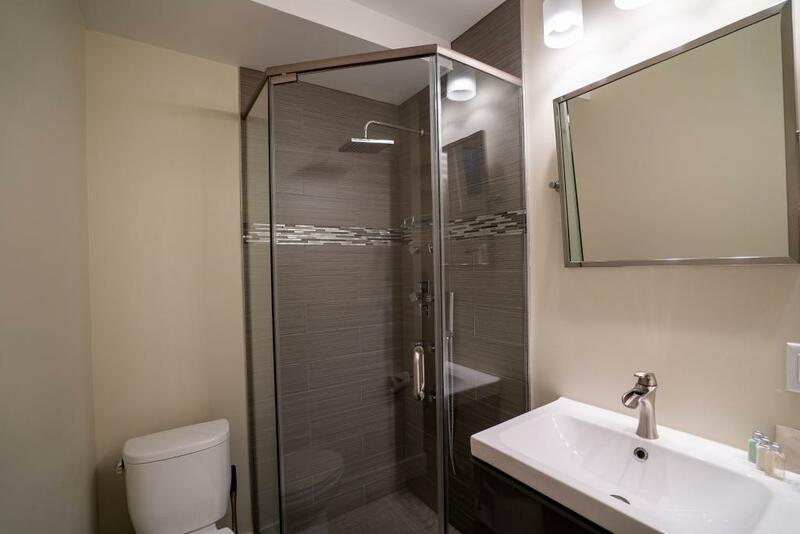 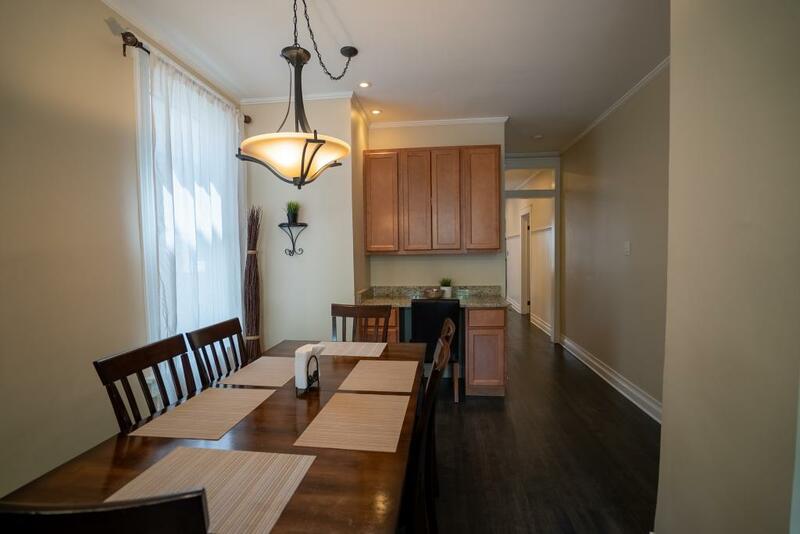 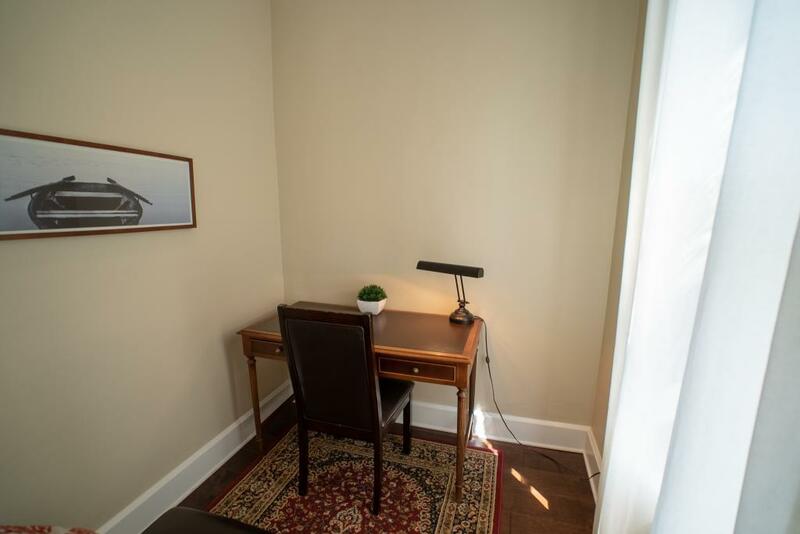 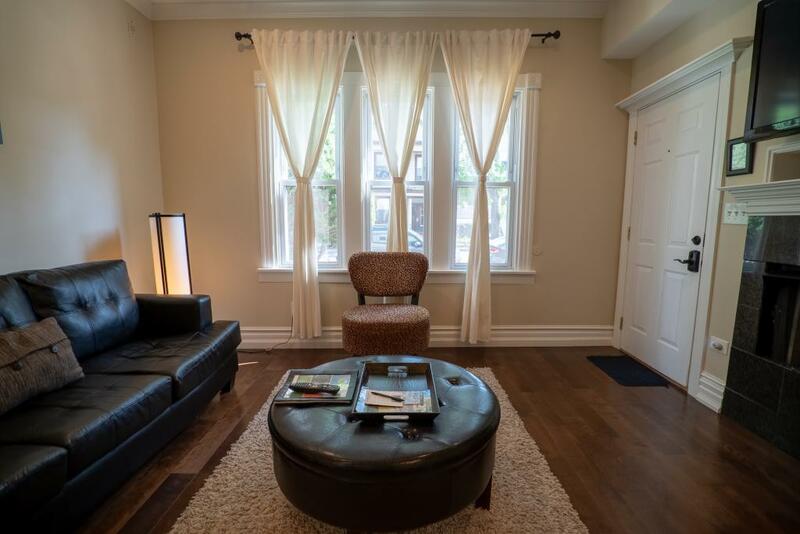 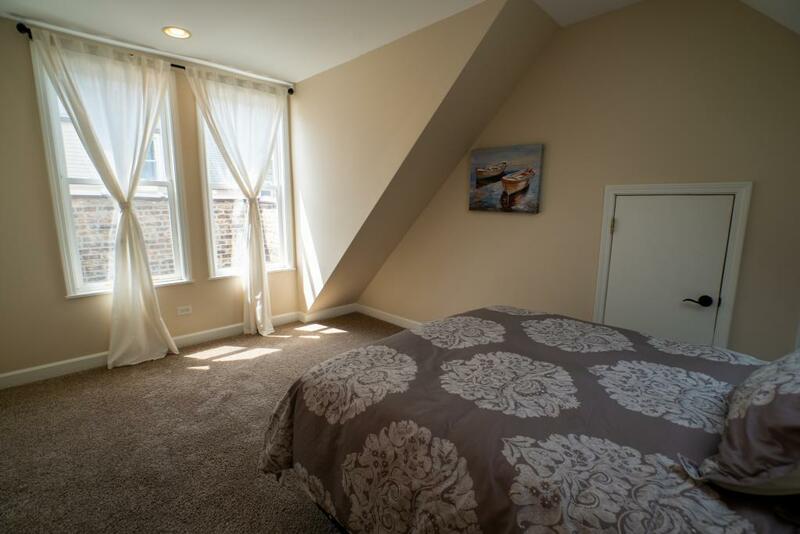 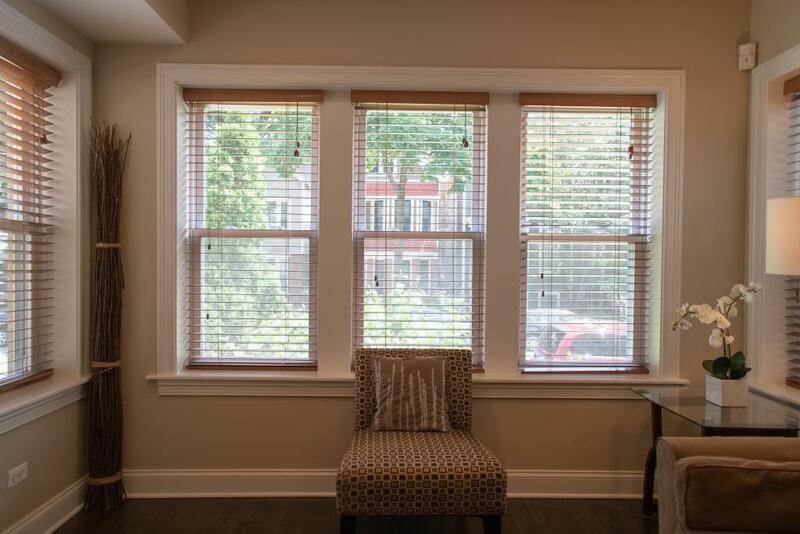 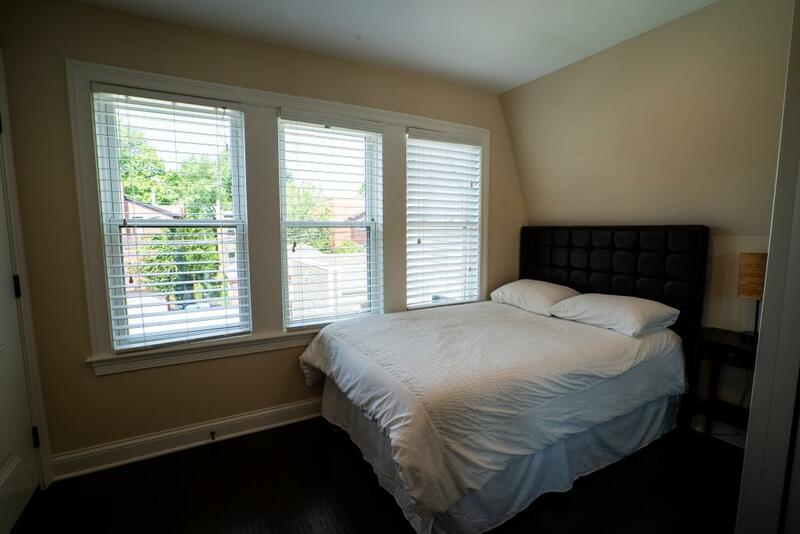 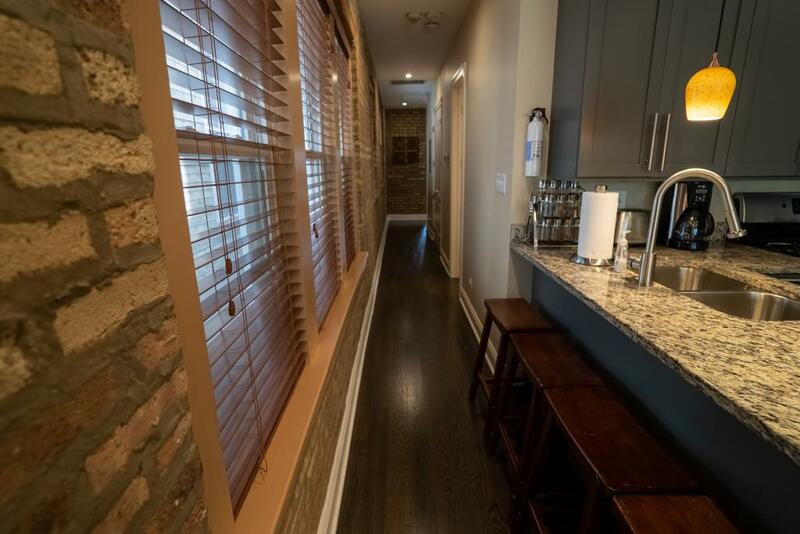 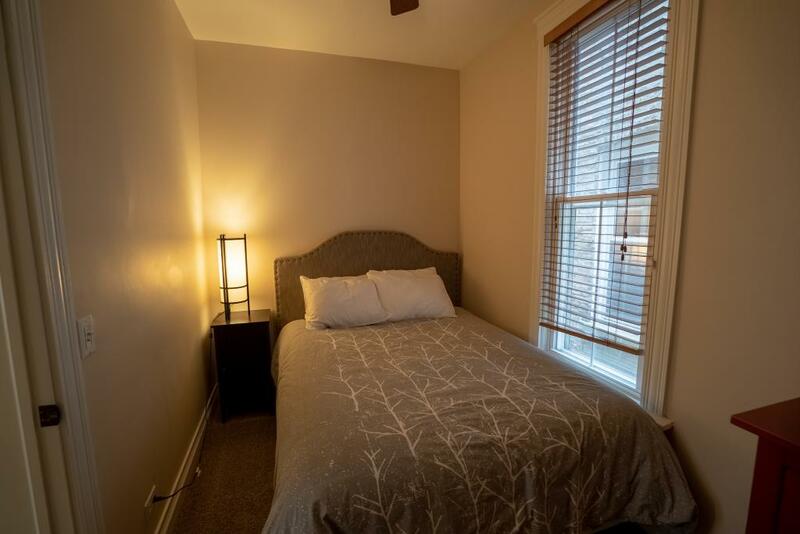 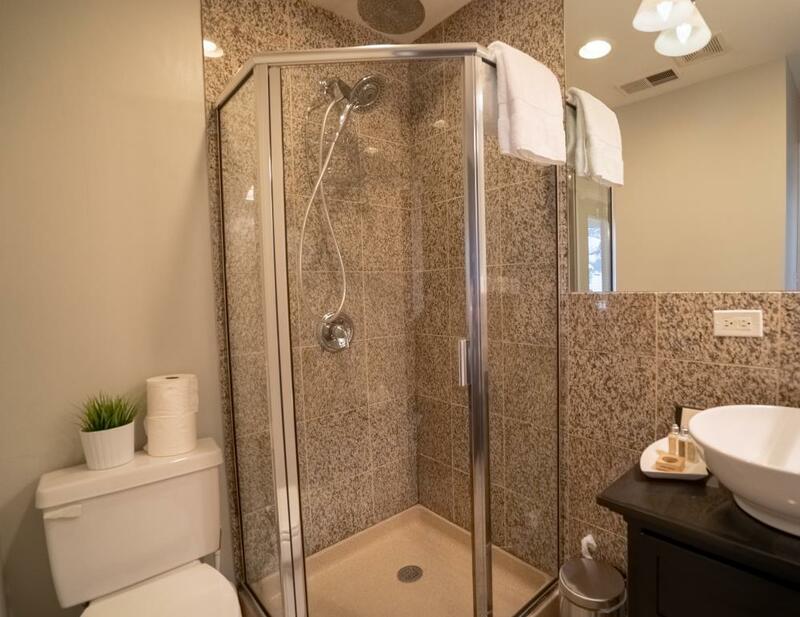 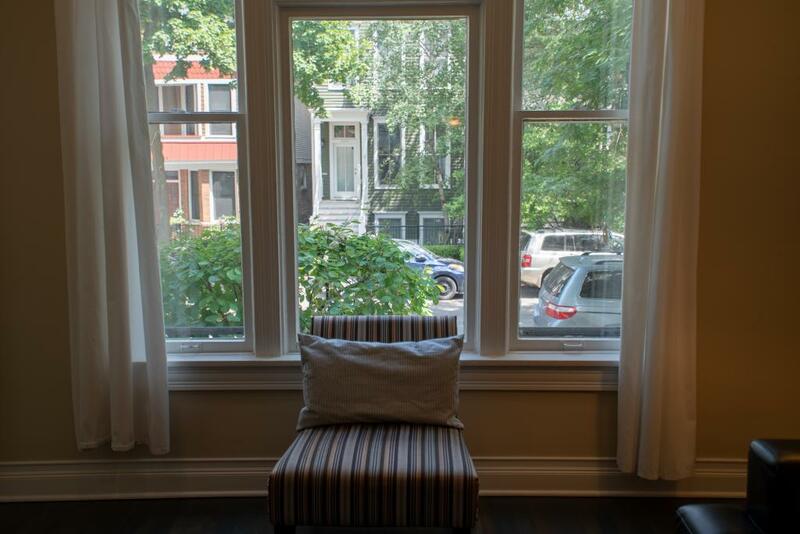 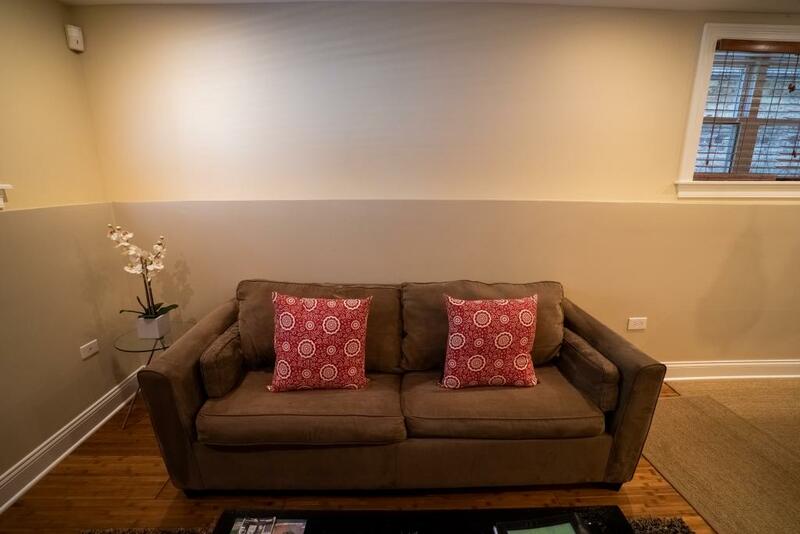 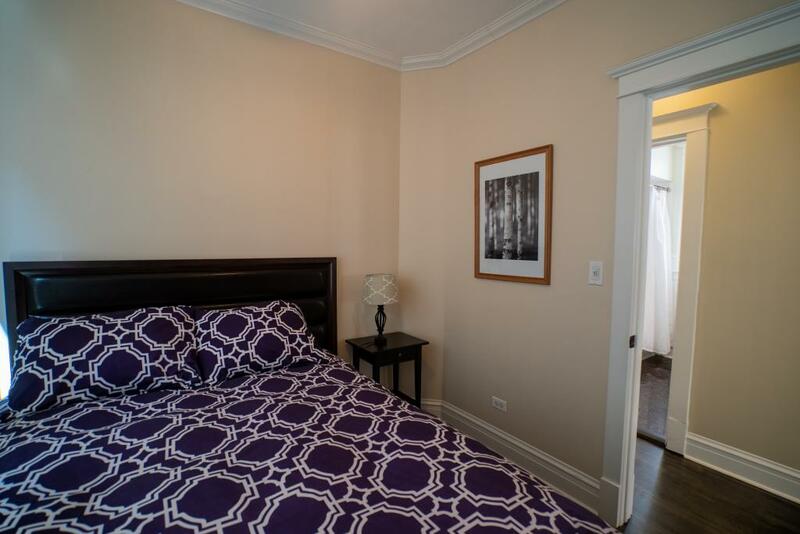 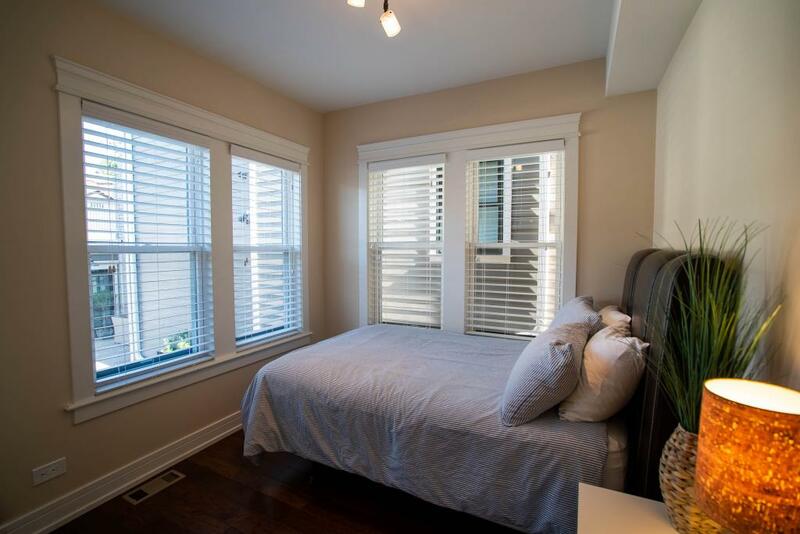 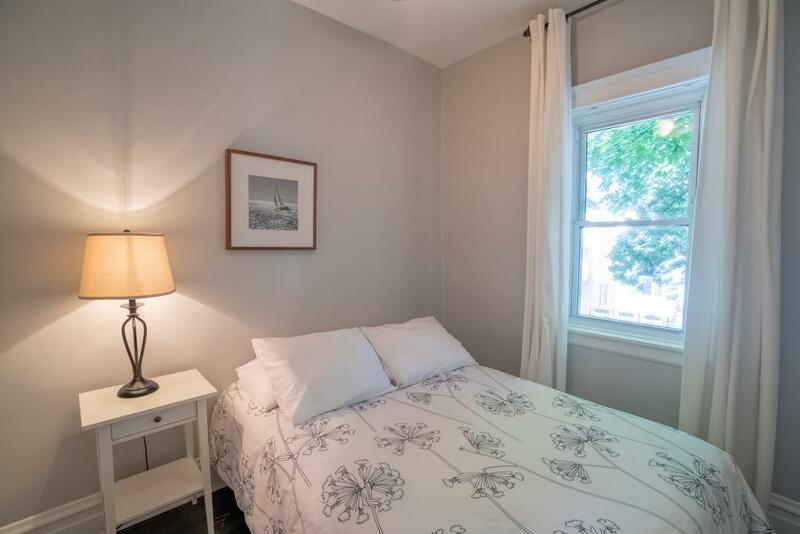 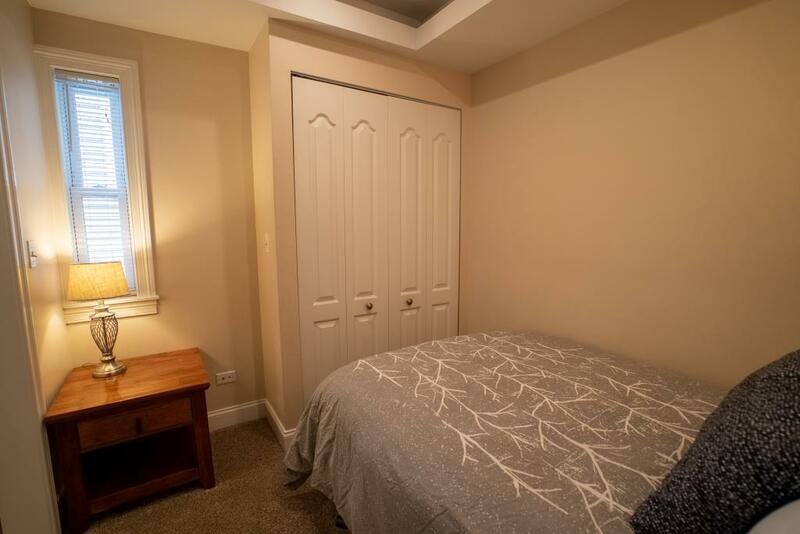 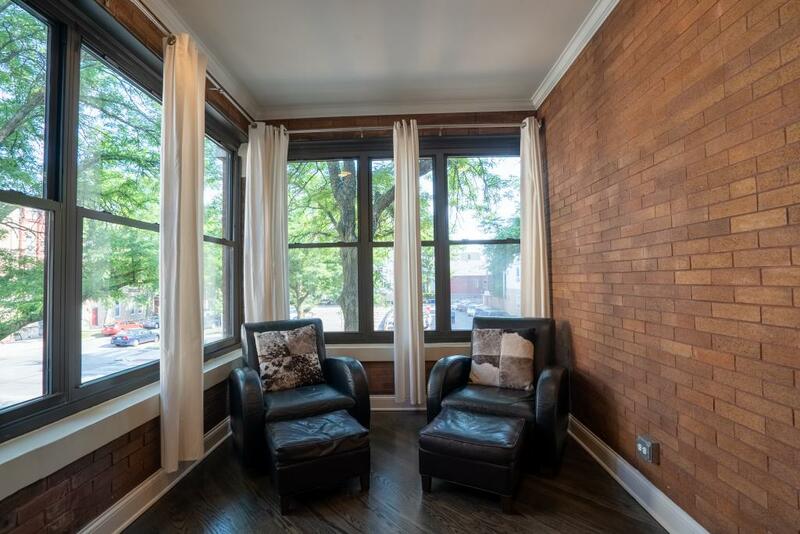 Hamilton #1 is a first floor, newly renovated apartment, fully furnished and tastefully decorated located on Hamilton & Addison. In the kitchen you will find stocked shelves with kitchenware along with with stainless steel appliances, coffee pot, complimentary coffee, tea & sugar. In the bedrooms you will find custom made beds with an independent spring system, memory foam pad, 400-1000 high thread count sheets and down comforters. 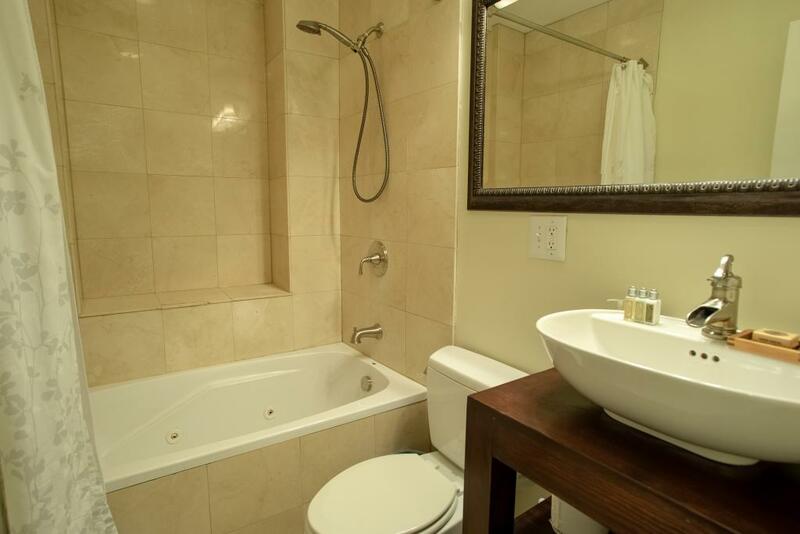 The bathrooms have lush towels and L'Occitane En Provence Verbena amenities. 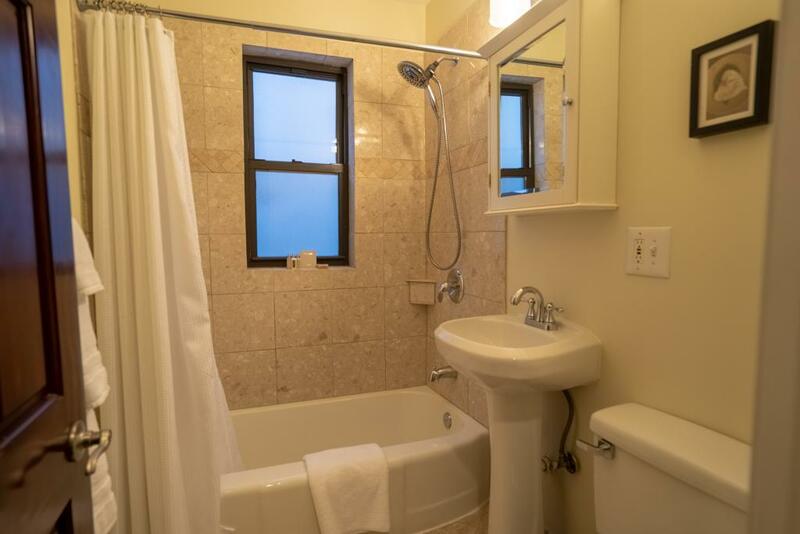 This apartment has a washer and dryer inside the apartment. 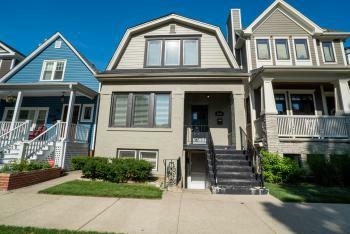 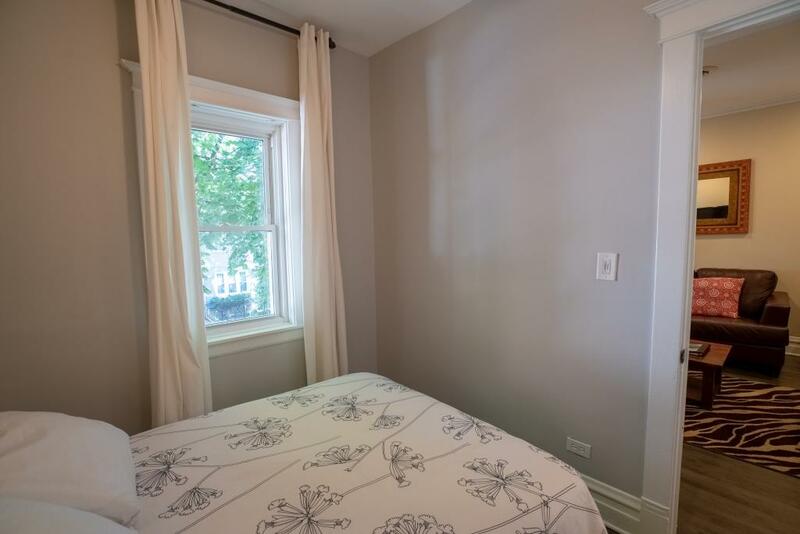 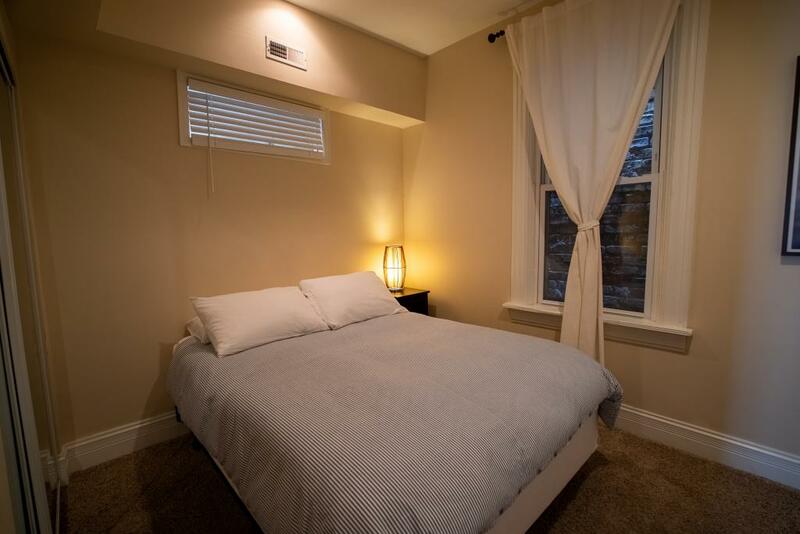 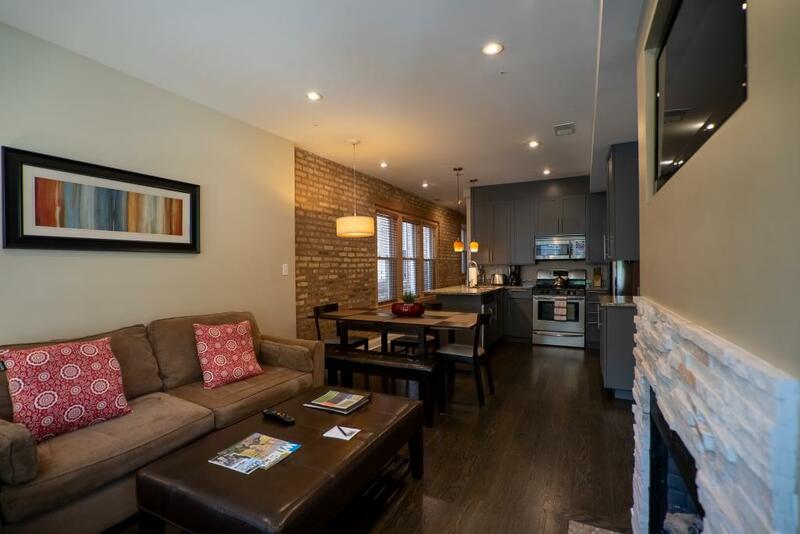 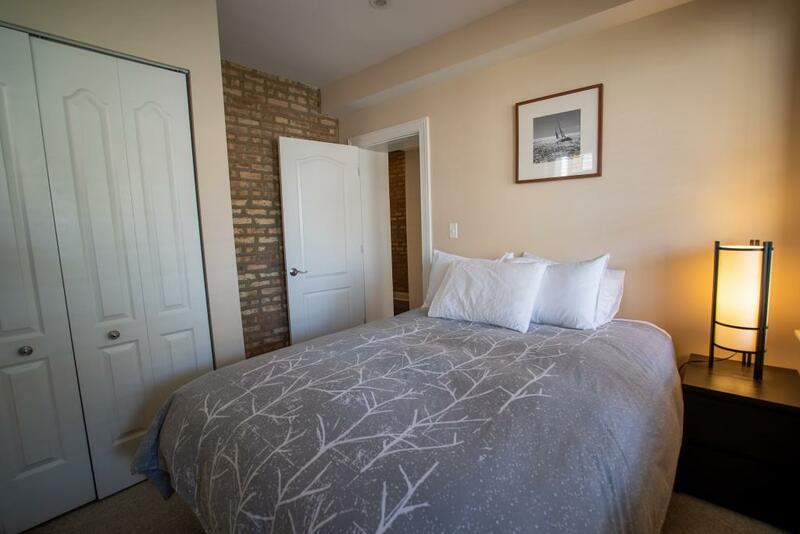 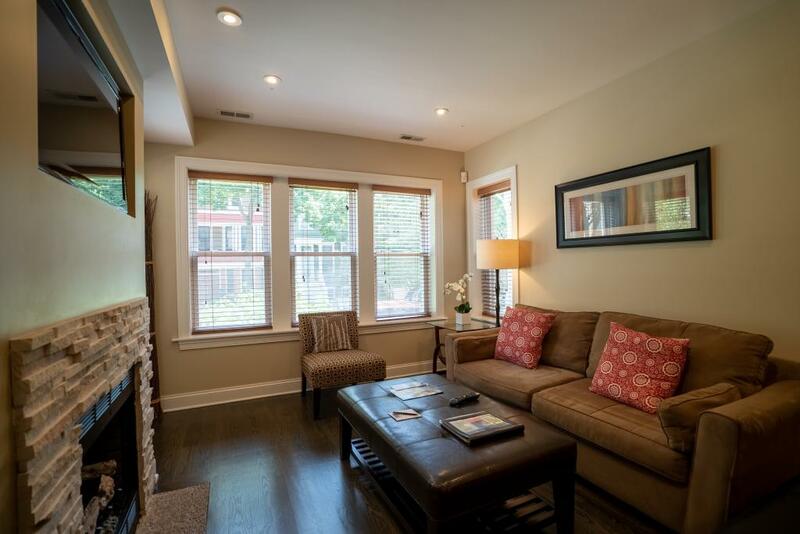 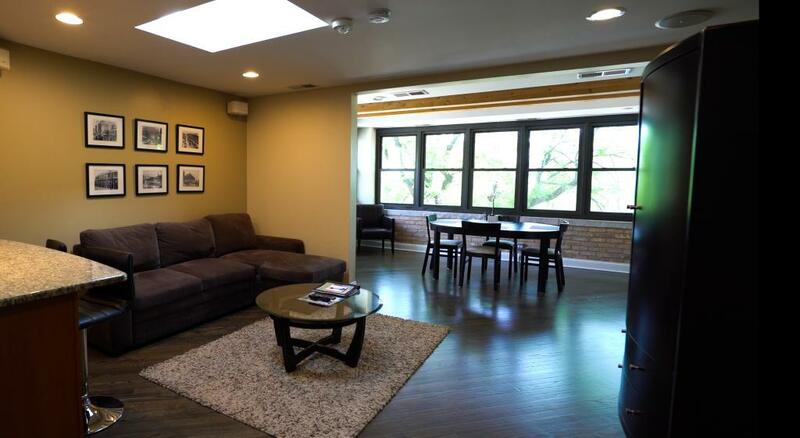 Hamilton #2, located on Hamilton & Addison is newly renovated in Roscoe Village. 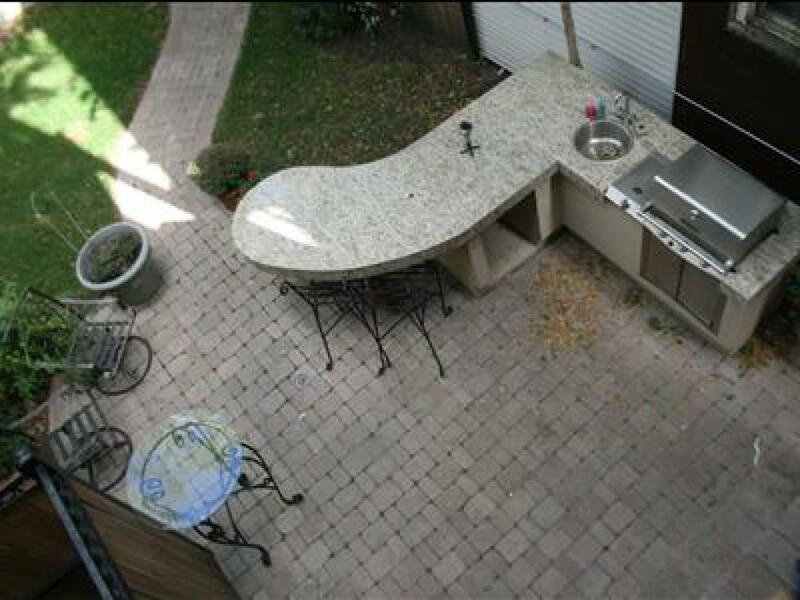 Fully furnished and tastefully decorated. 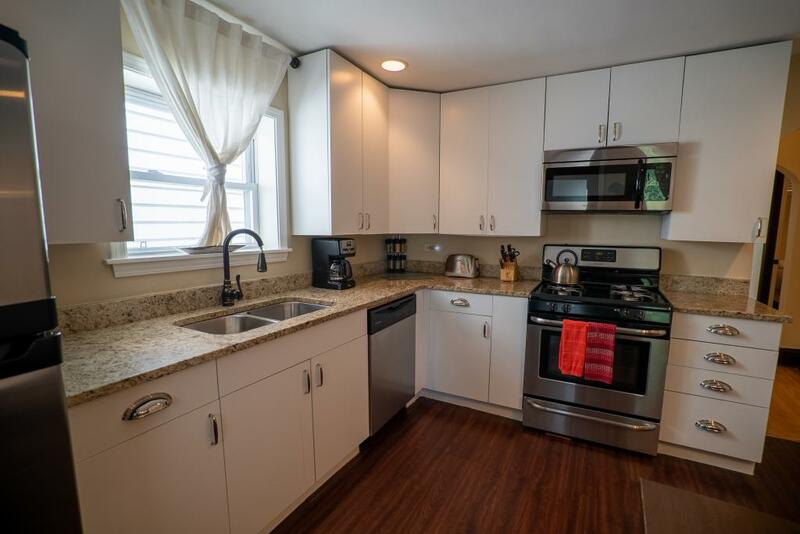 In the kitchen you will find stocked shelves with kitchenware along with with stainless steel appliances, coffee pot, complimentary coffee, tea & sugar. 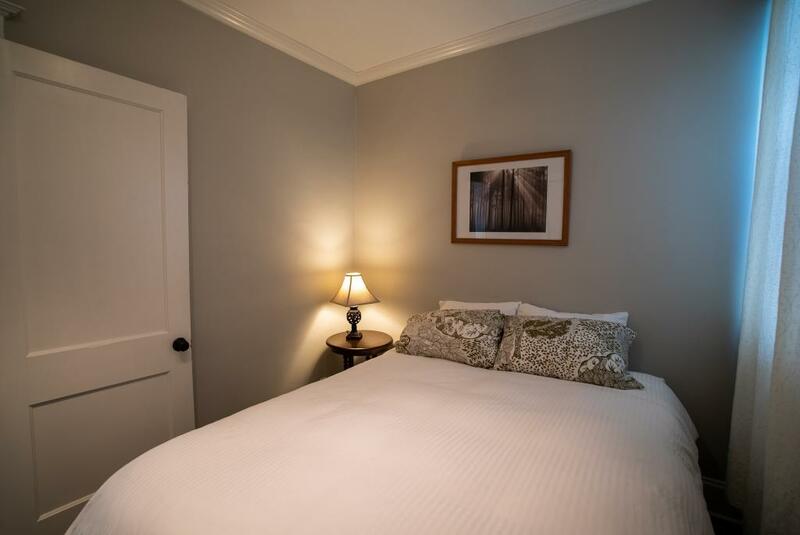 In the bedrooms you will find custom made beds with an independent spring system, memory foam pad, 400-1000 high thread count sheets and down comforters. 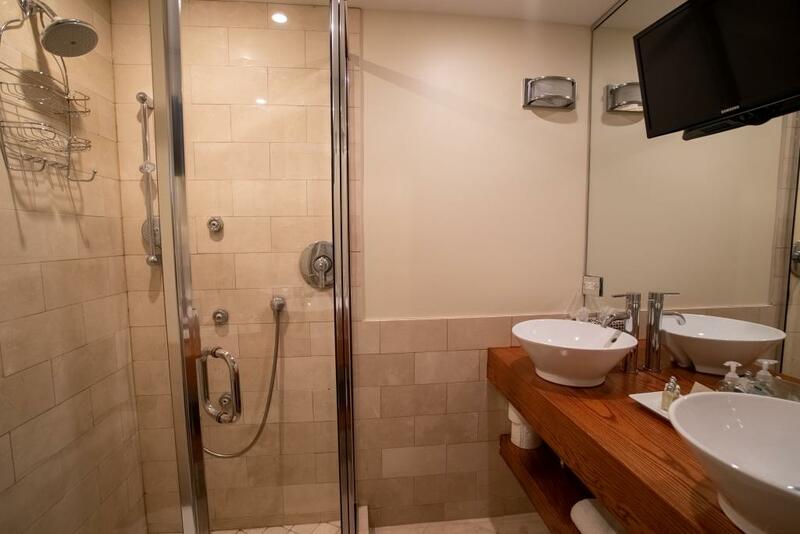 The bathrooms have lush towels and L'Occitane En Provence Verbena amenities. 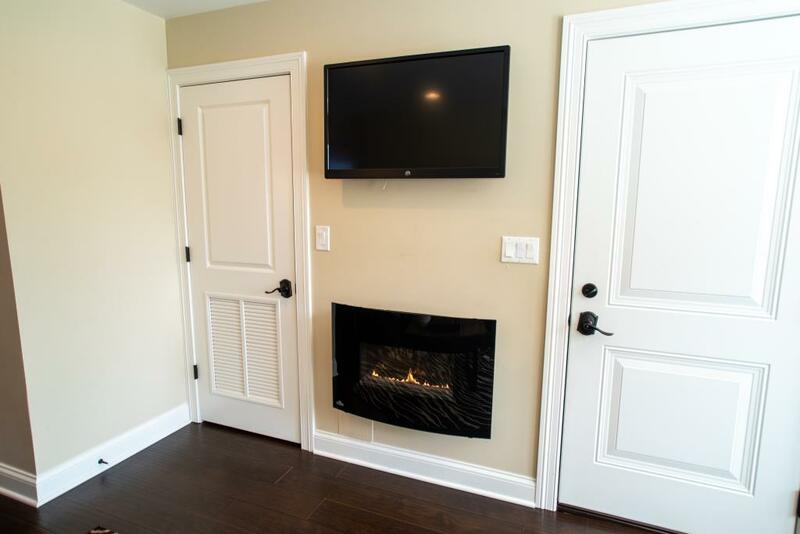 This apartment has a washer and dryer inside the unit. 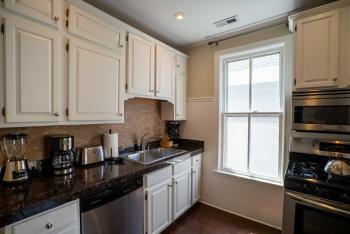 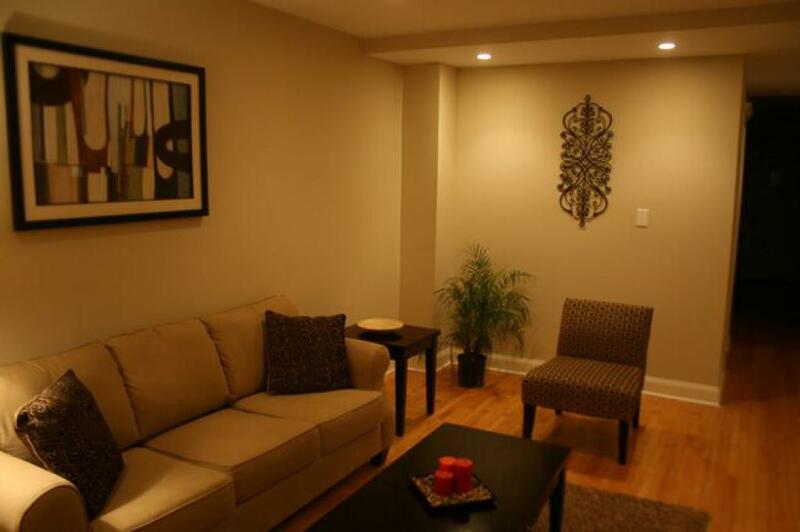 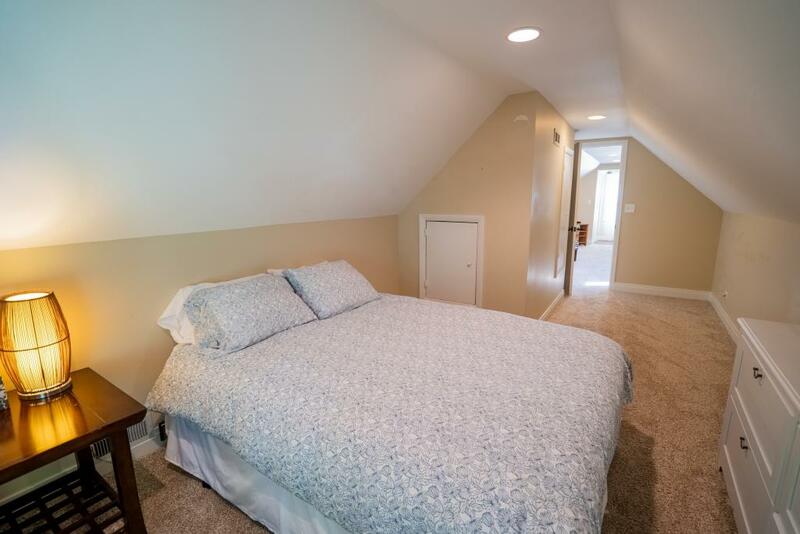 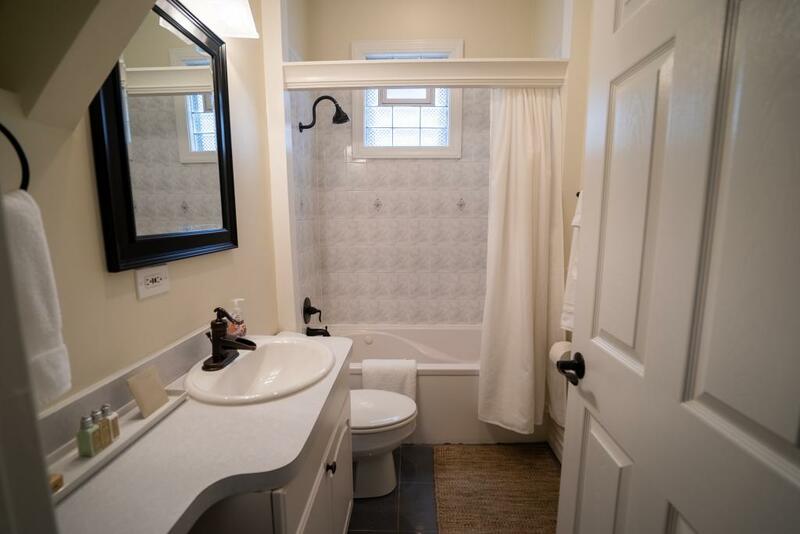 Hamlin #1 is a first floor apartment, fully furnished and tastefully decorated. 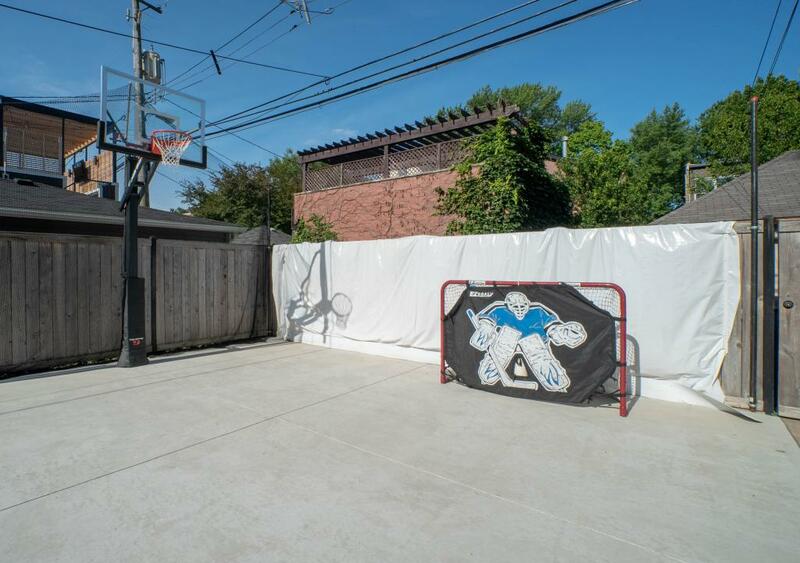 Located on Leavitt & Barry in Roscoe Village. 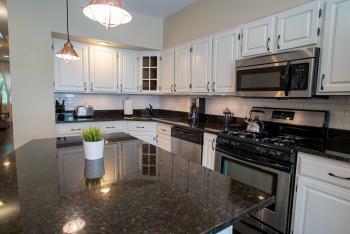 In the kitchen you will find stocked shelves with kitchenware along with with stainless steel appliances, coffee pot, complimentary coffee, tea & sugar. 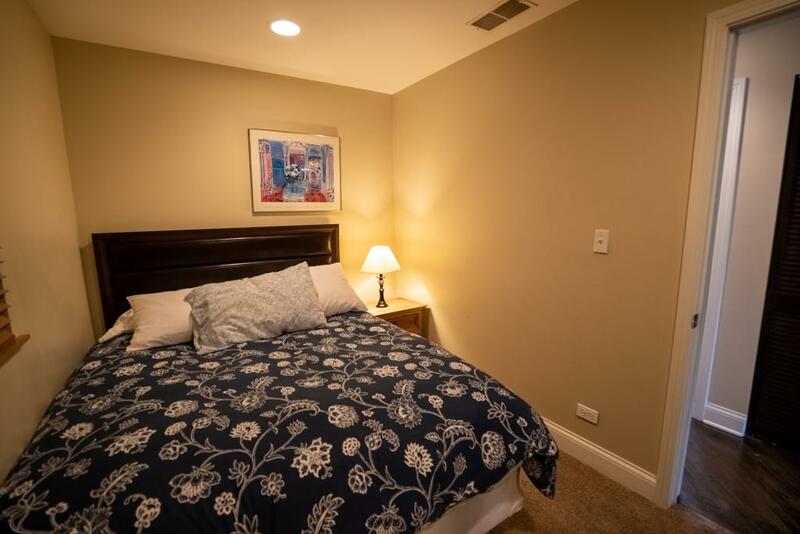 In the bedrooms you will find custom made beds with an independent spring system, memory foam pad, 400-1000 high thread count sheets and down comforters. 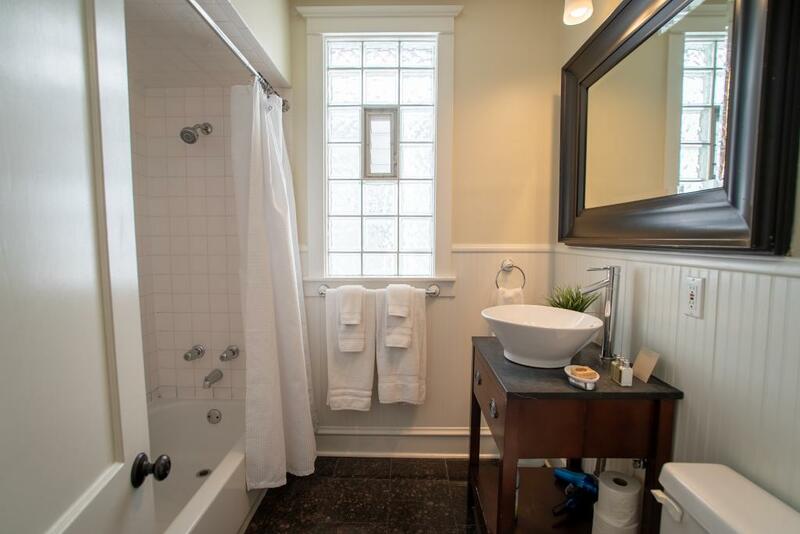 The bathroom has lush towels and L'Occitane En Provence Verbena amenities. 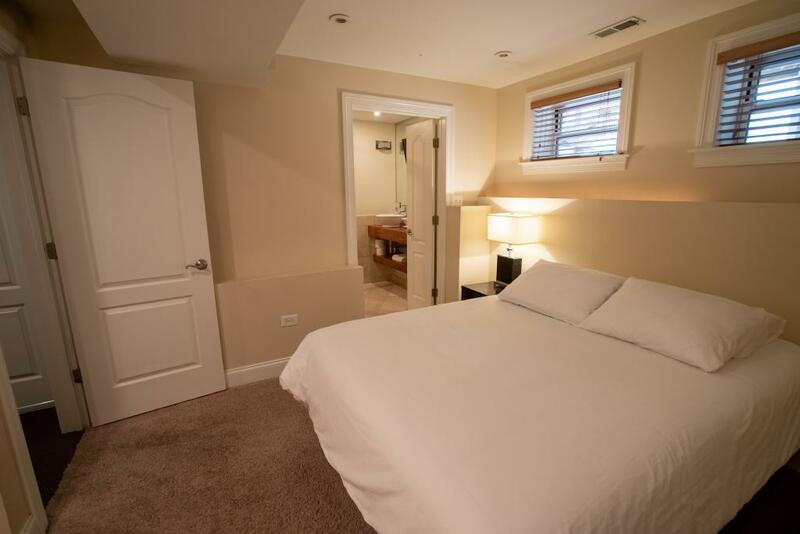 This apartment has a shared washer and dryer in the basement of the building. 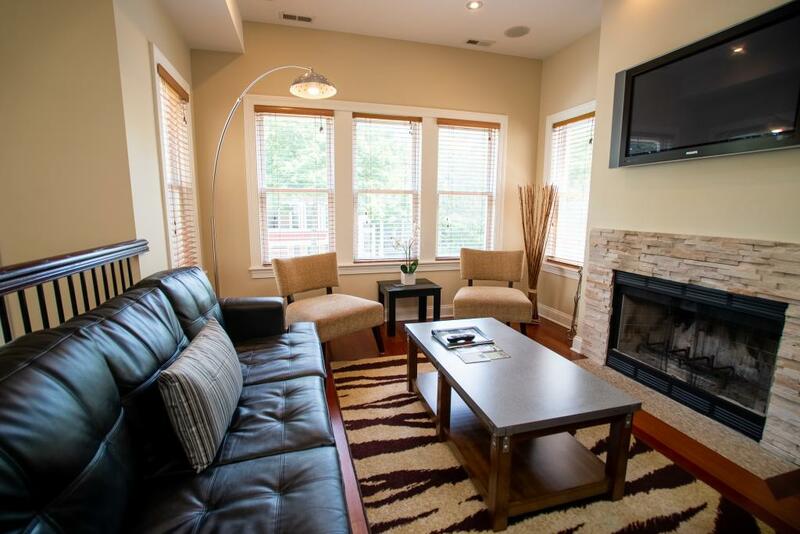 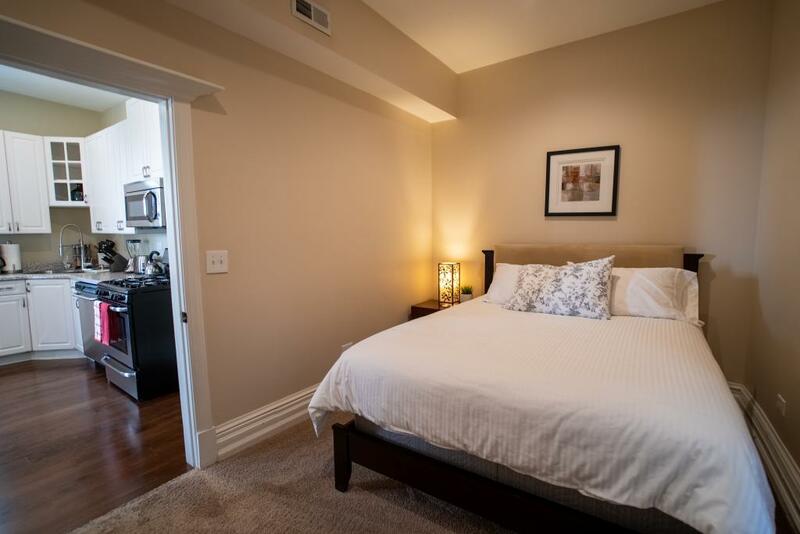 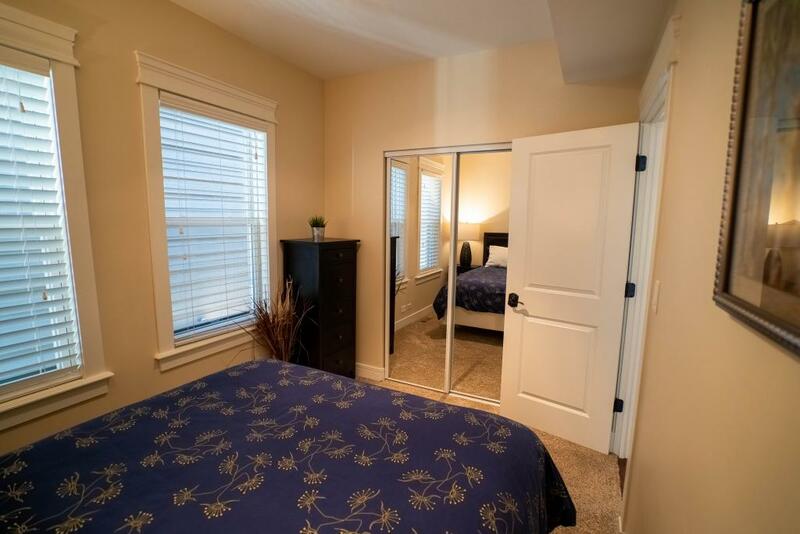 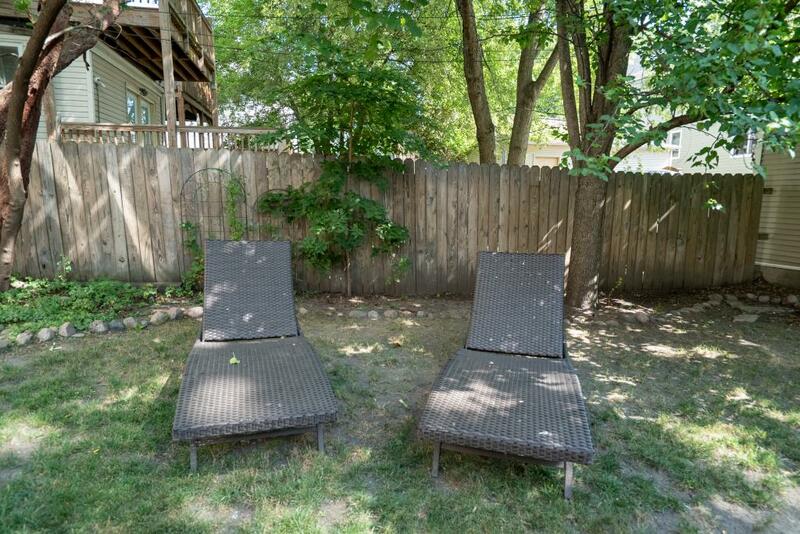 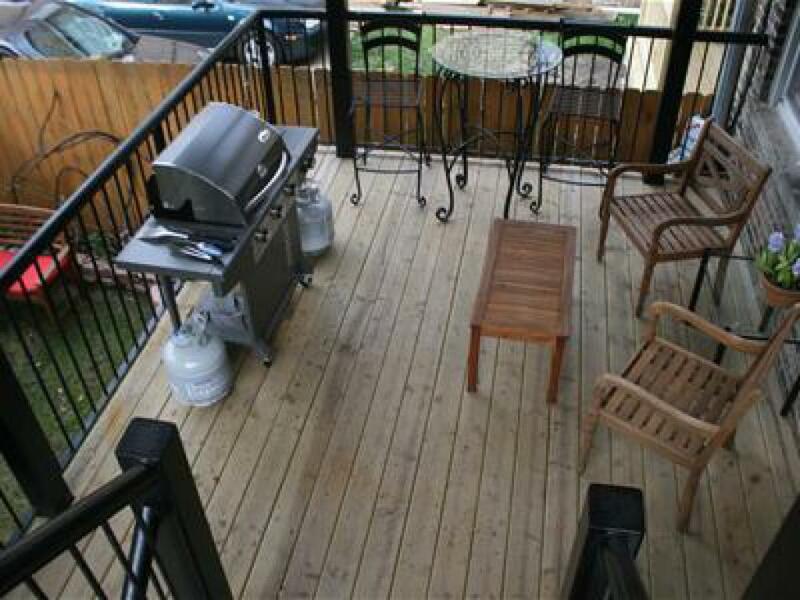 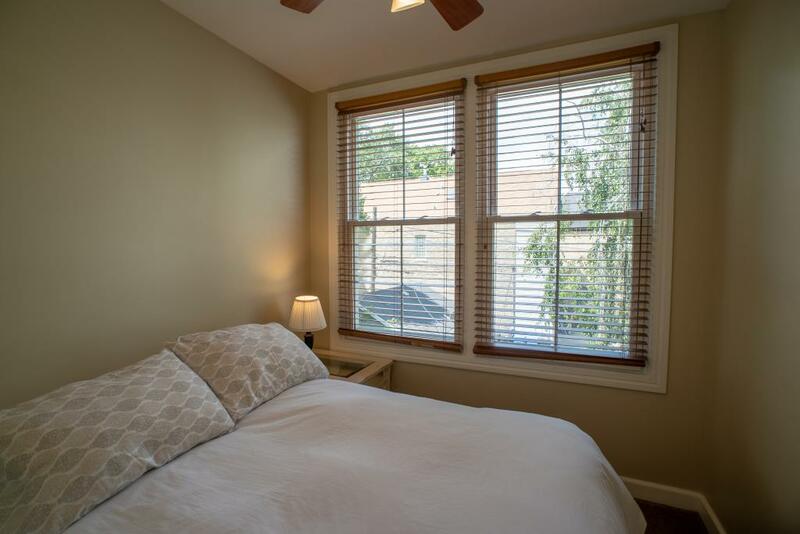 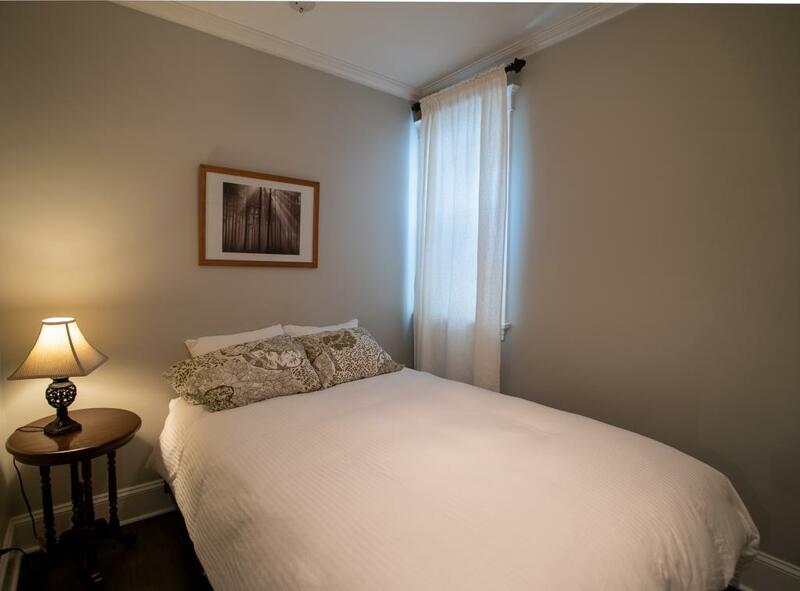 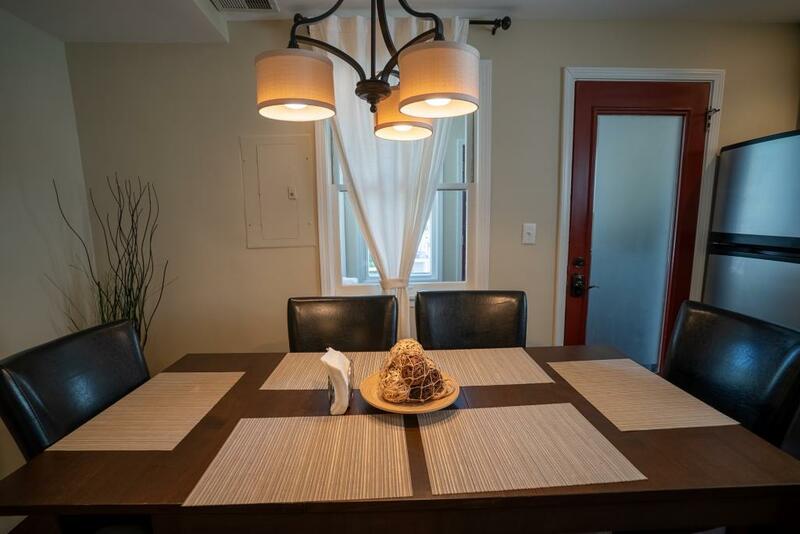 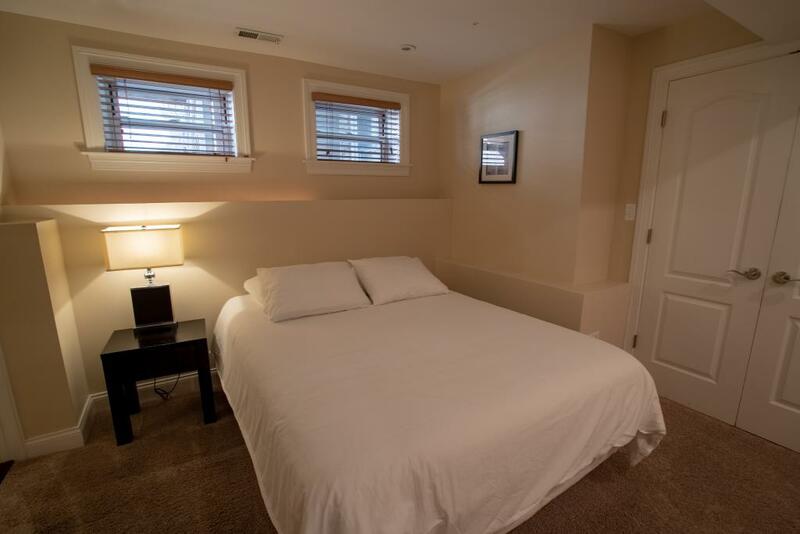 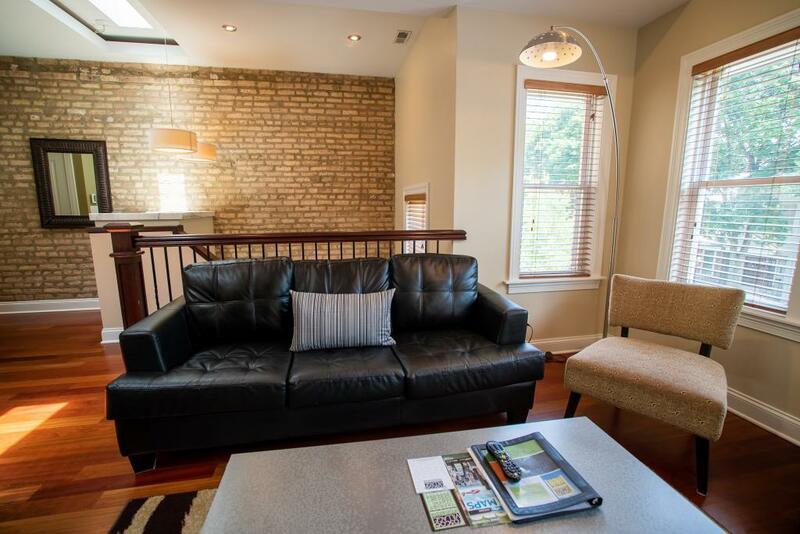 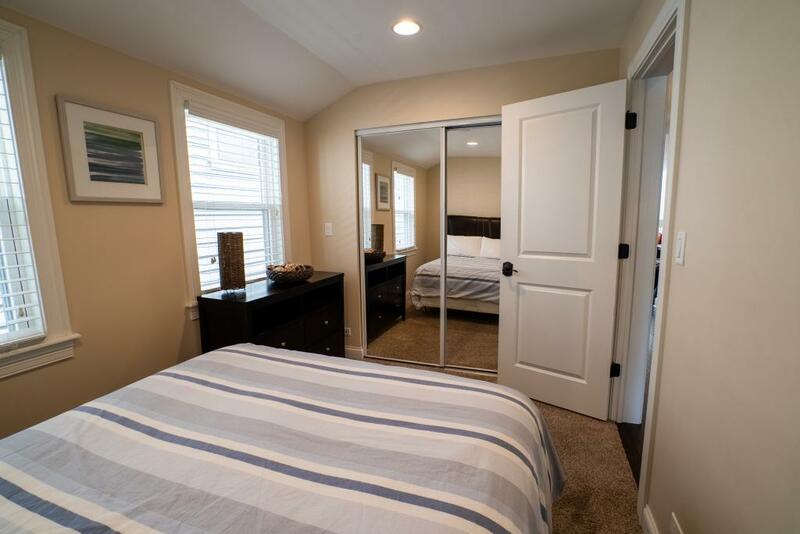 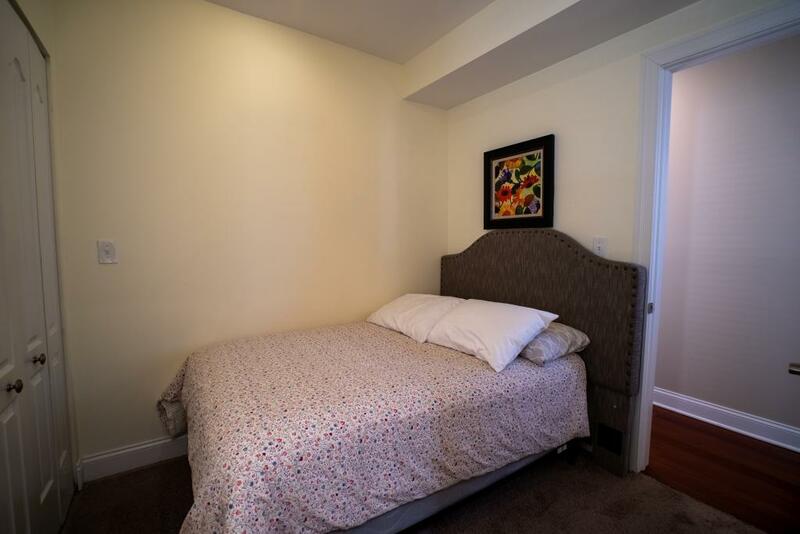 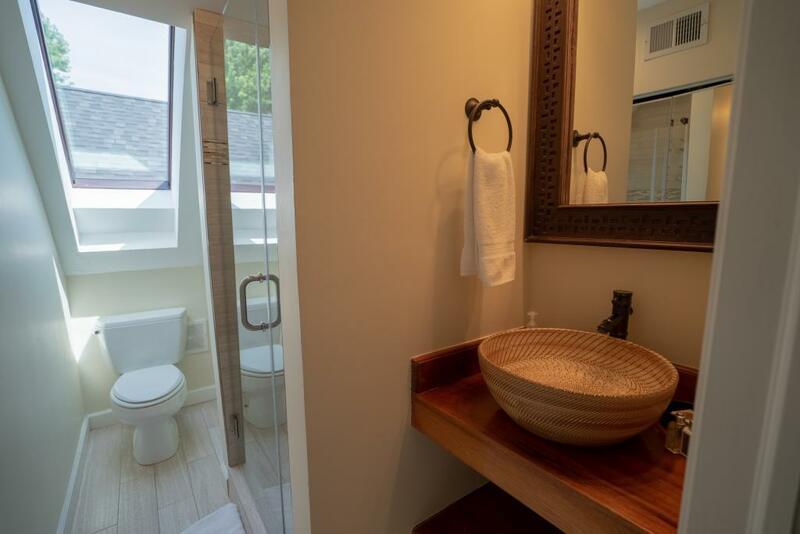 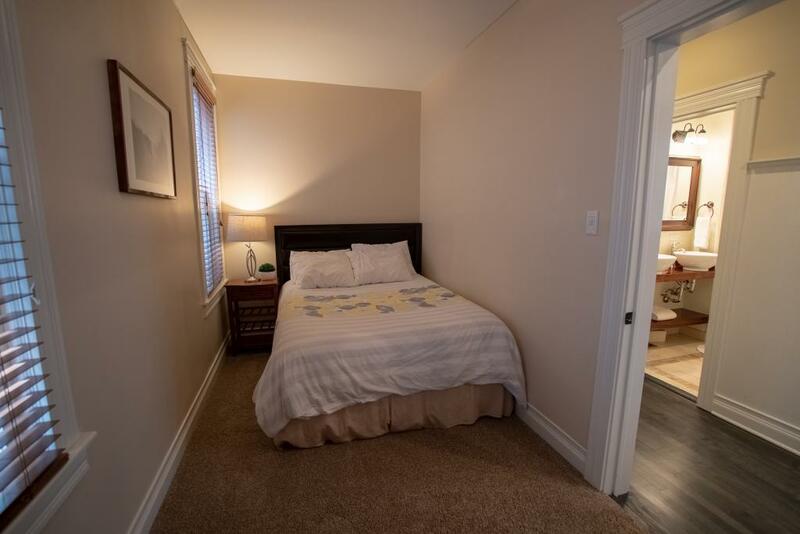 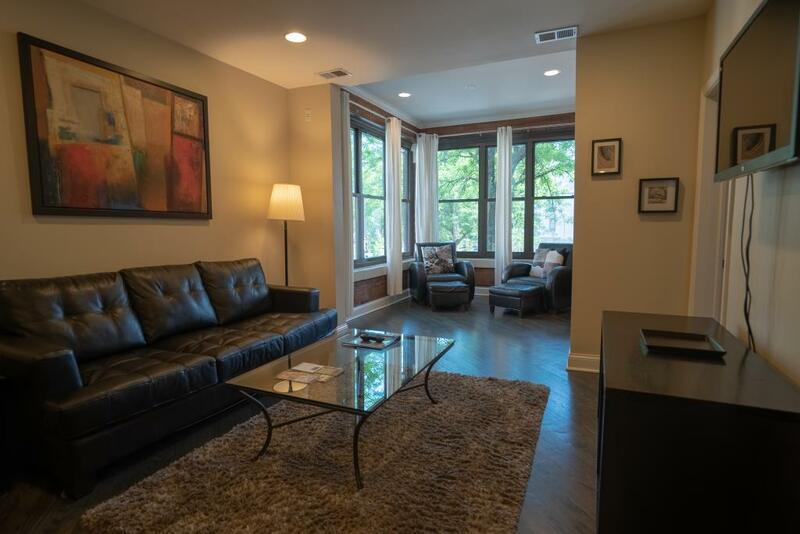 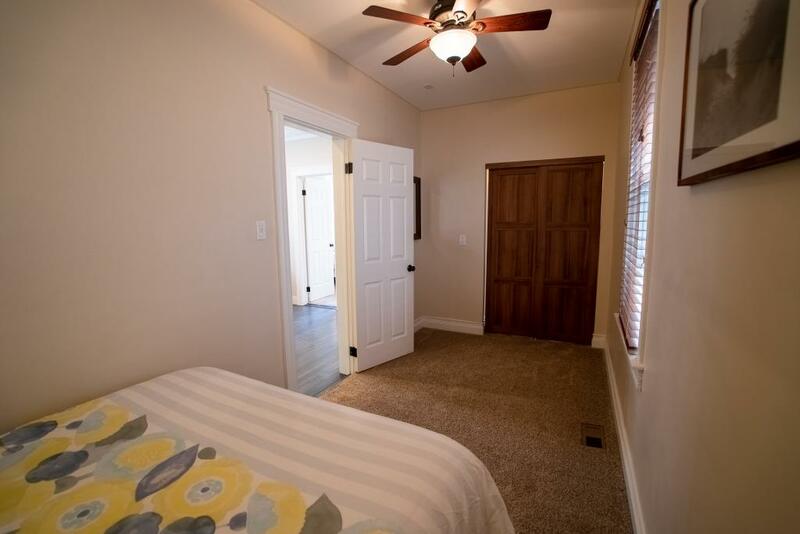 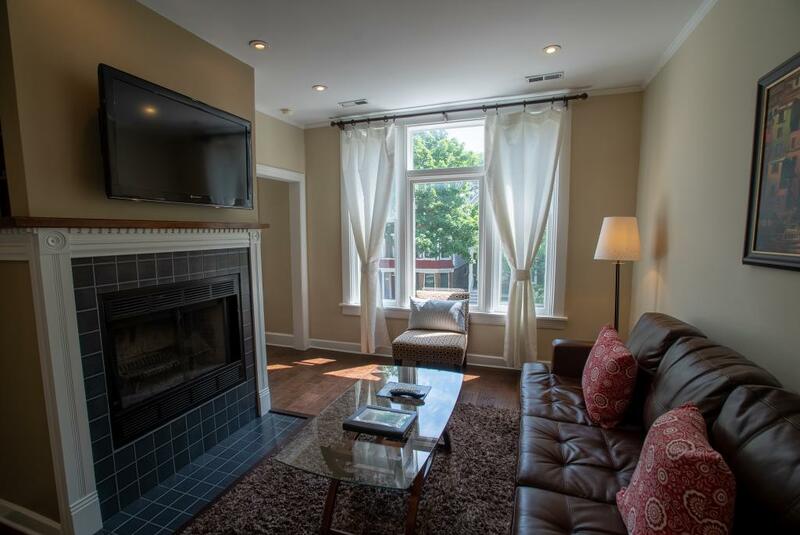 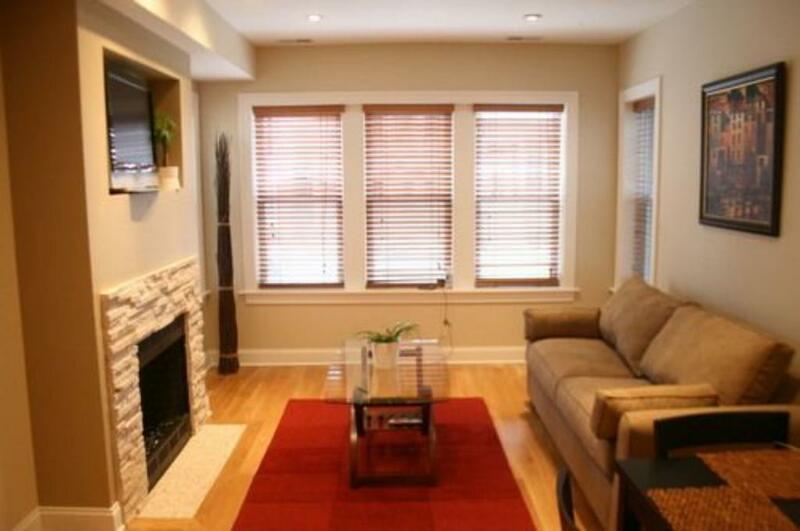 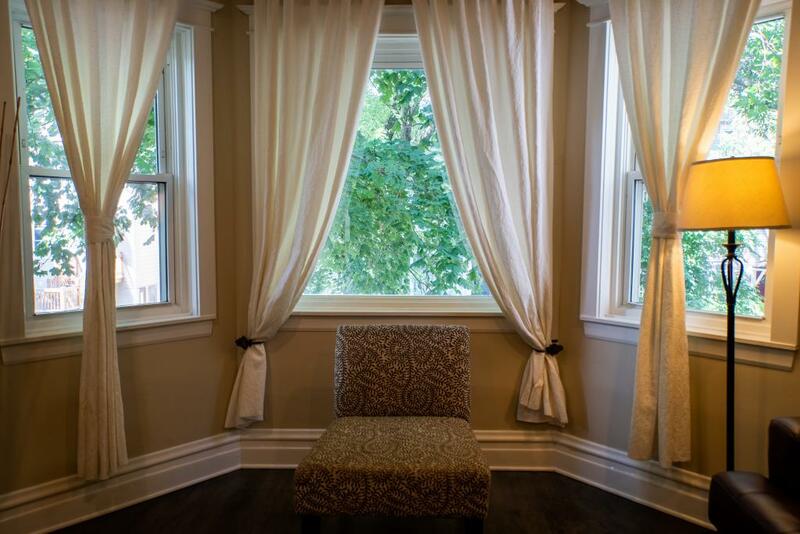 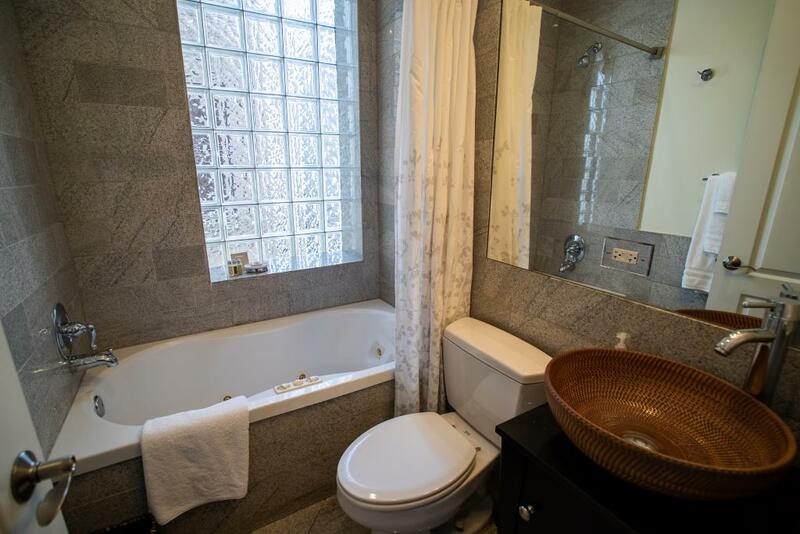 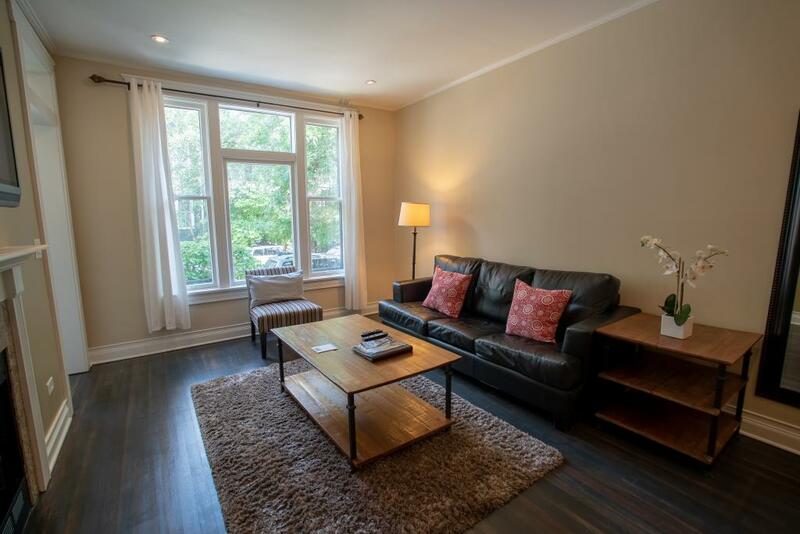 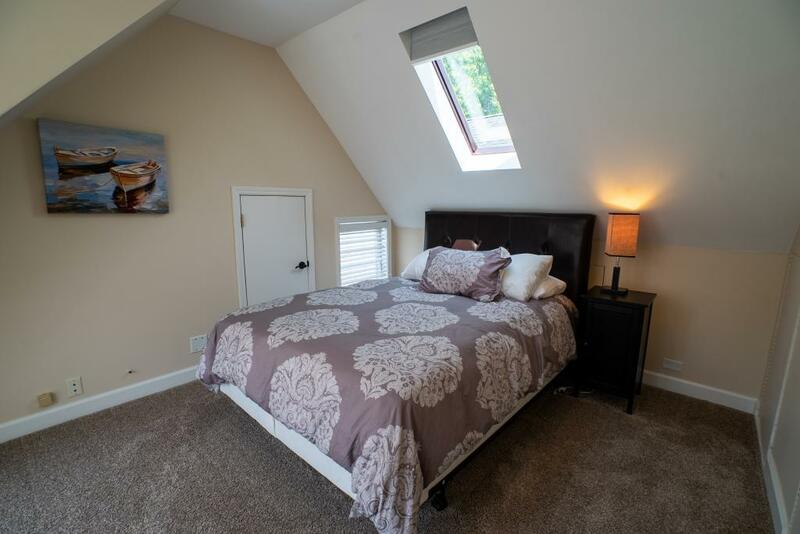 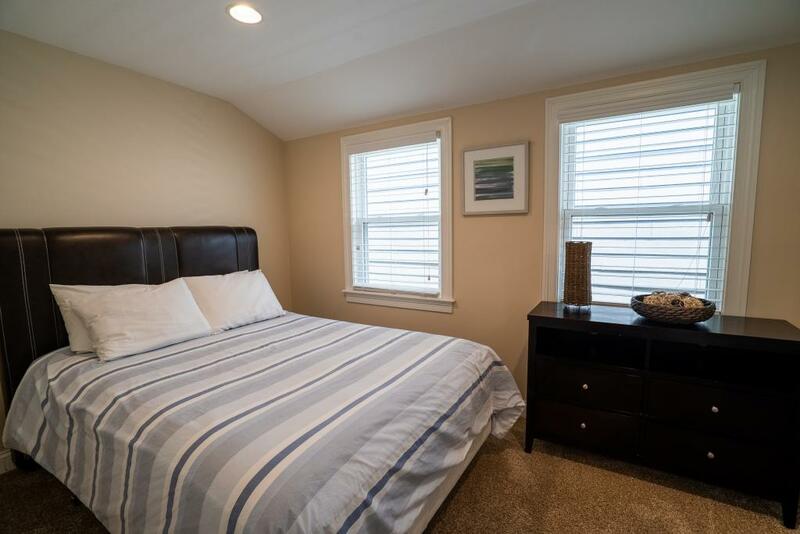 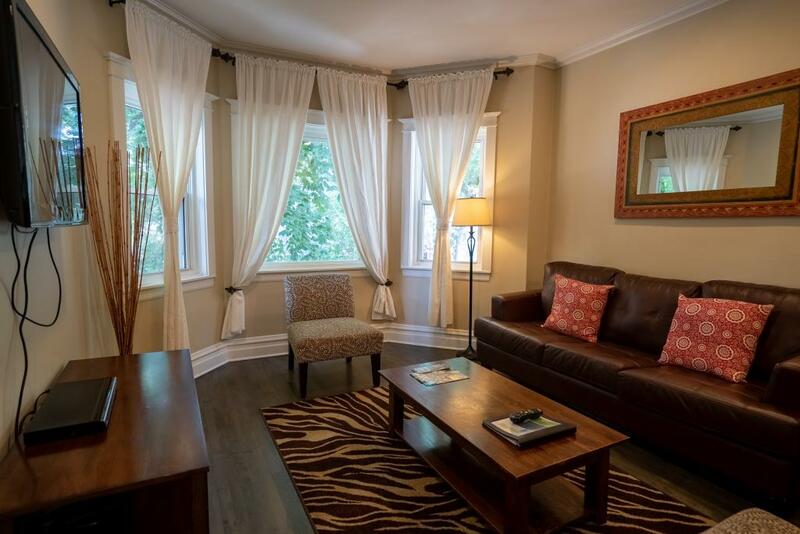 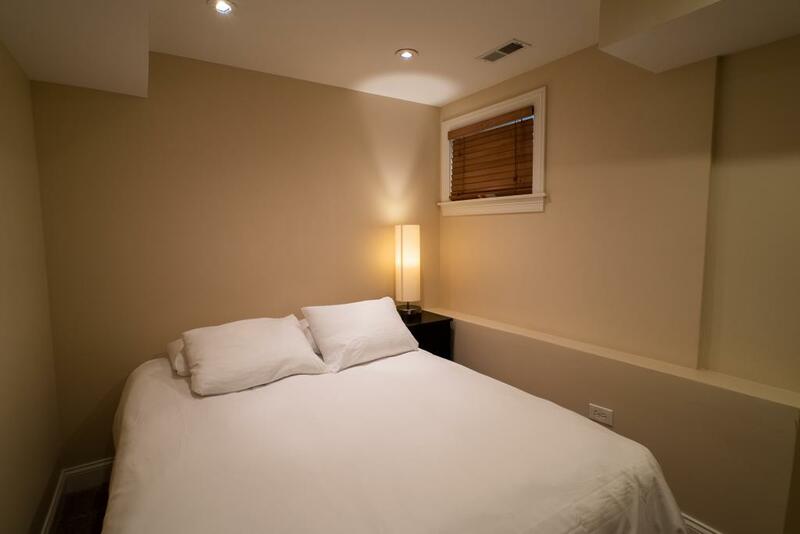 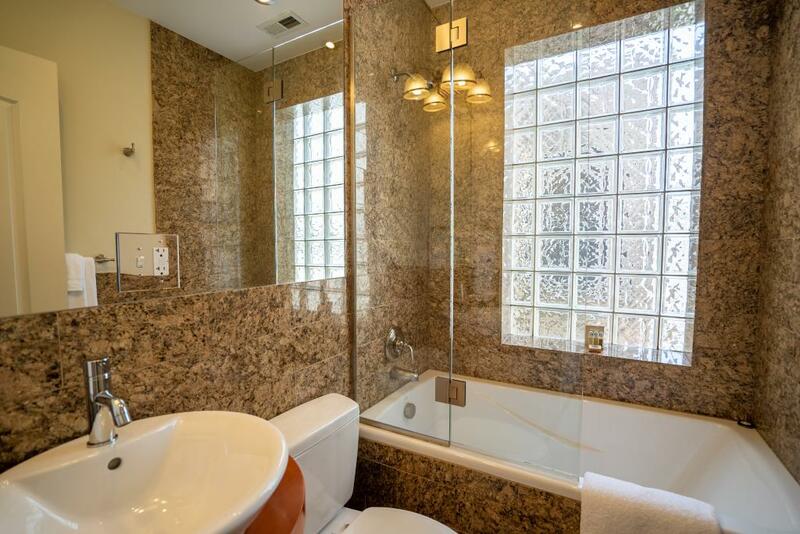 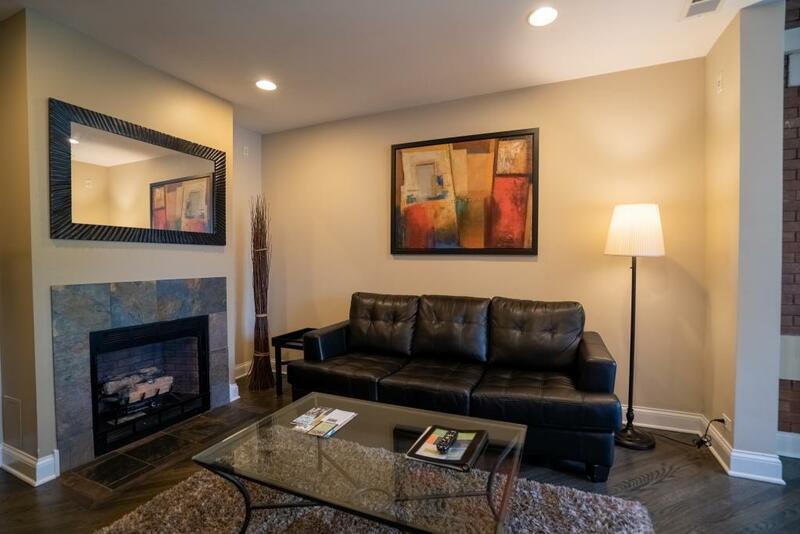 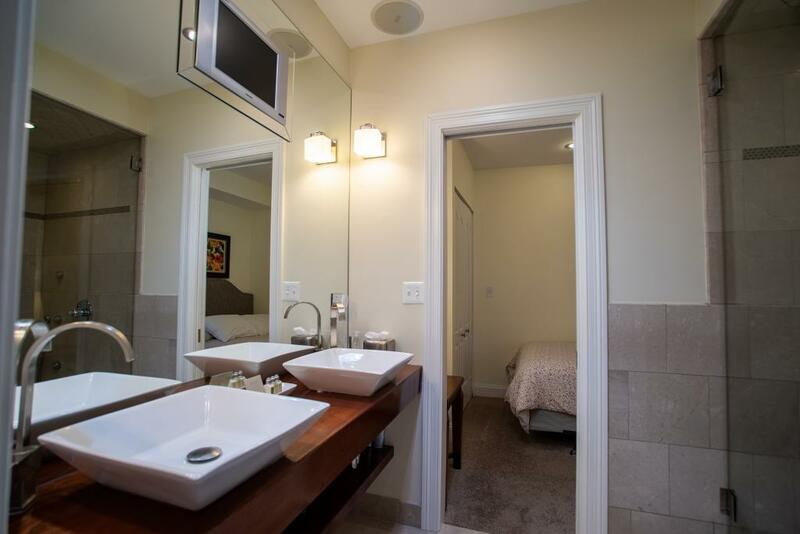 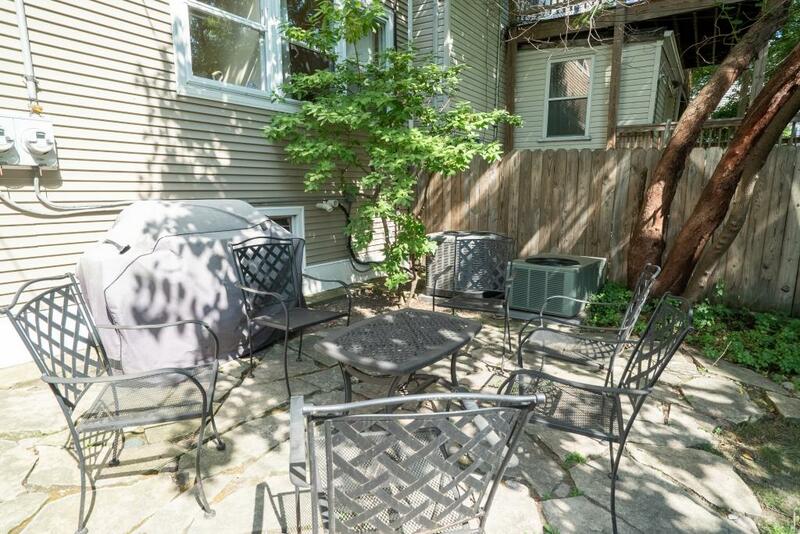 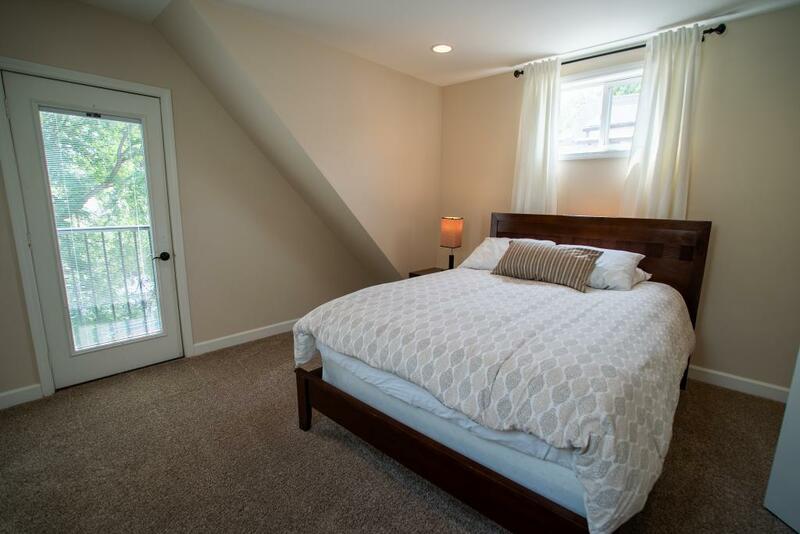 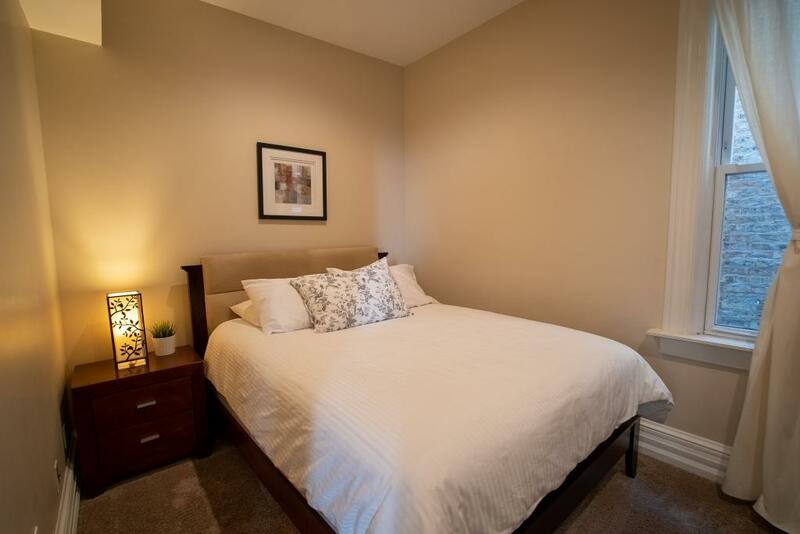 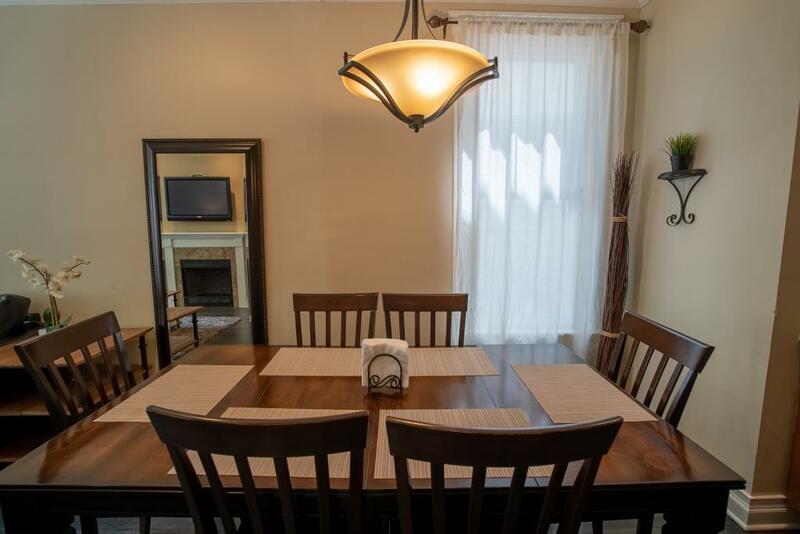 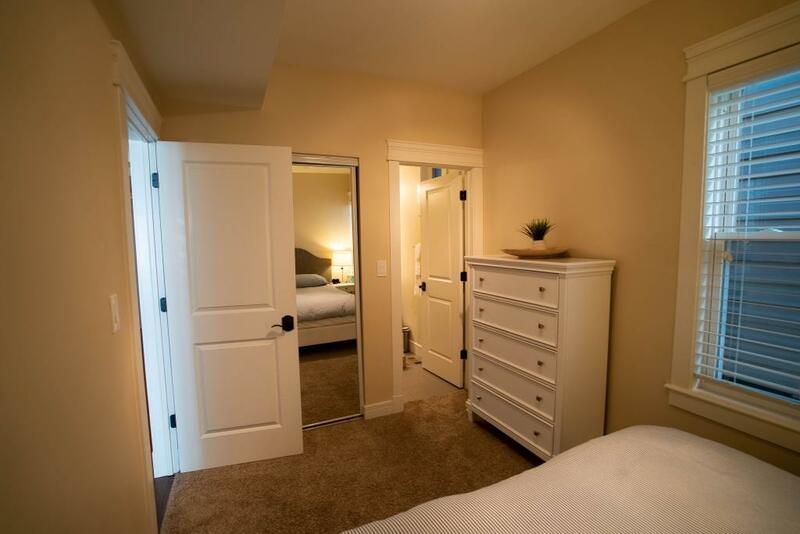 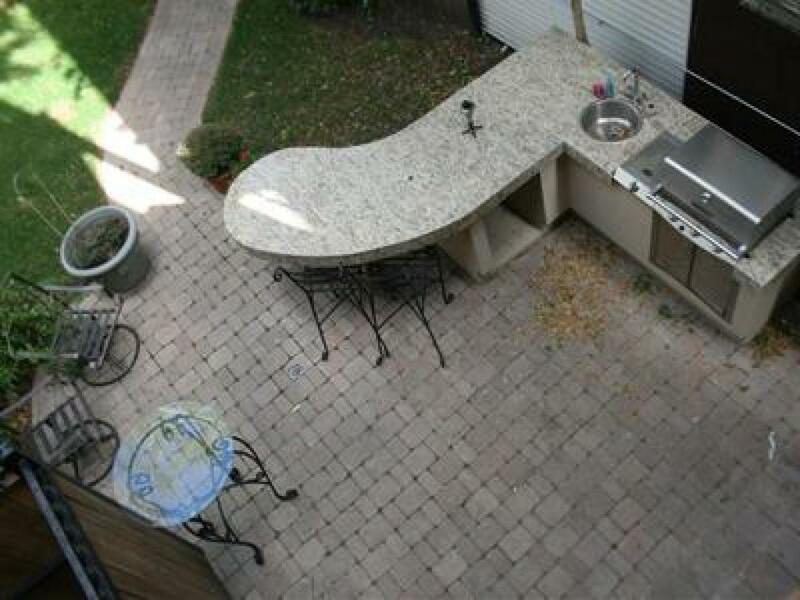 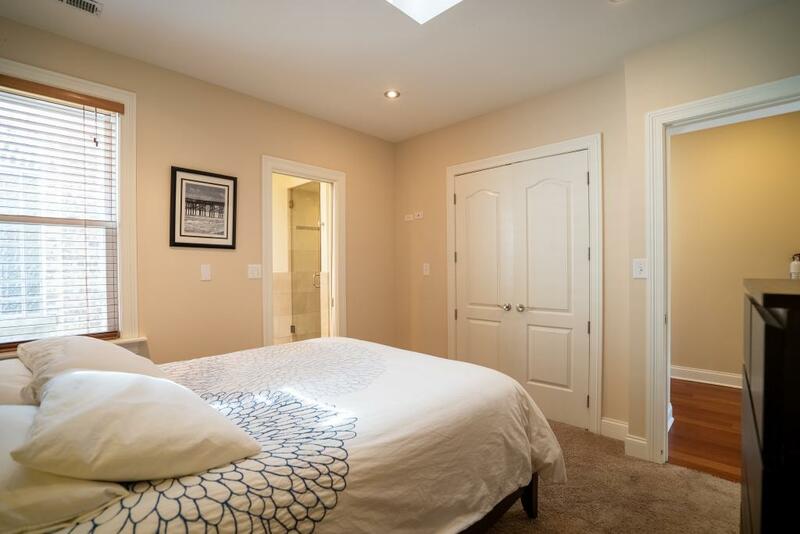 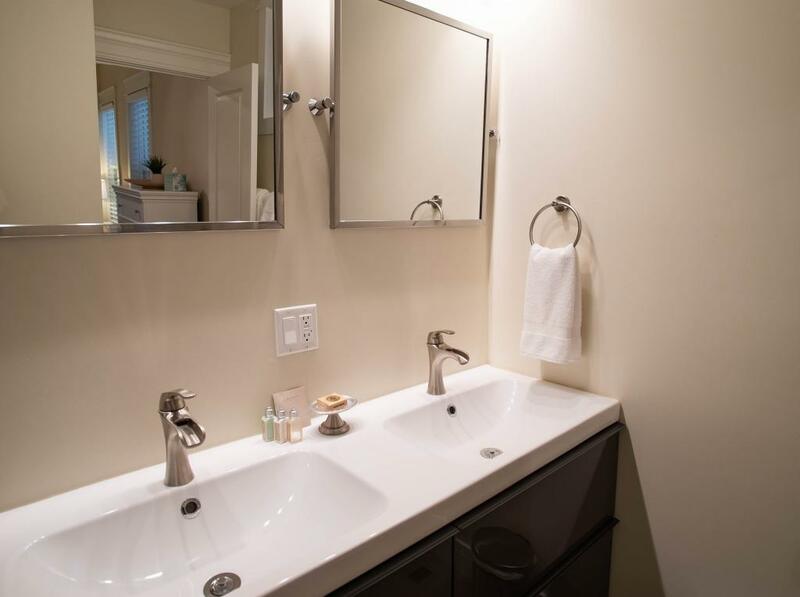 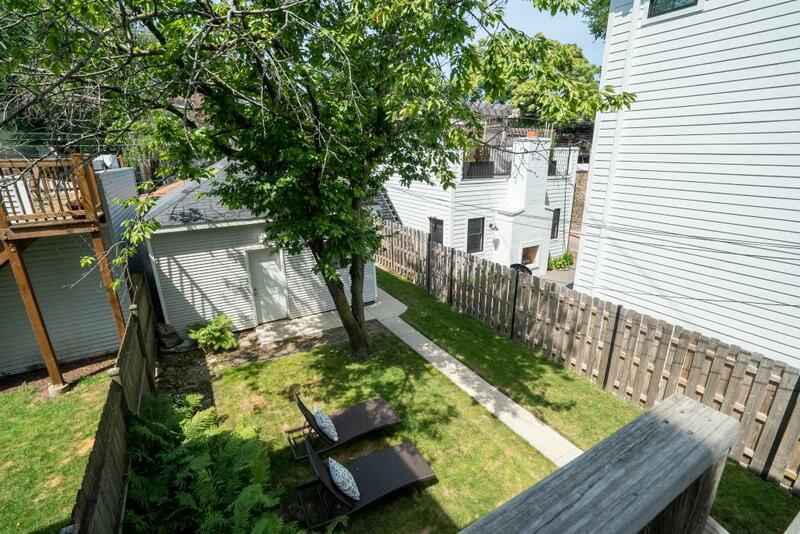 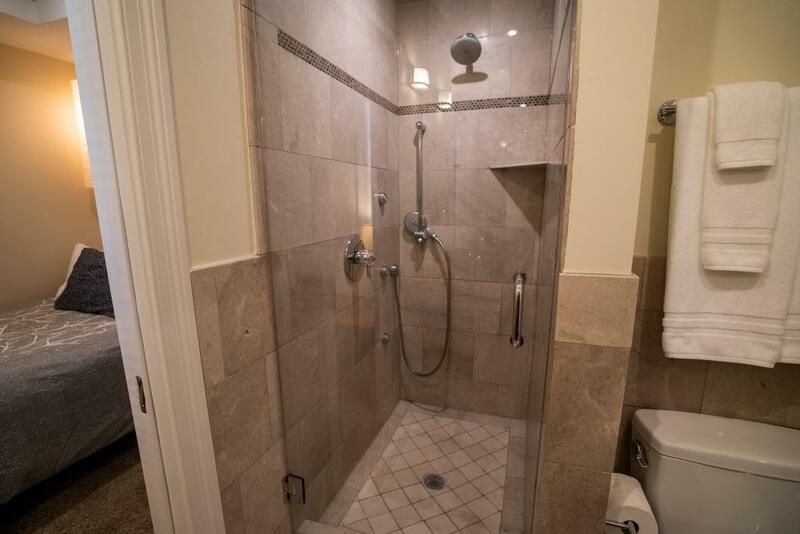 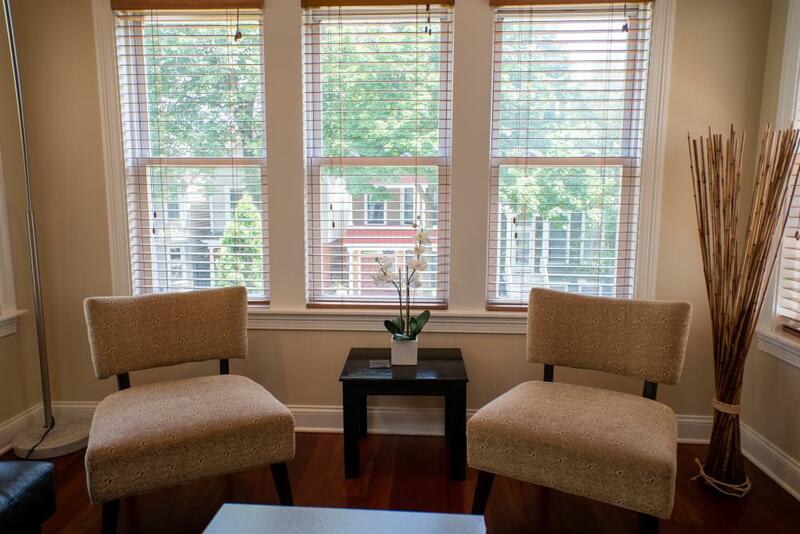 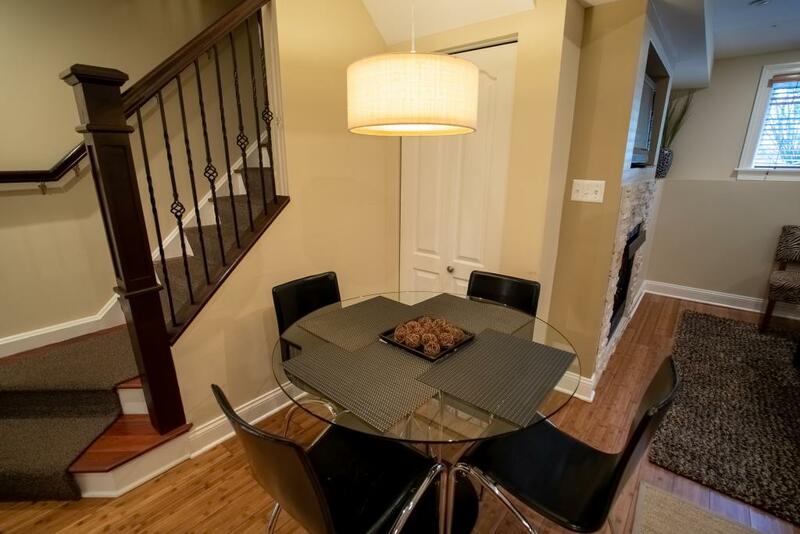 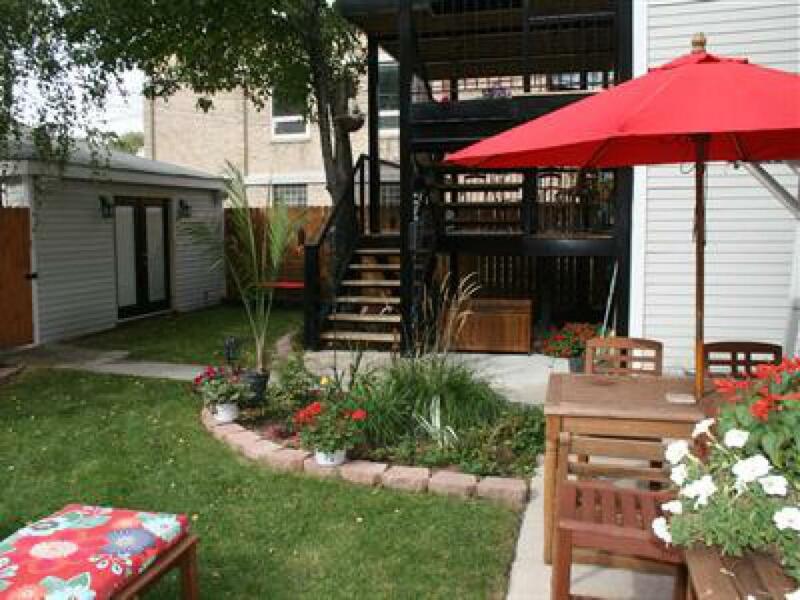 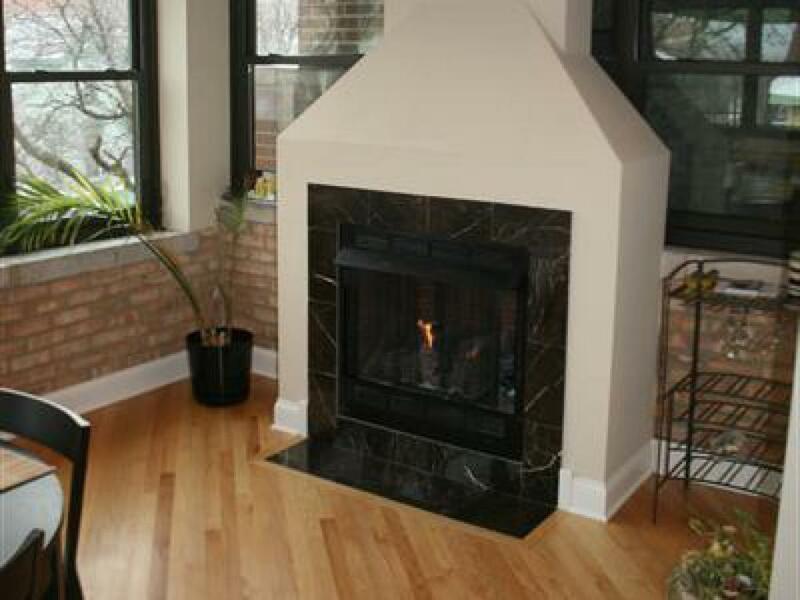 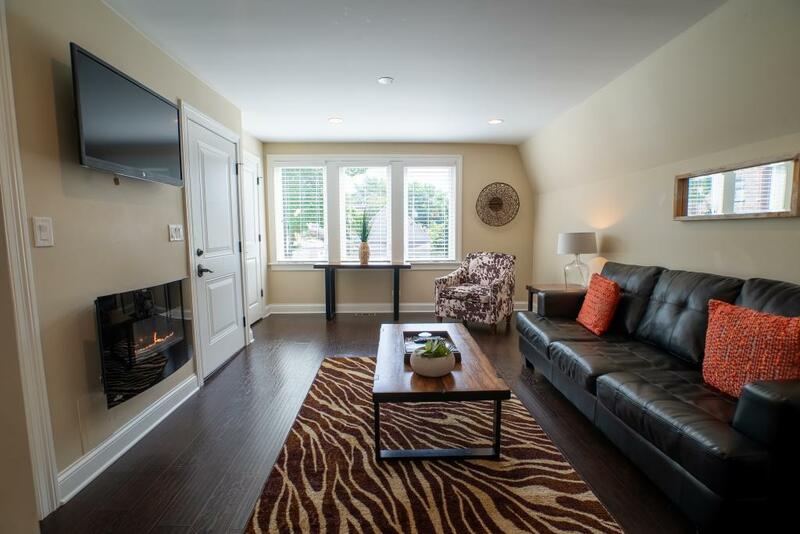 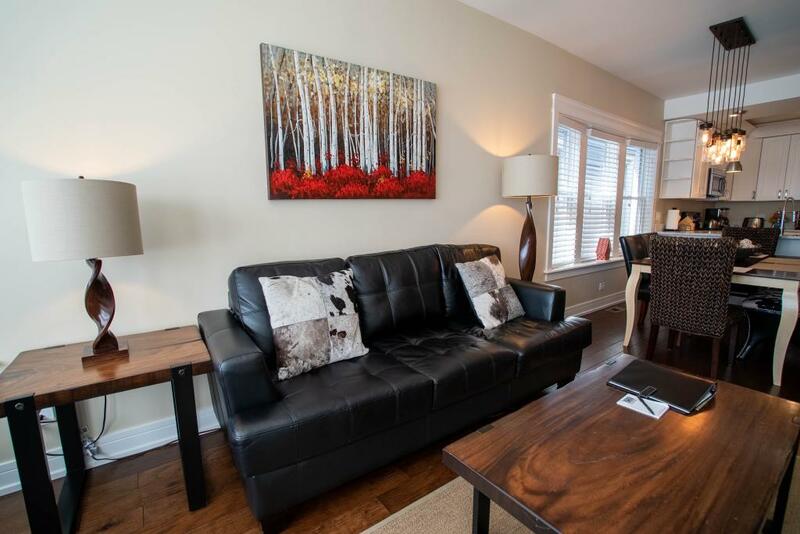 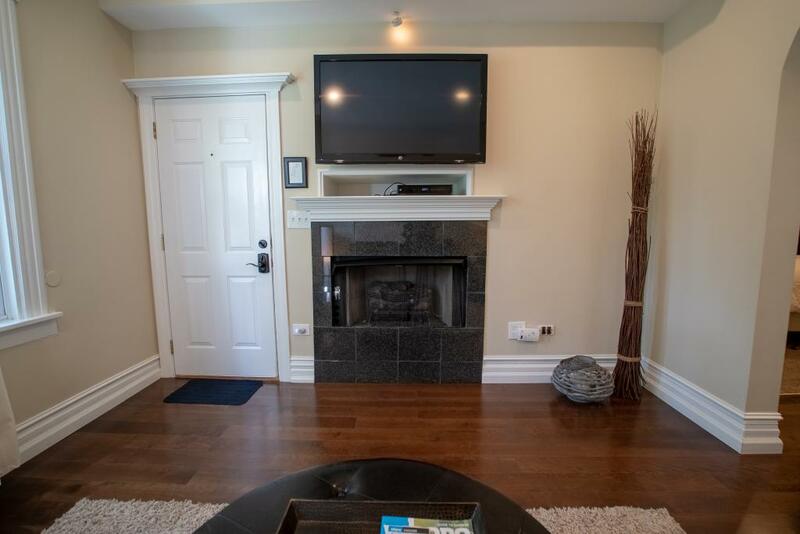 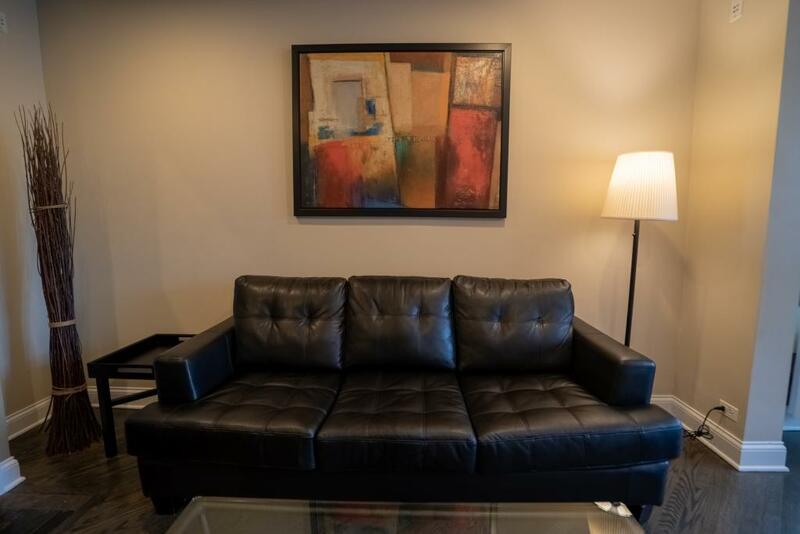 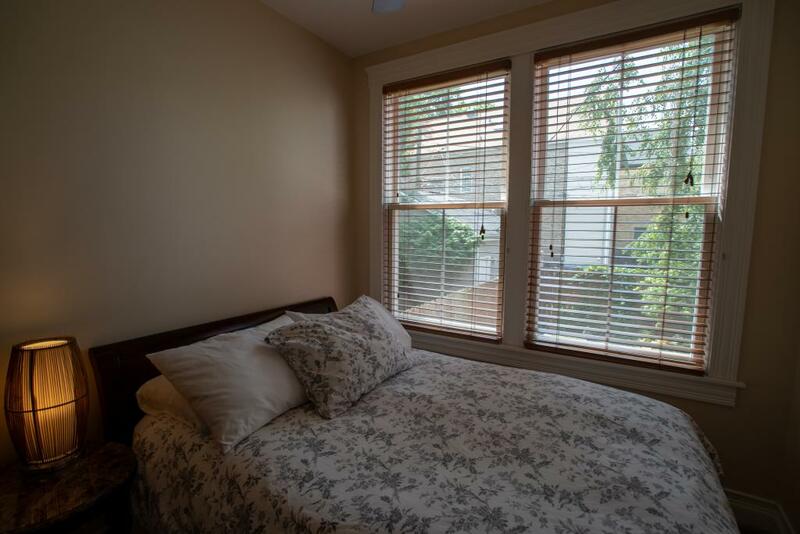 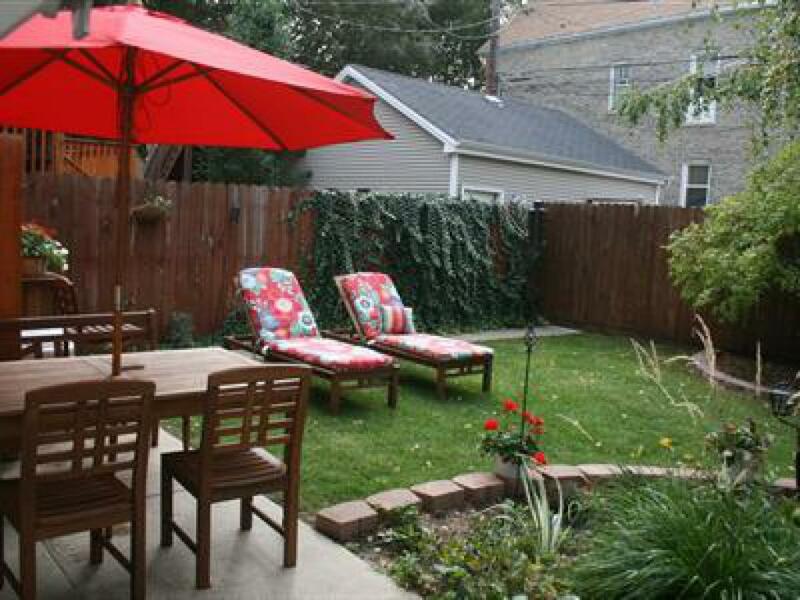 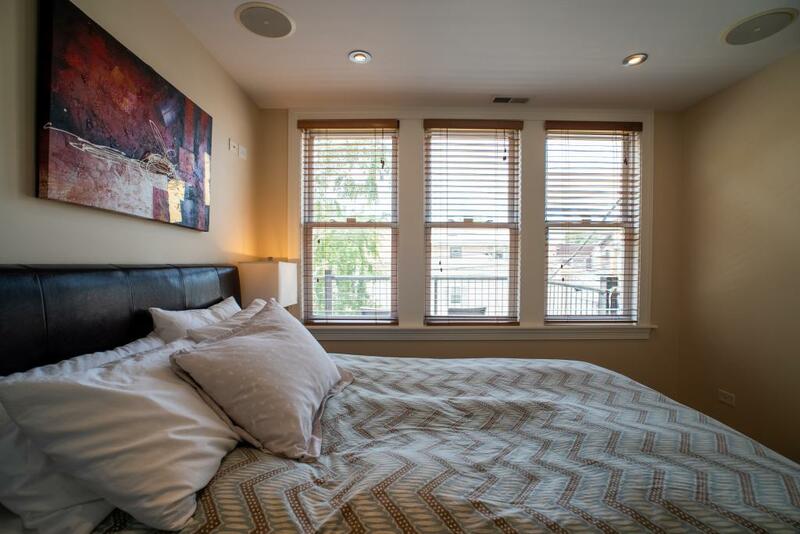 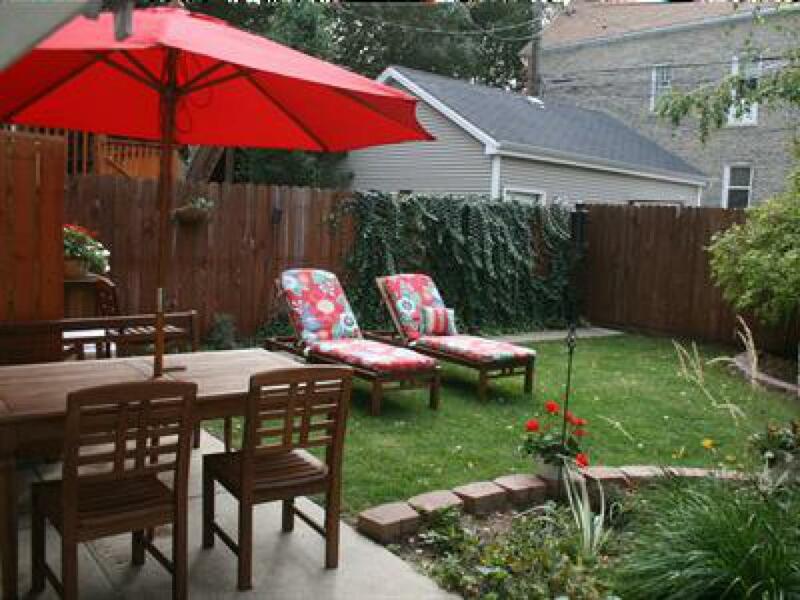 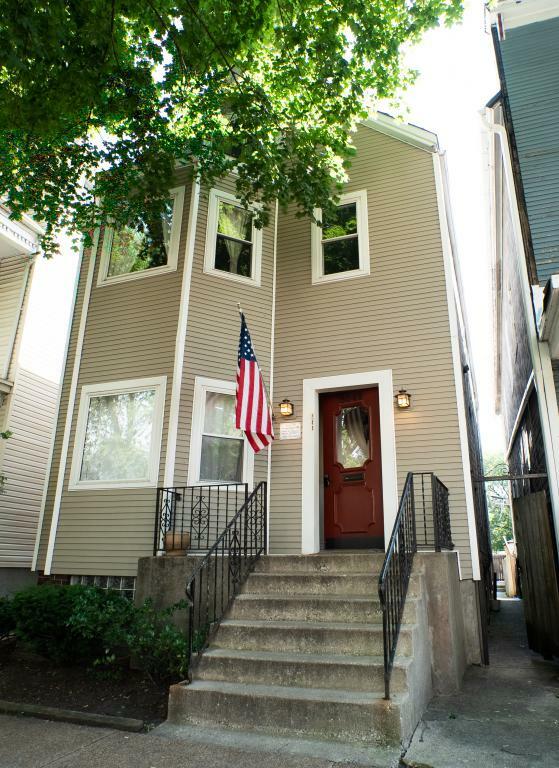 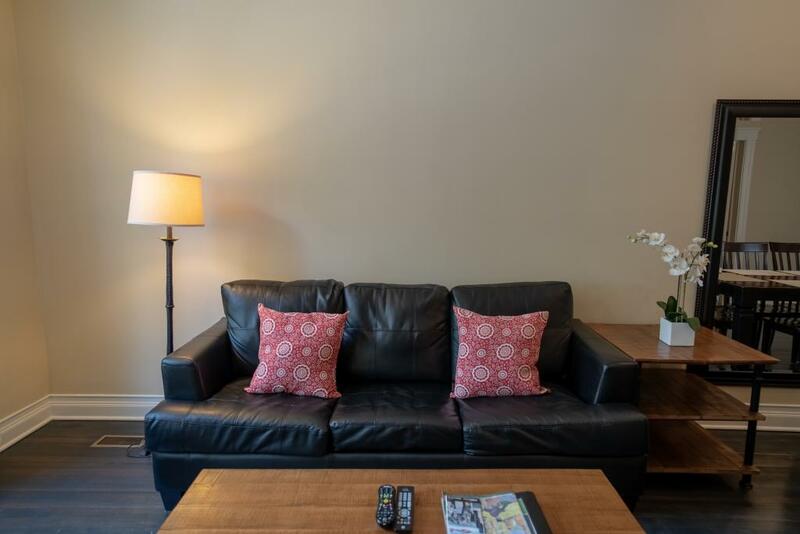 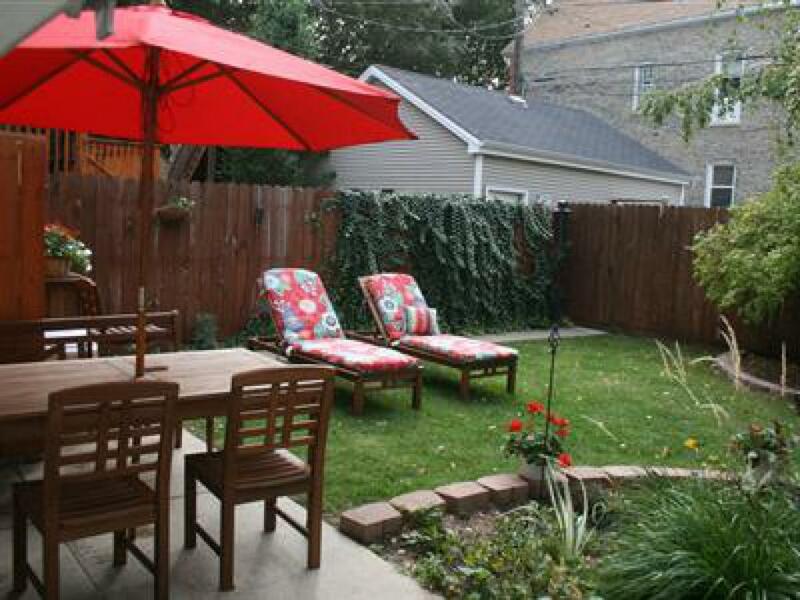 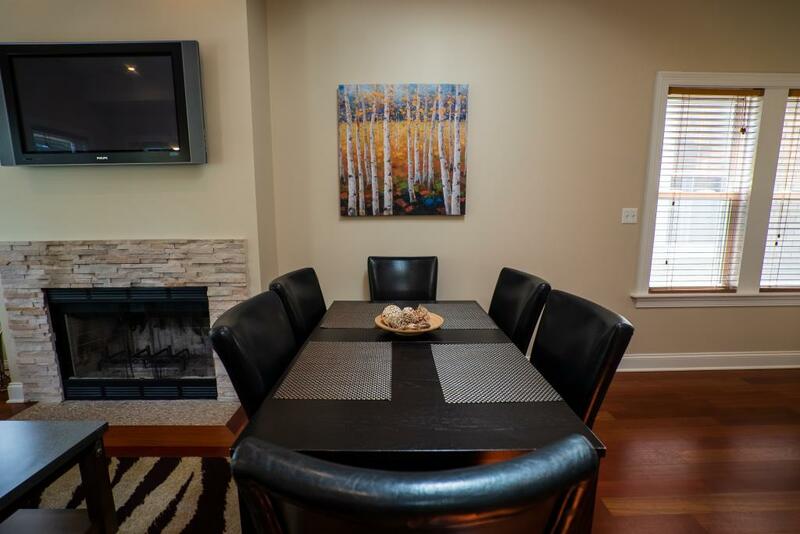 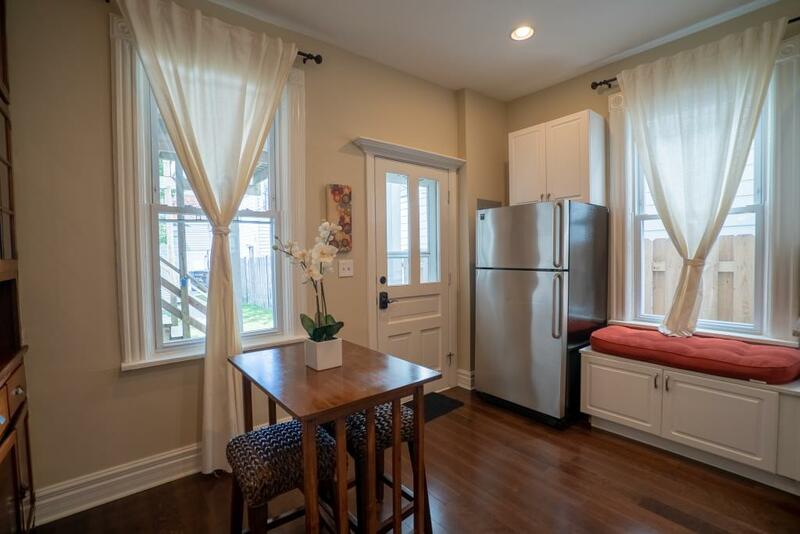 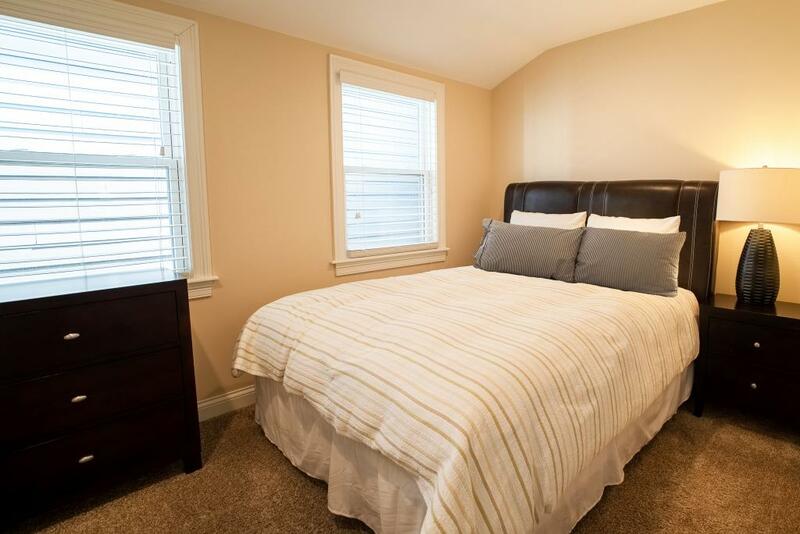 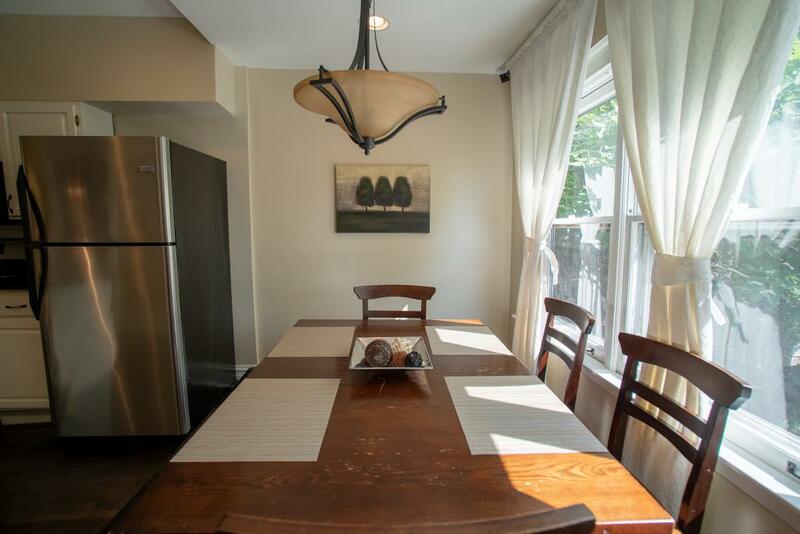 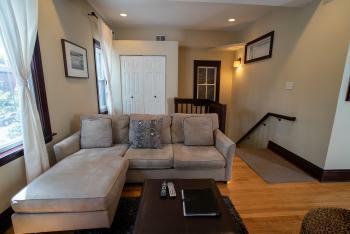 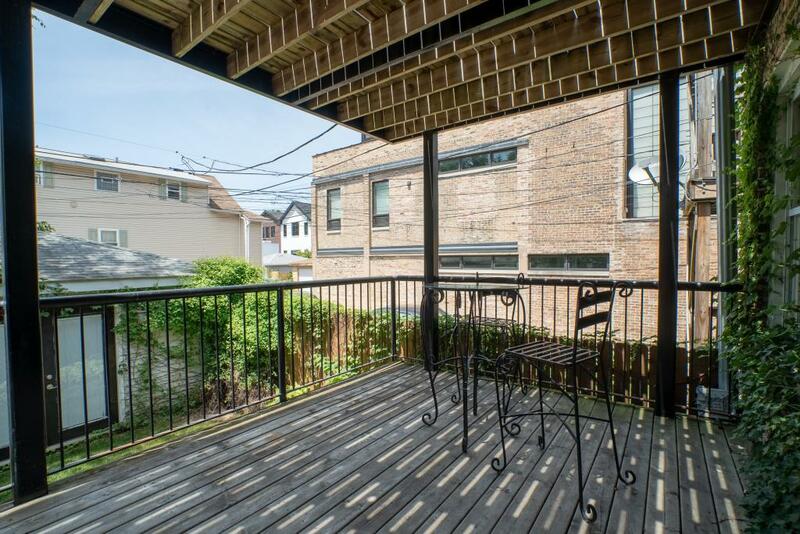 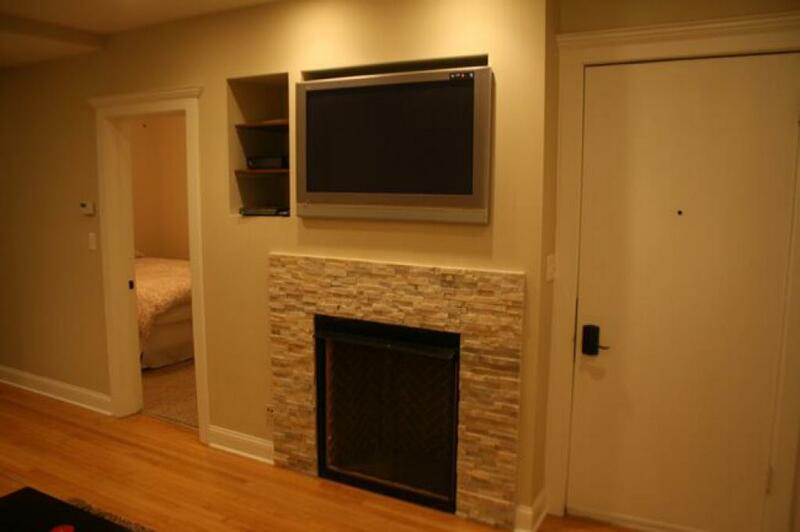 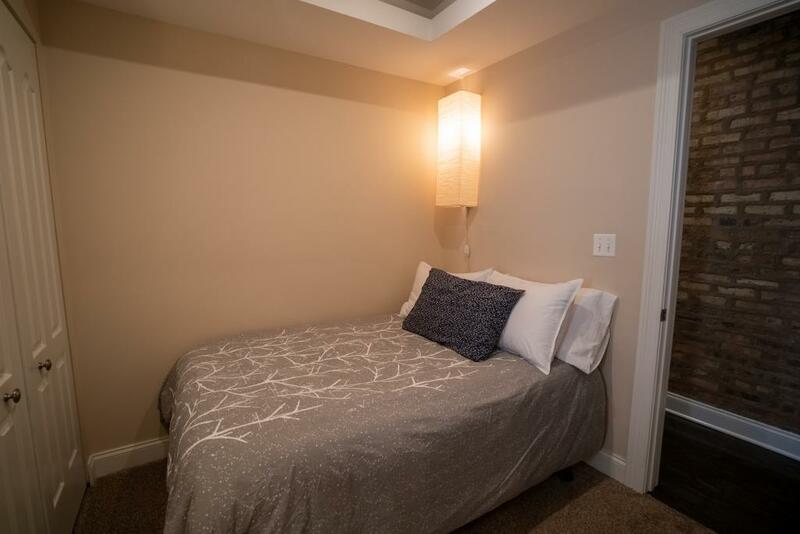 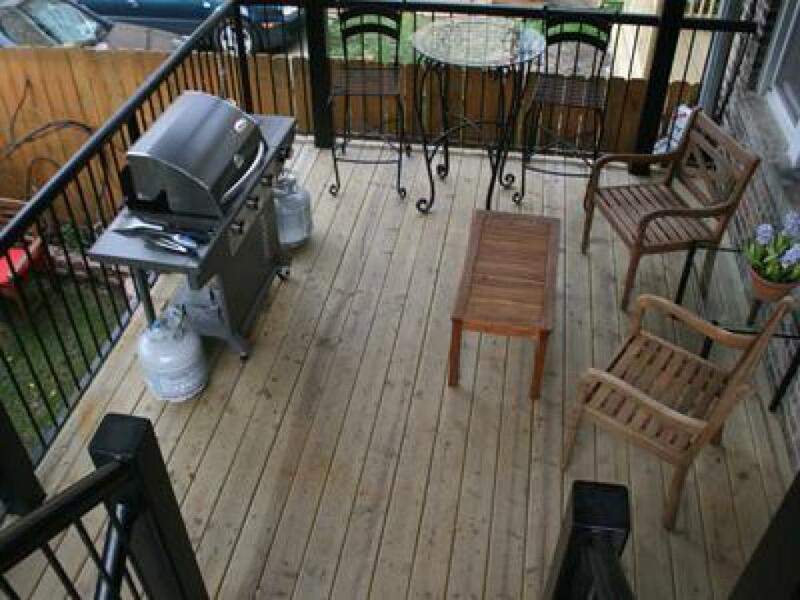 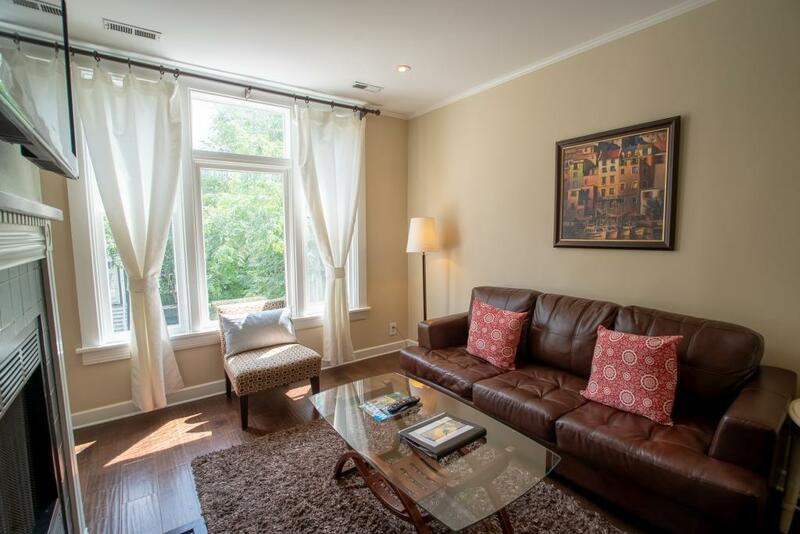 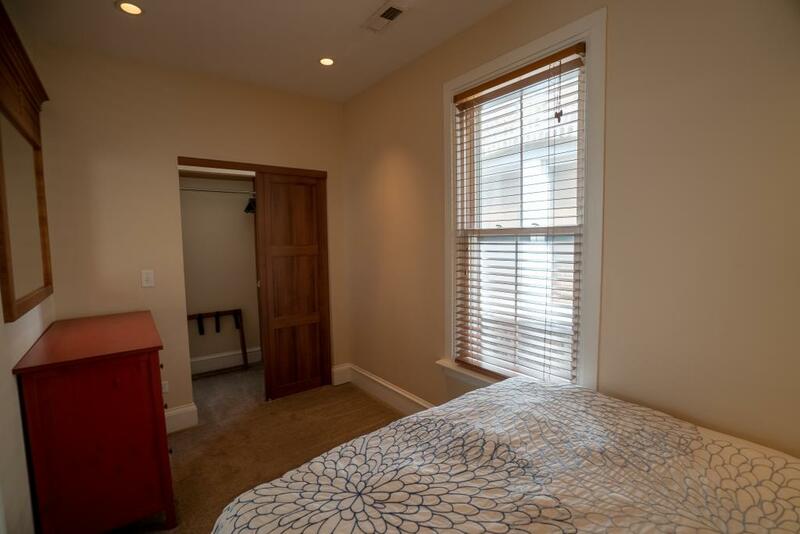 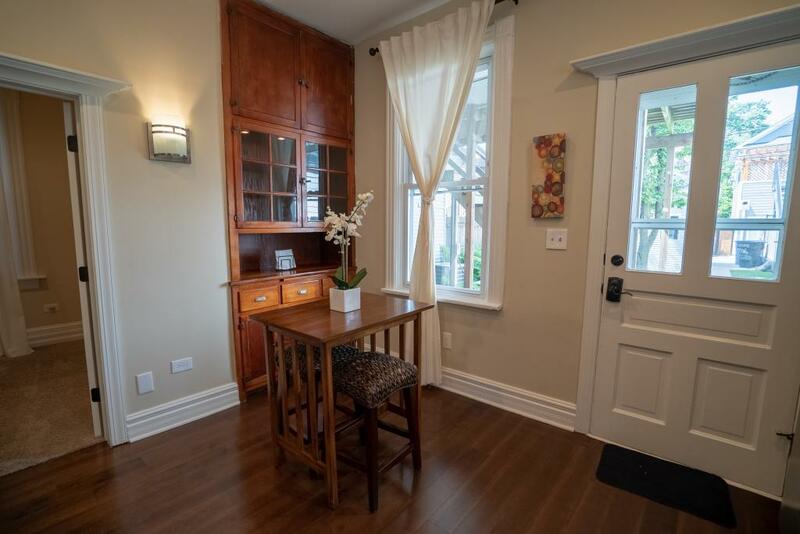 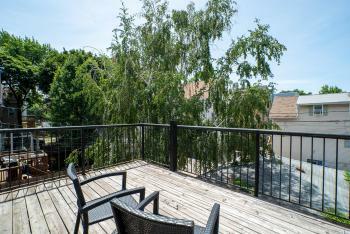 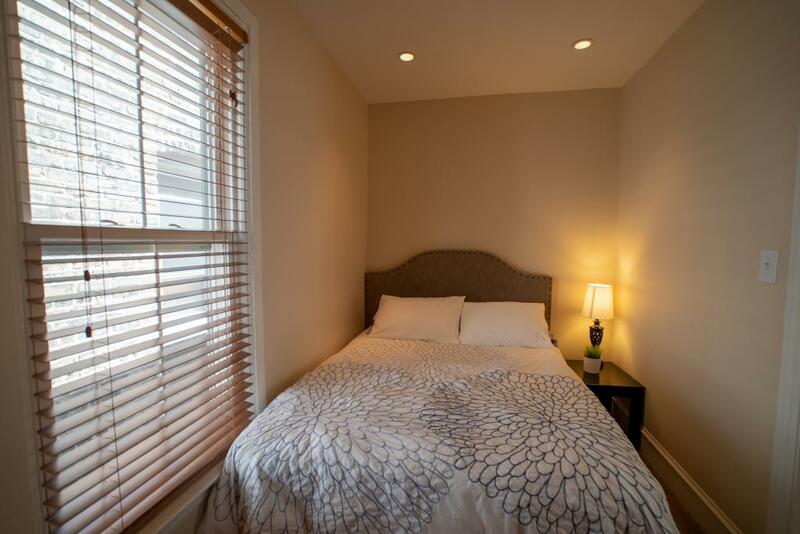 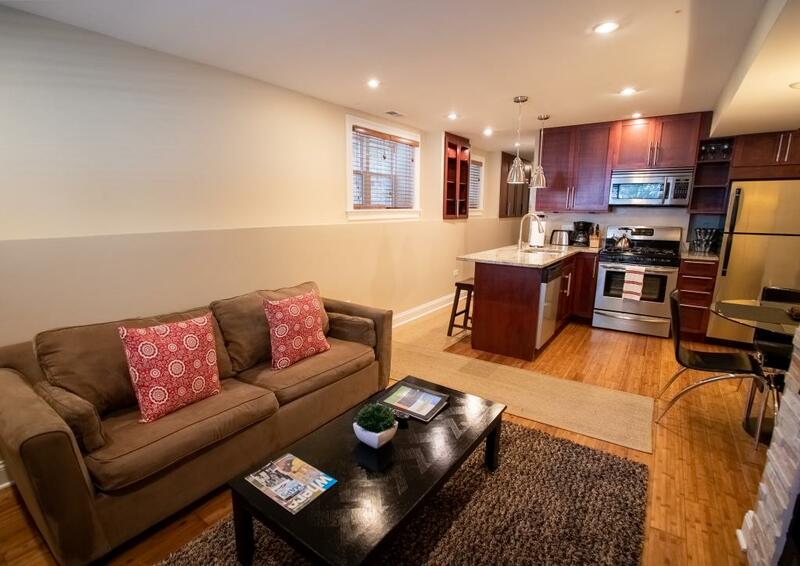 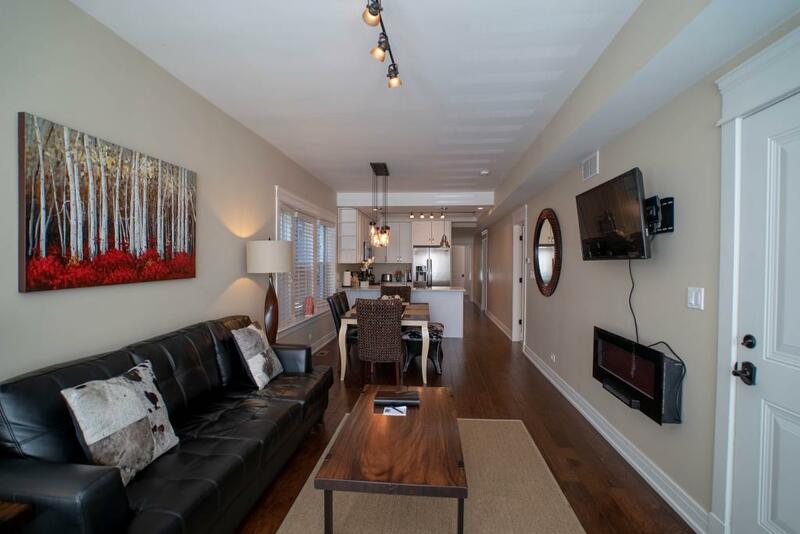 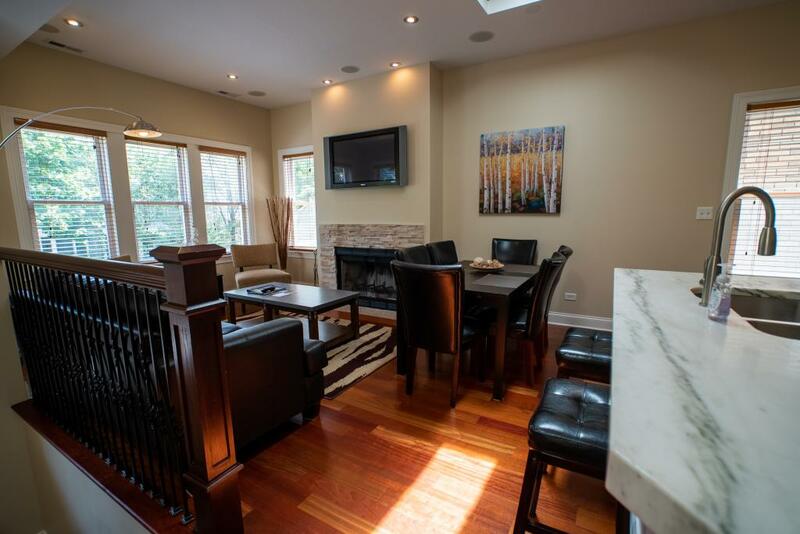 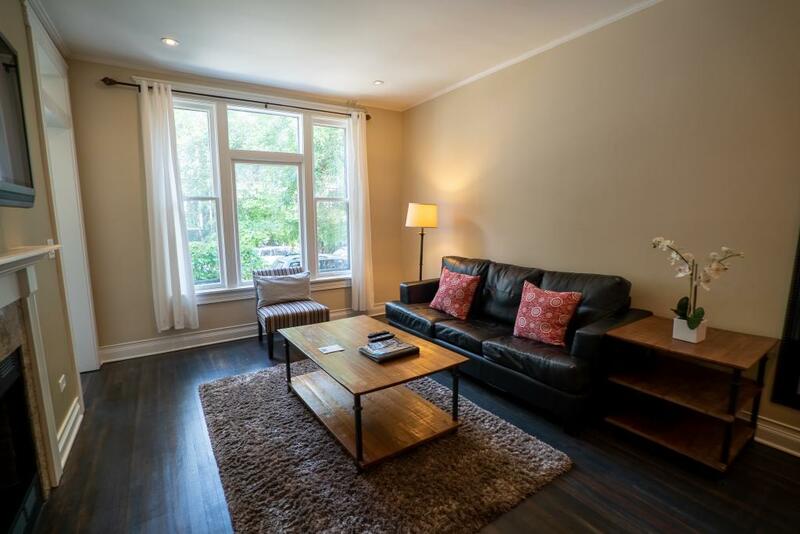 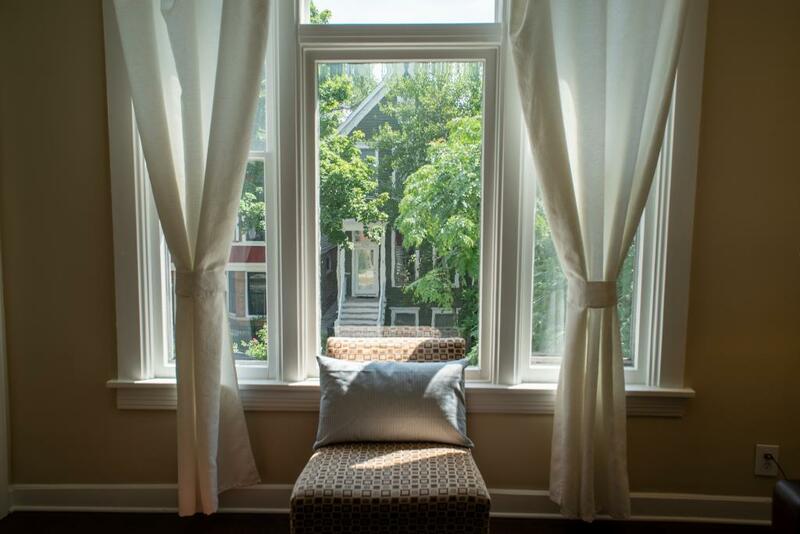 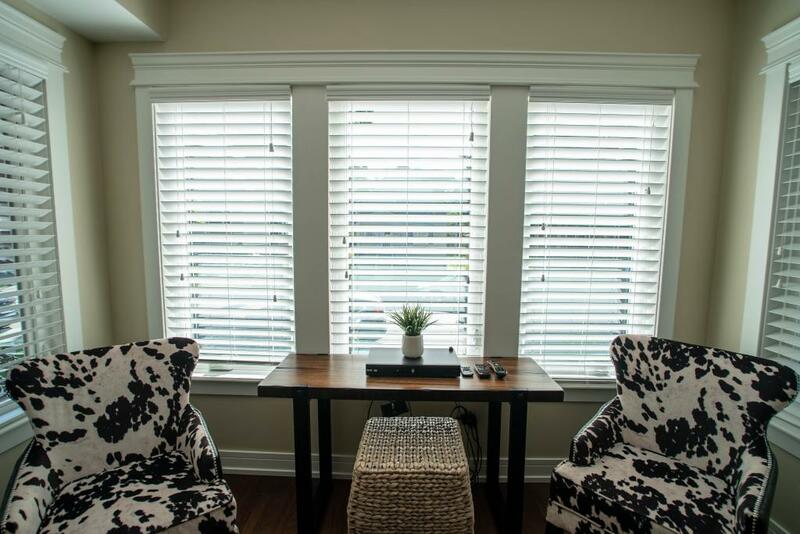 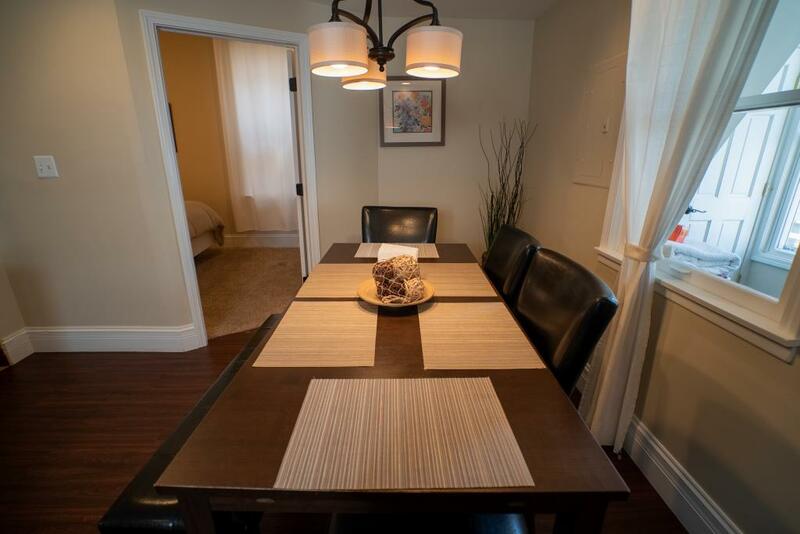 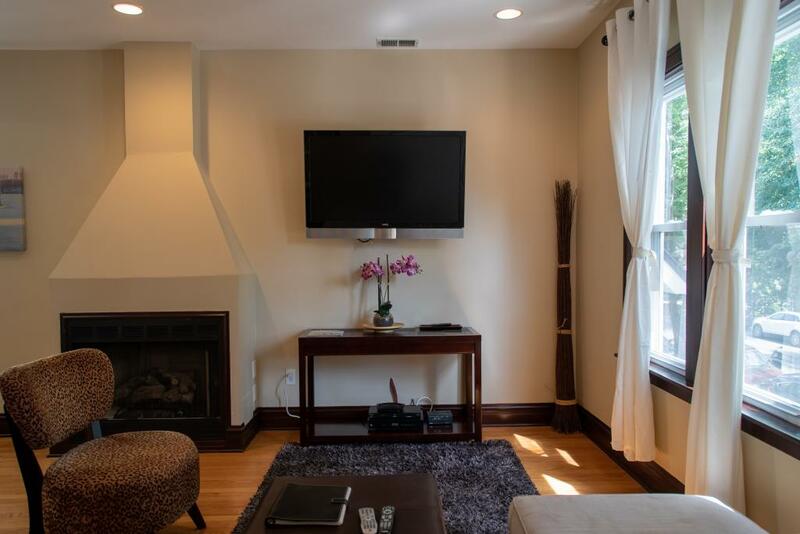 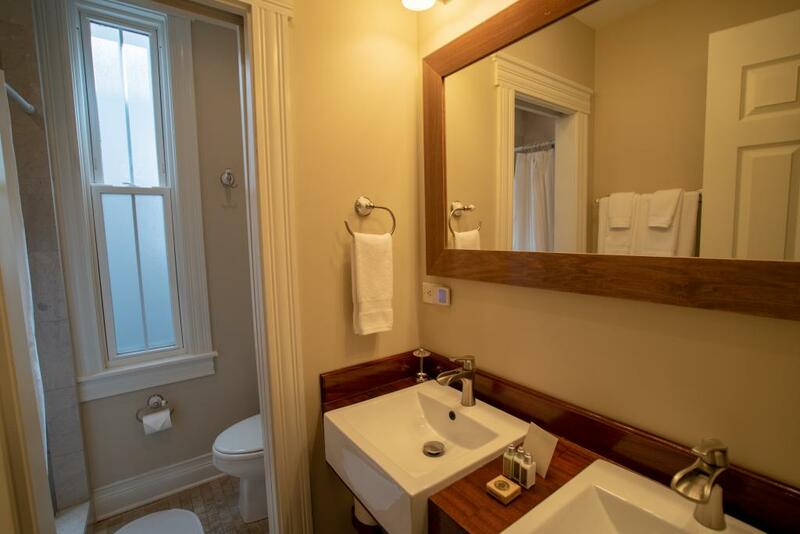 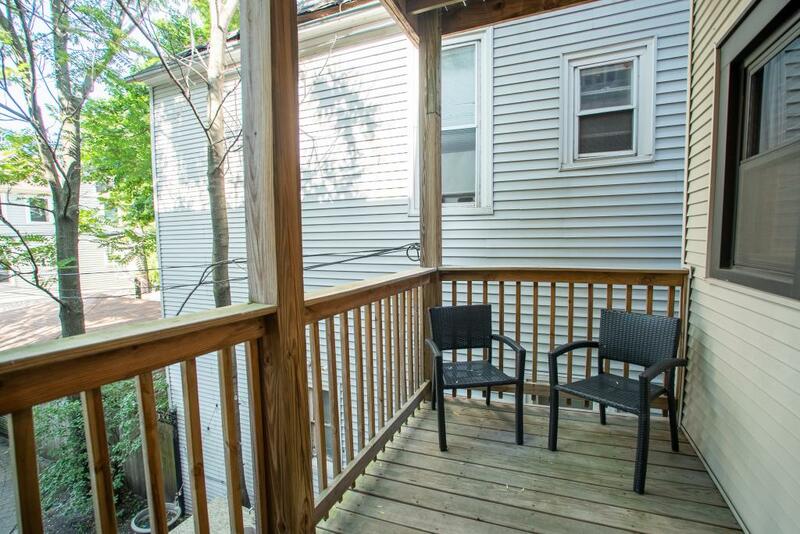 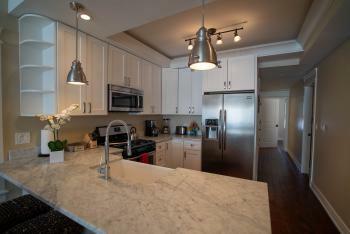 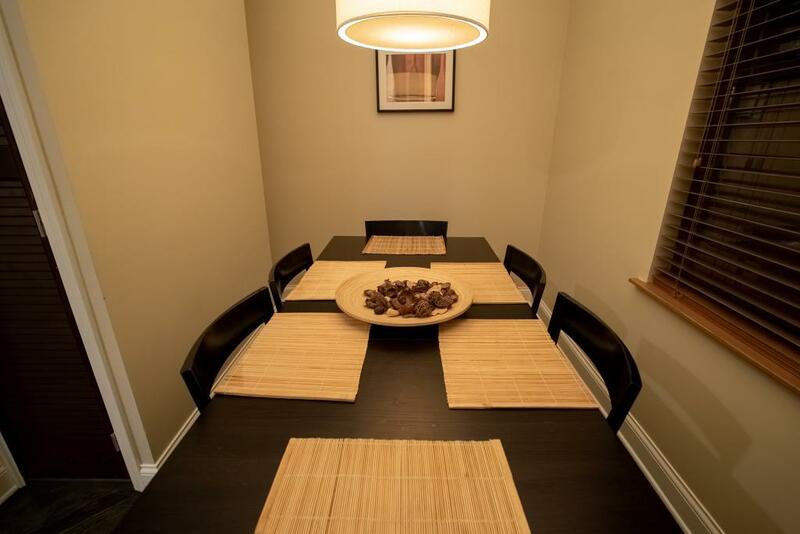 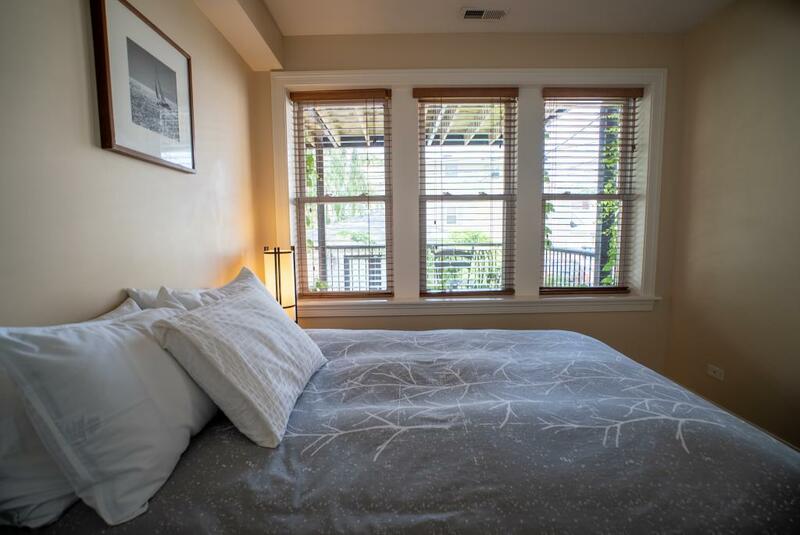 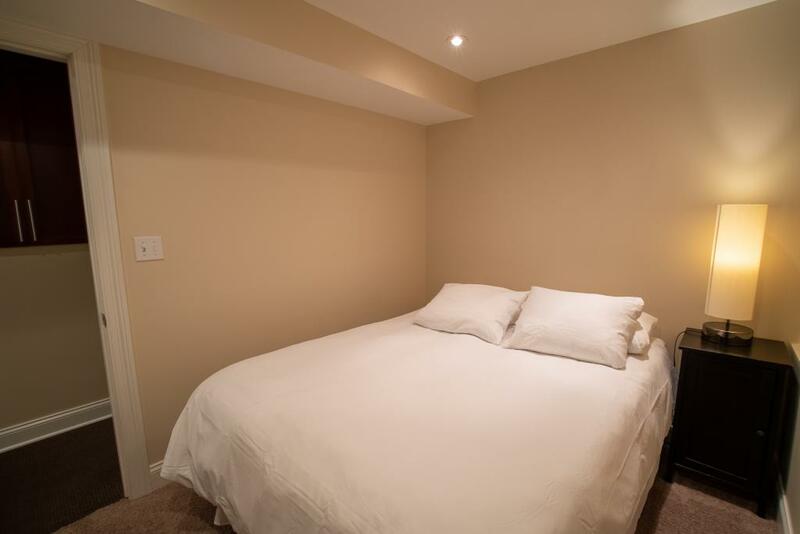 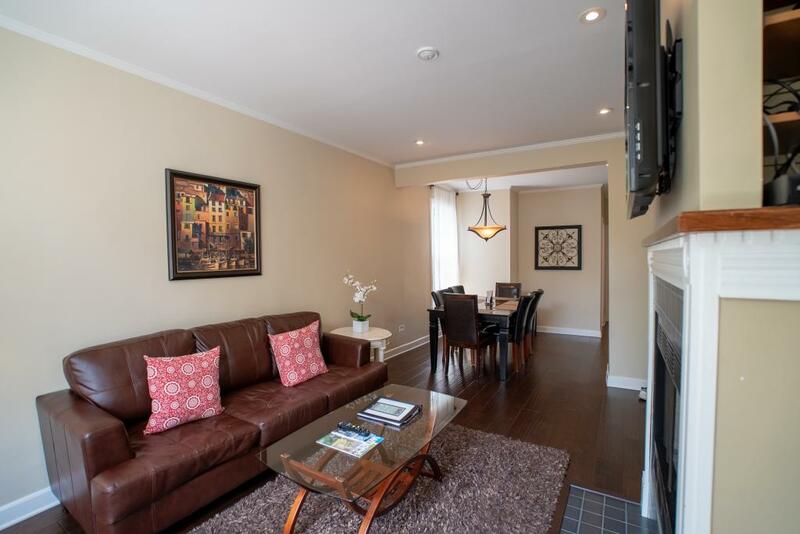 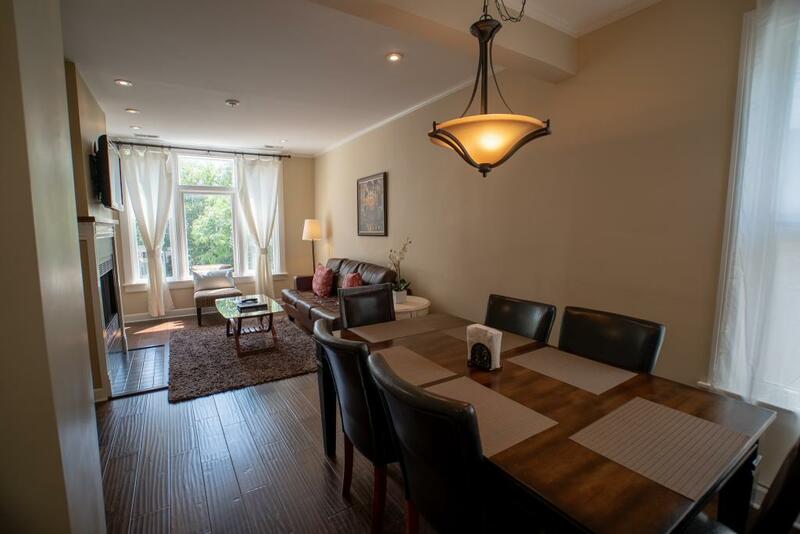 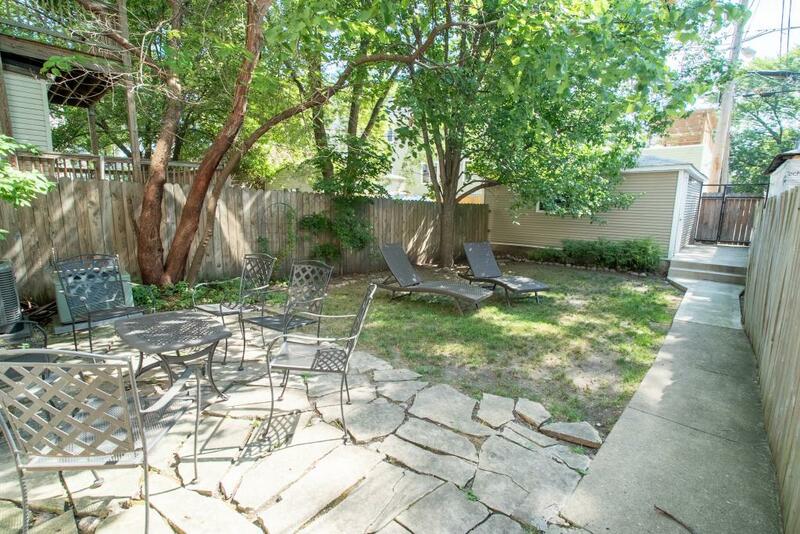 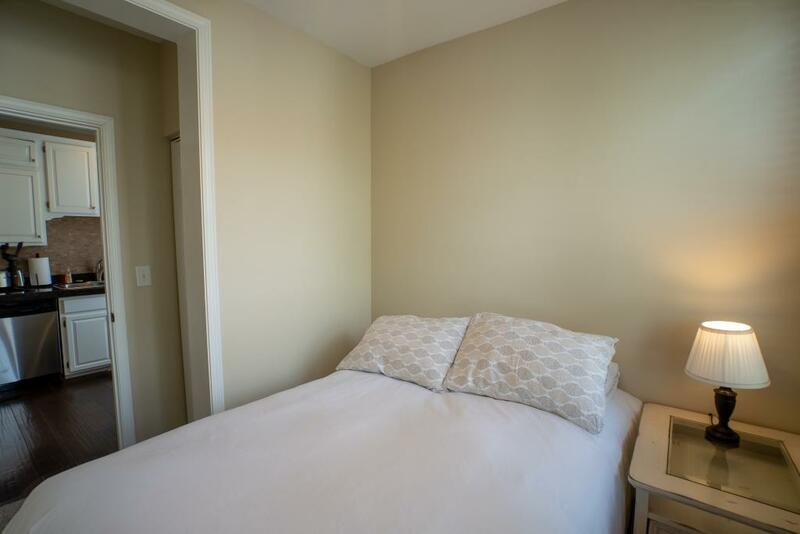 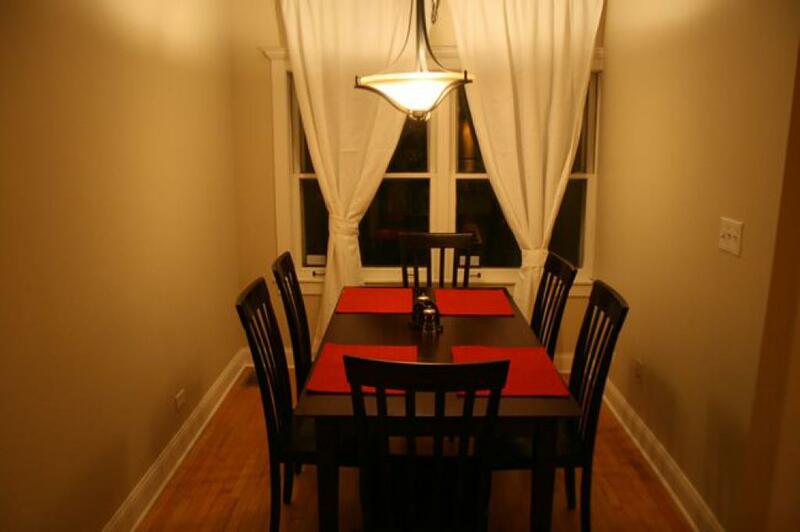 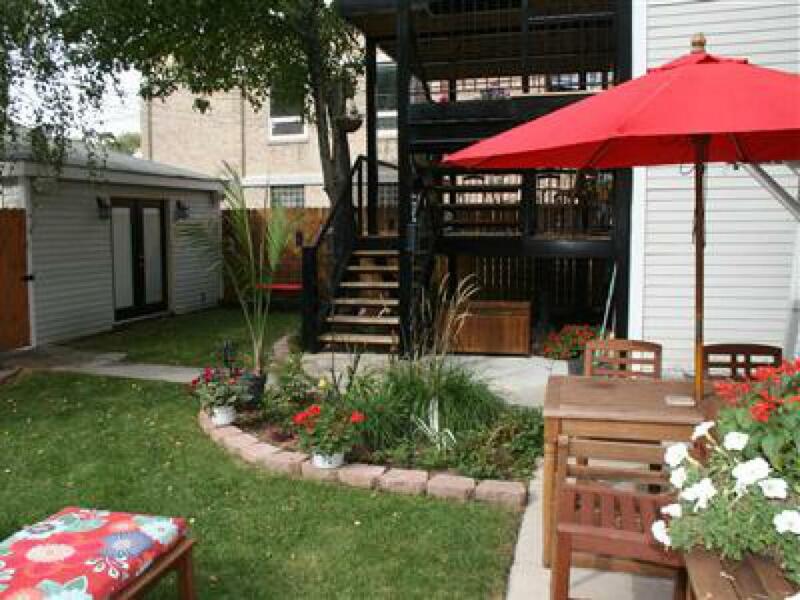 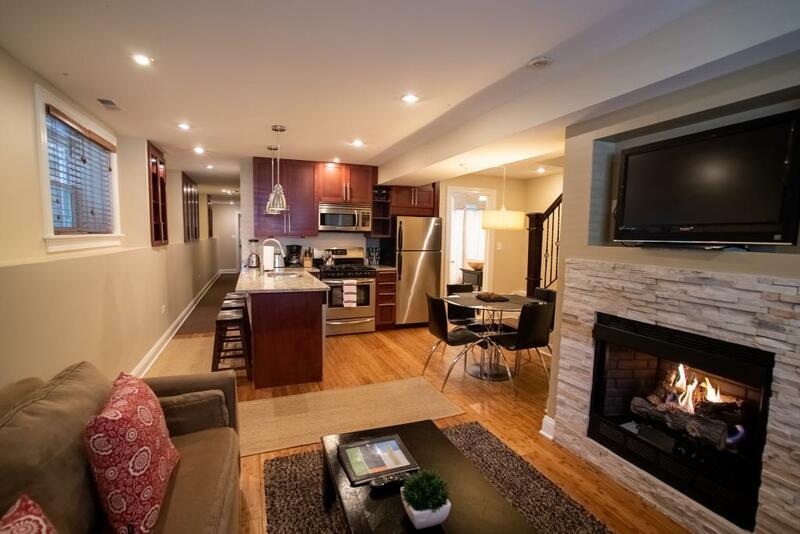 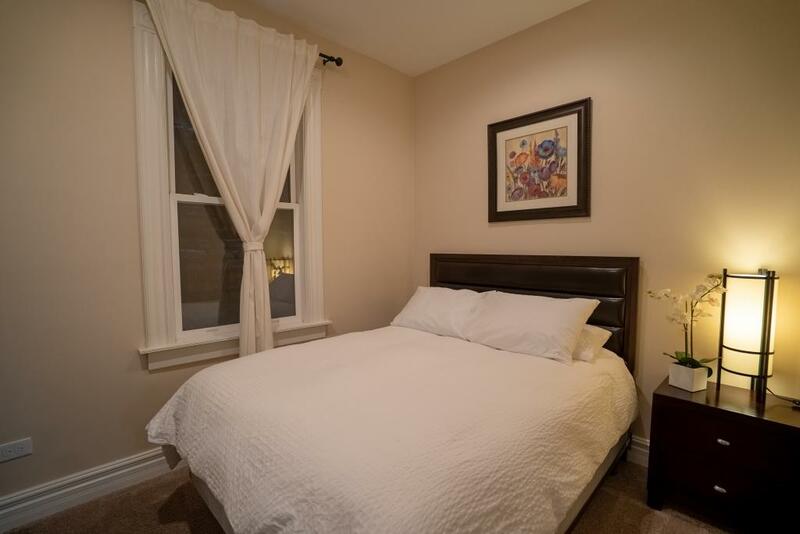 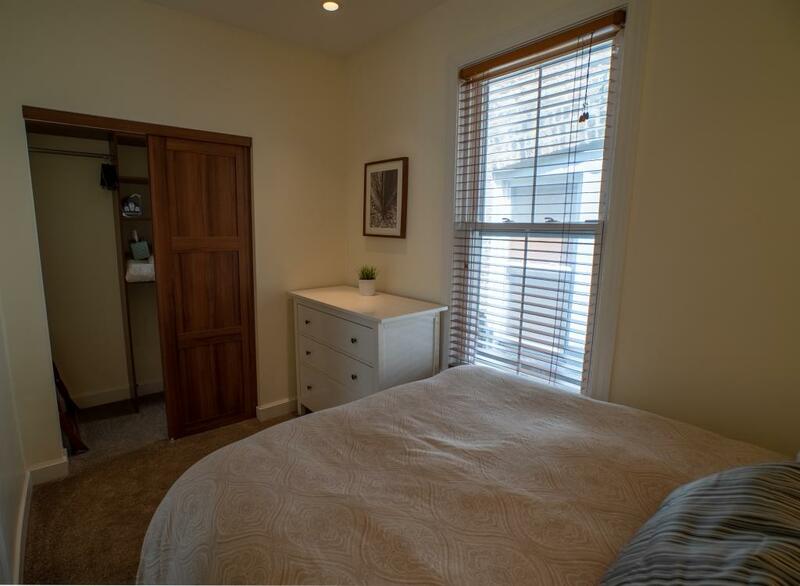 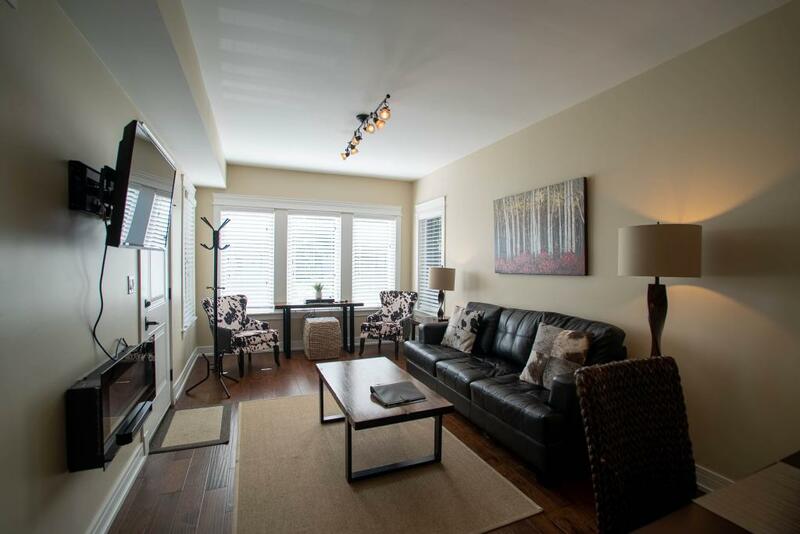 Roscoe Main #2 is a second floor apartment, fully furnished and tastefully decorated. Located on Roscoe & Wolcott in Roscoe Village. 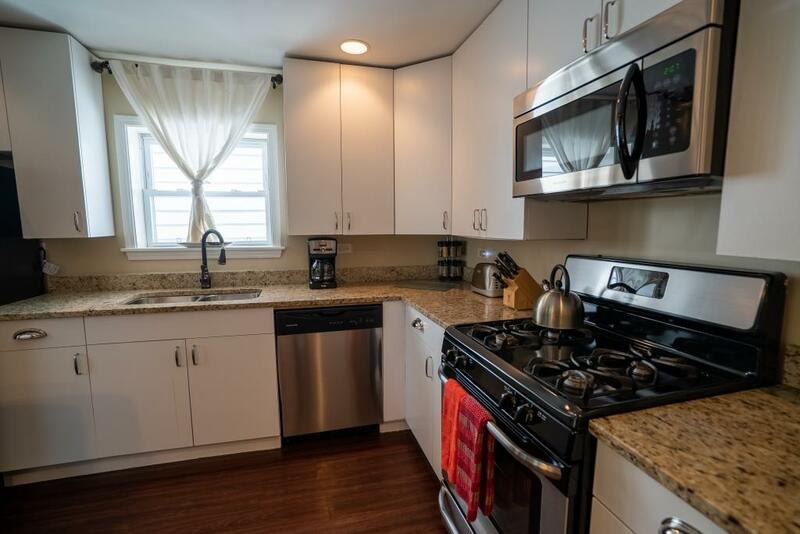 In the kitchen you will find stocked shelves with kitchenware along with with stainless steel appliances, coffee pot, complimentary coffee, tea & sugar. 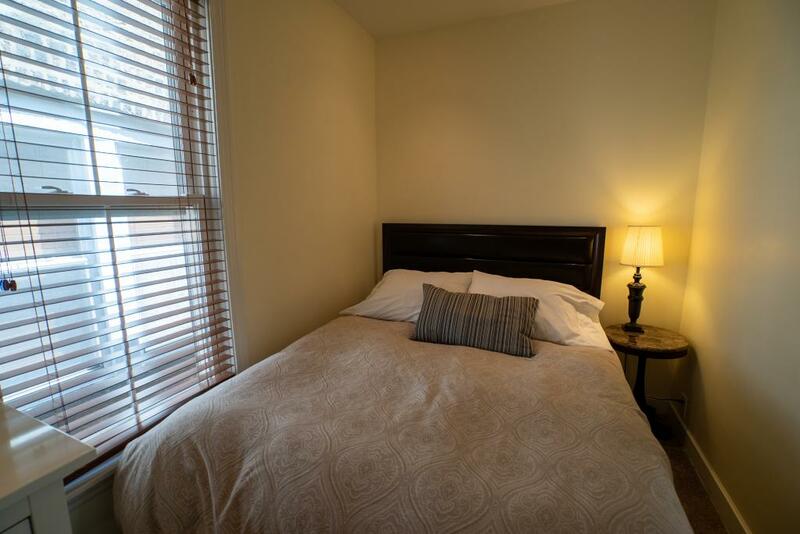 In the bedrooms you will find custom made beds with an independent spring system, memory foam pad, 400-1000 high thread count sheets and down comforters. 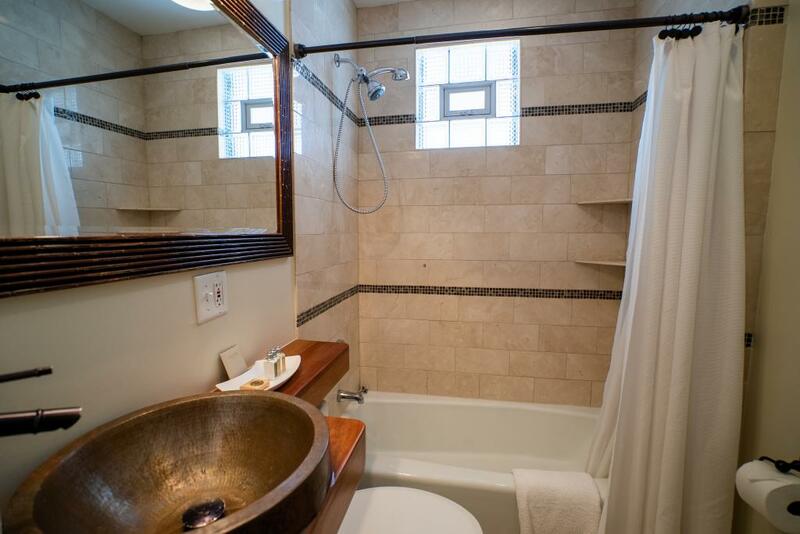 The bathrooms have lush towels and L'Occitane En Provence Verbena amenities. 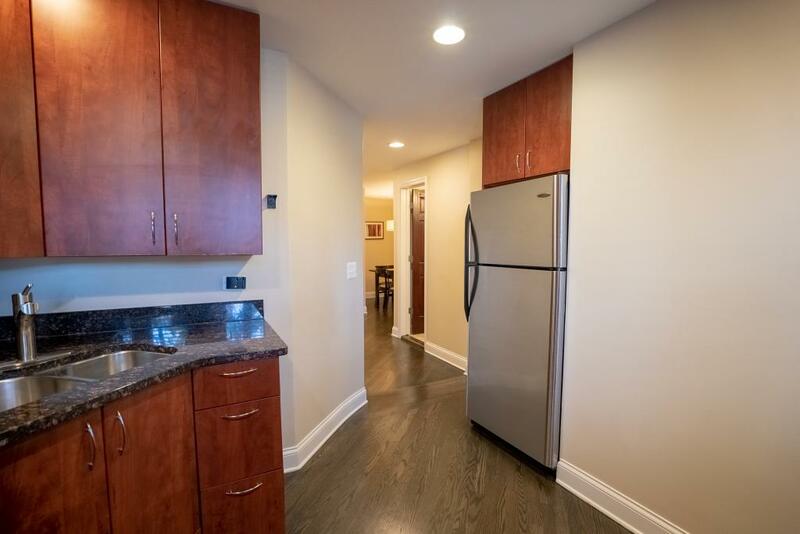 This apartment has a shared washer and dryer inside the building. 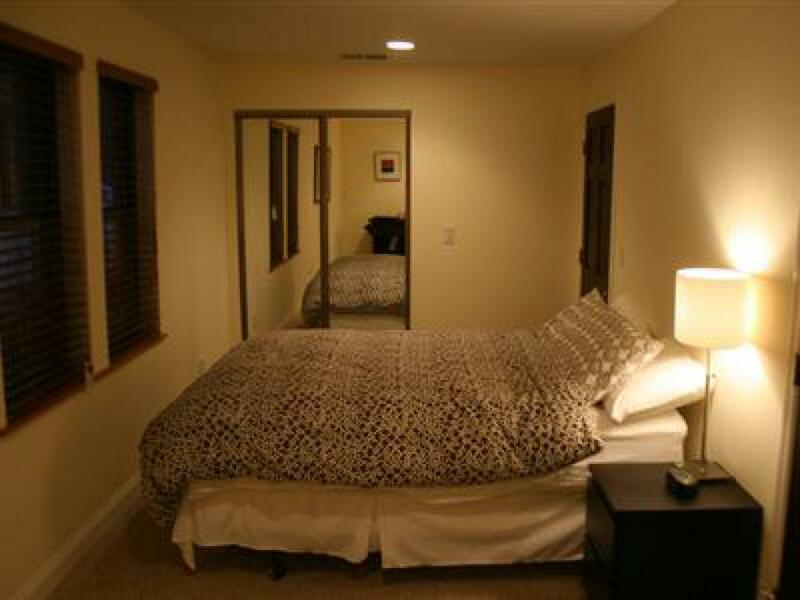 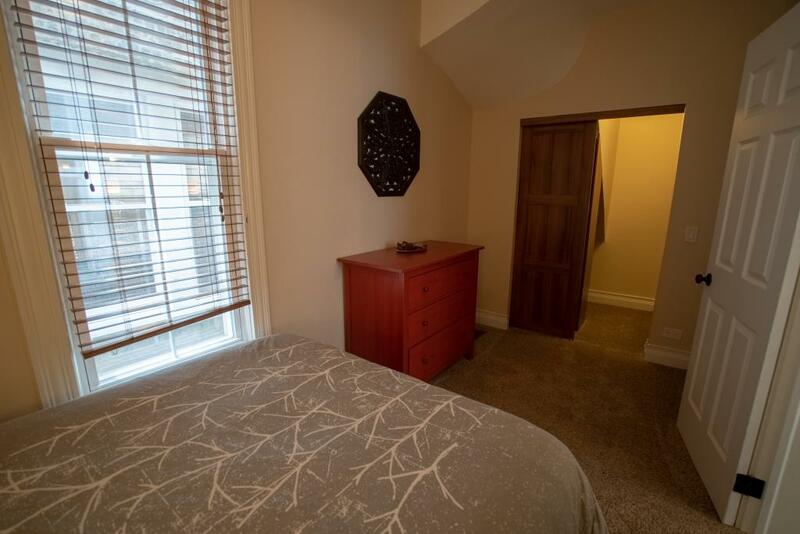 Roscoe Main #3 is a third floor apartment, fully furnished and tastefully decorated. 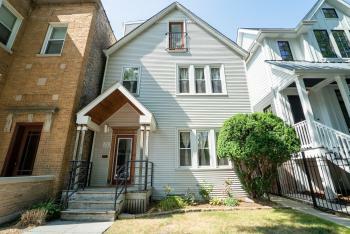 Located on Roscoe & Wolcott in Roscoe Village. In the kitchen you will find stocked shelves with kitchenware along with with stainless steel appliances, coffee pot, complimentary coffee, tea & sugar. 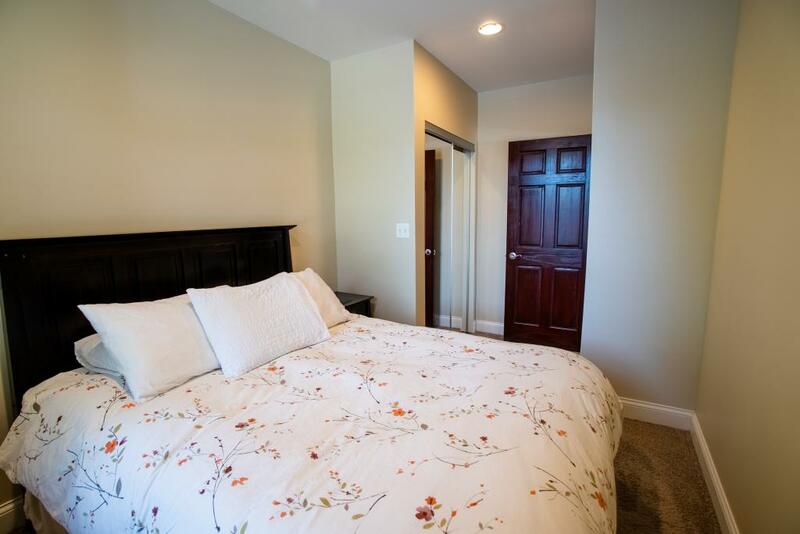 In the bedrooms you will find custom made beds with an independent spring system, memory foam pad, 400-1000 high thread count sheets and down comforters. 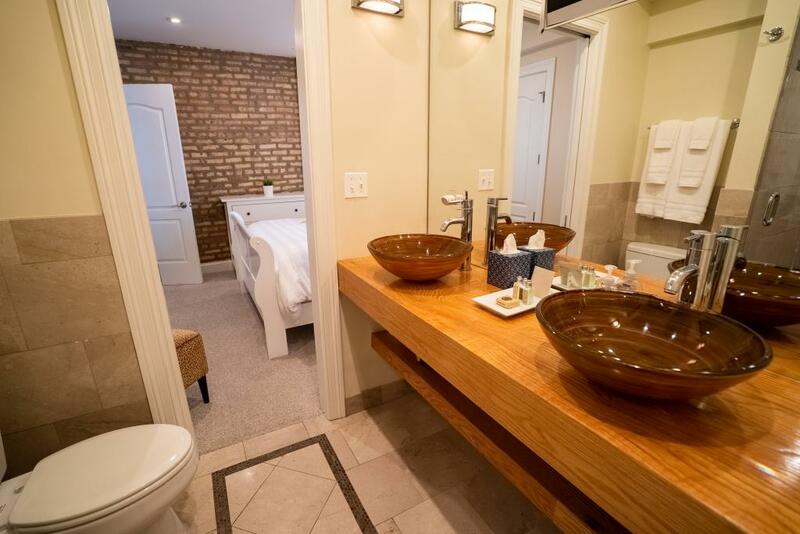 The bathrooms have lush towels and L'Occitane En Provence Verbena amenities. 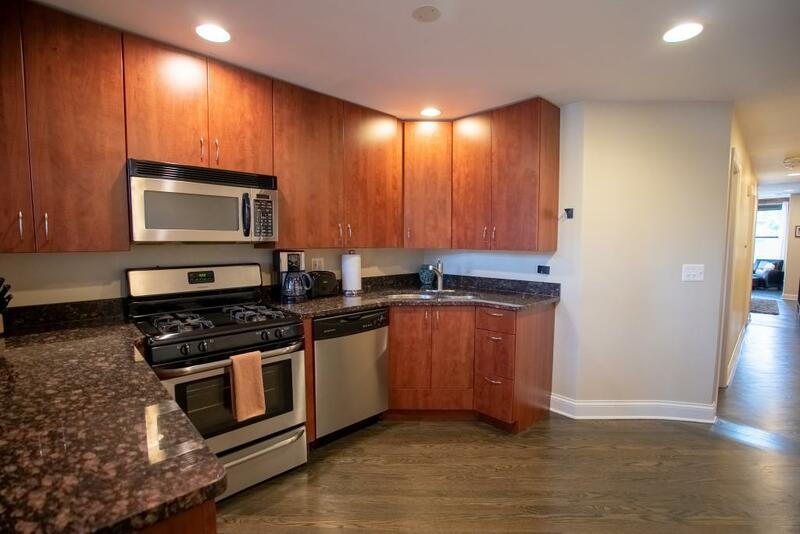 This apartment has a shared washer and dryer inside the building. 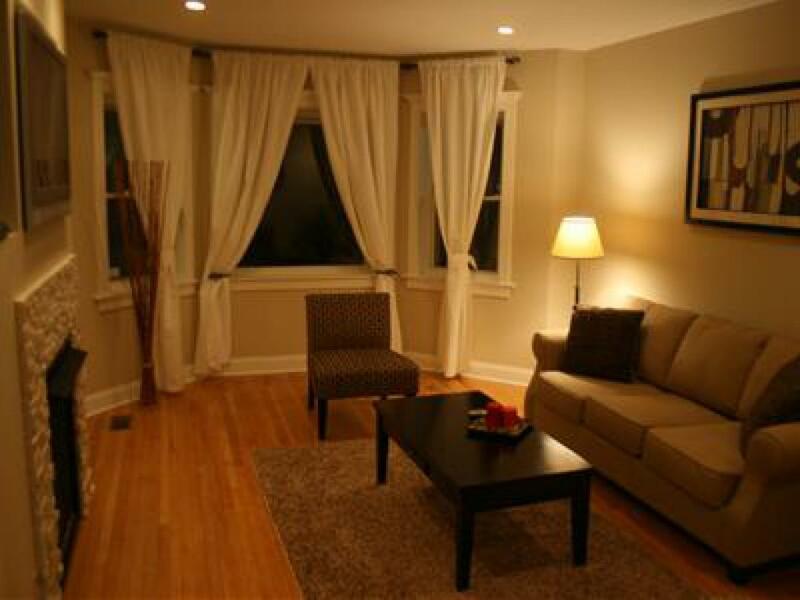 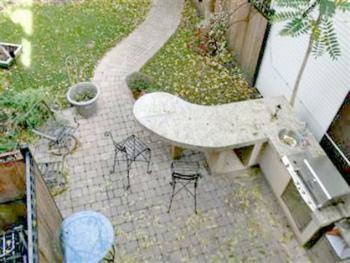 Village North Garden is a garden apartment, fully furnished and tastefully decorated. 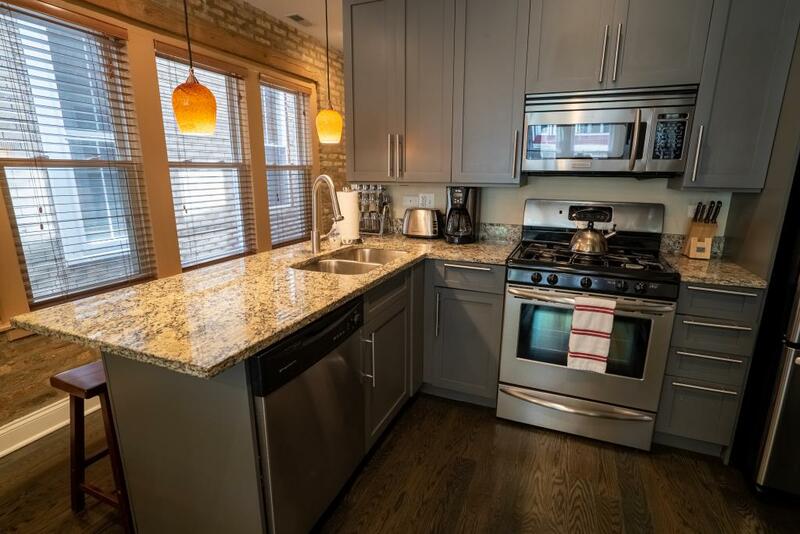 In the kitchen you will find stocked shelves with kitchenware along with with stainless steel appliances, coffee pot, complimentary coffee, tea & sugar. 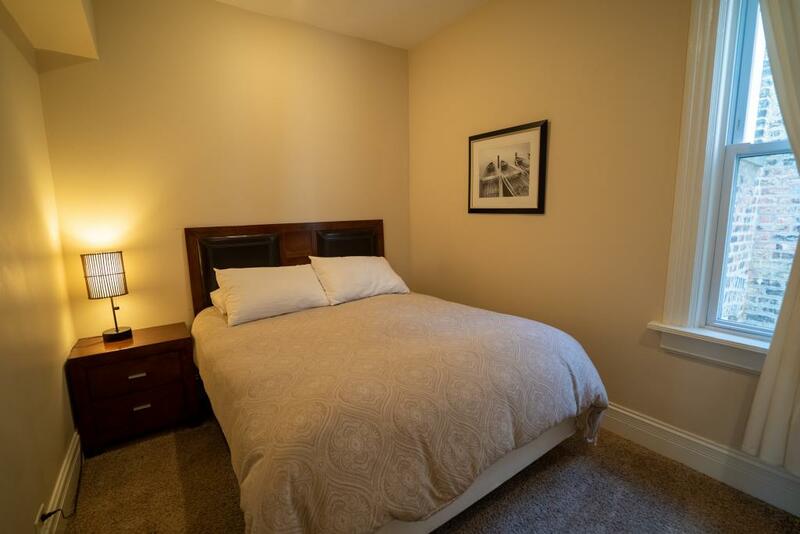 In the bedrooms you will find custom made beds with an independent spring system, memory foam pad, 400-1000 high thread count sheets and down comforters. 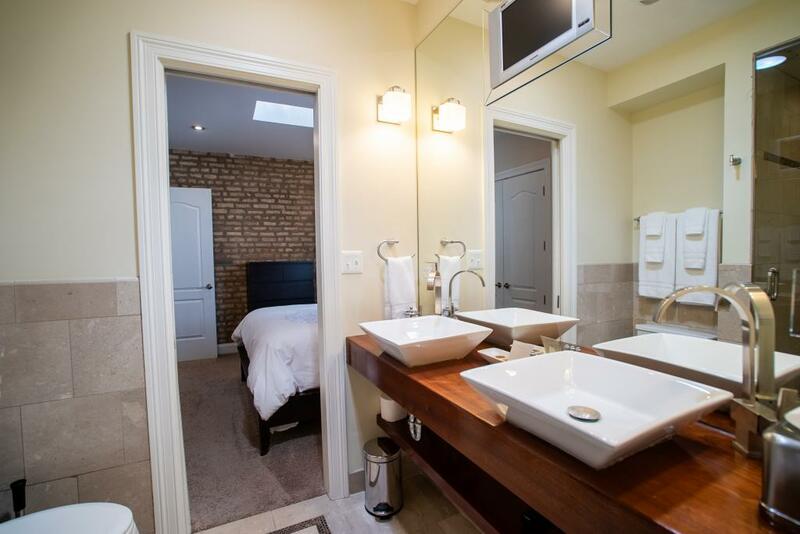 The bathrooms have lush towels and L'Occitane En Provence Verbena amenities. 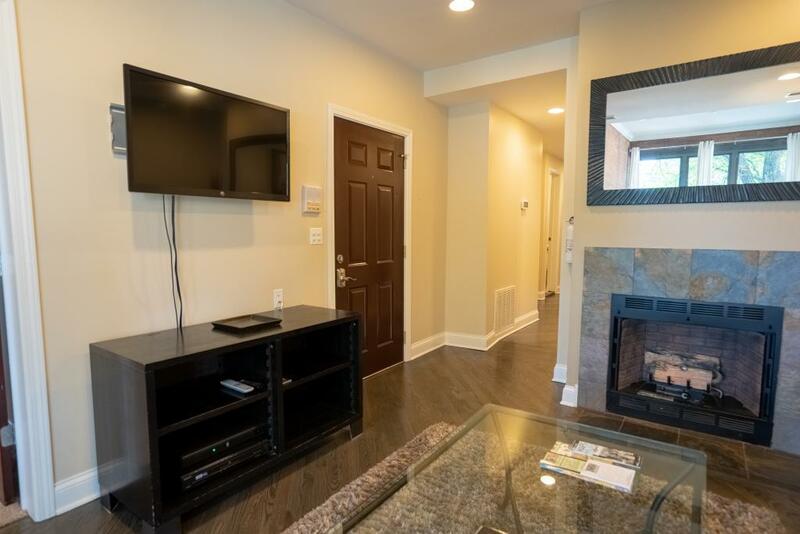 This apartment has a shared washer and dryer inside the building. 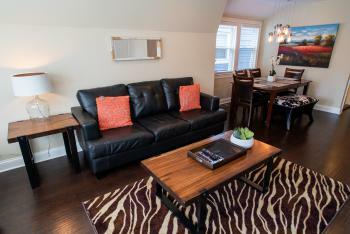 Village North #2 is a 2nd floor apartment, fully furnished and tastefully decorated. 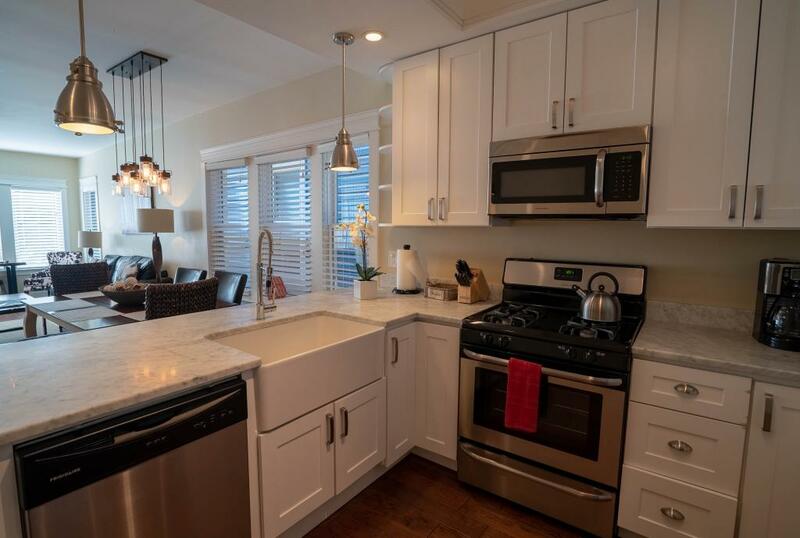 In the kitchen you will find stocked shelves with kitchenware along with with stainless steel appliances, coffee pot, complimentary coffee, tea & sugar. 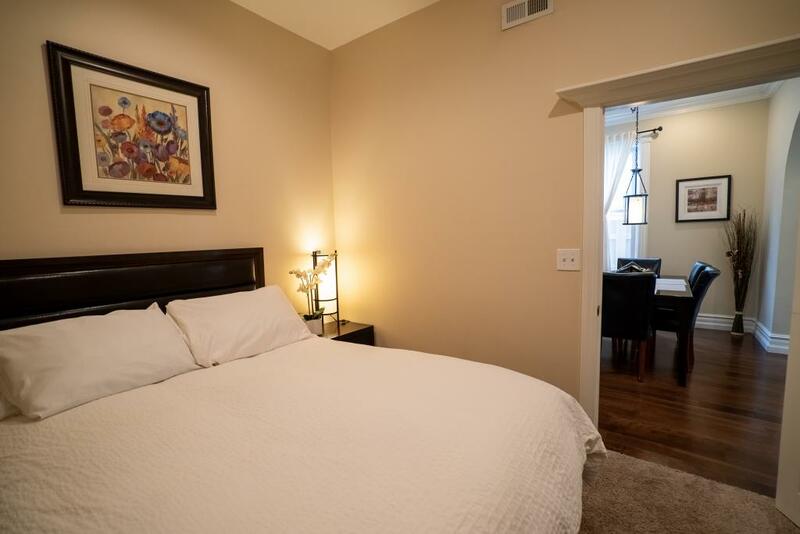 In the bedrooms you will find custom made beds with an independent spring system, memory foam pad, 400-1000 high thread count sheets and down comforters. 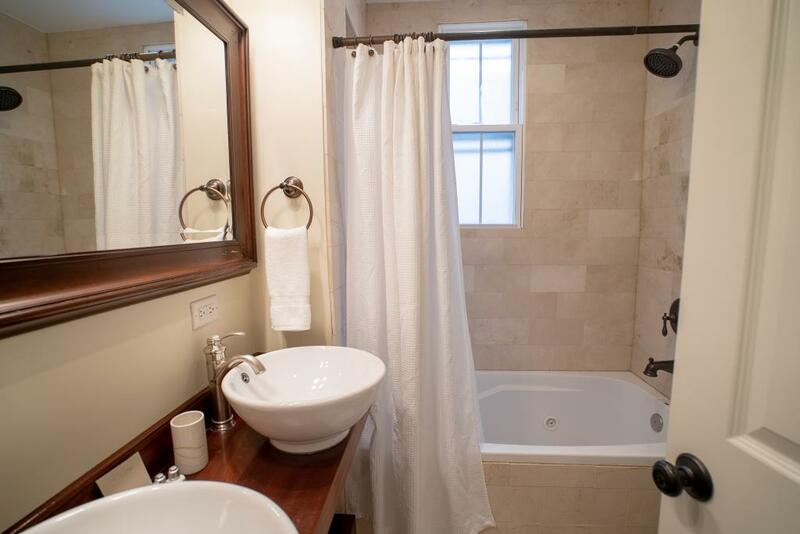 The bathrooms have lush towels and L'Occitane En Provence Verbena amenities. 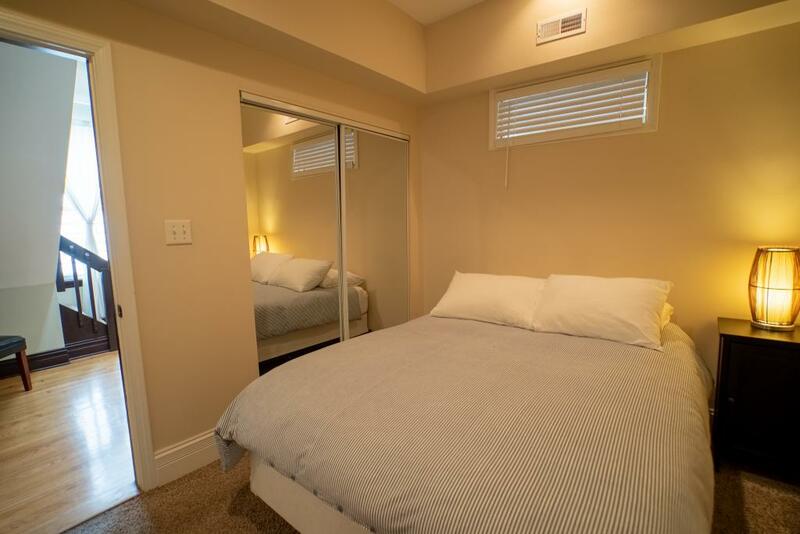 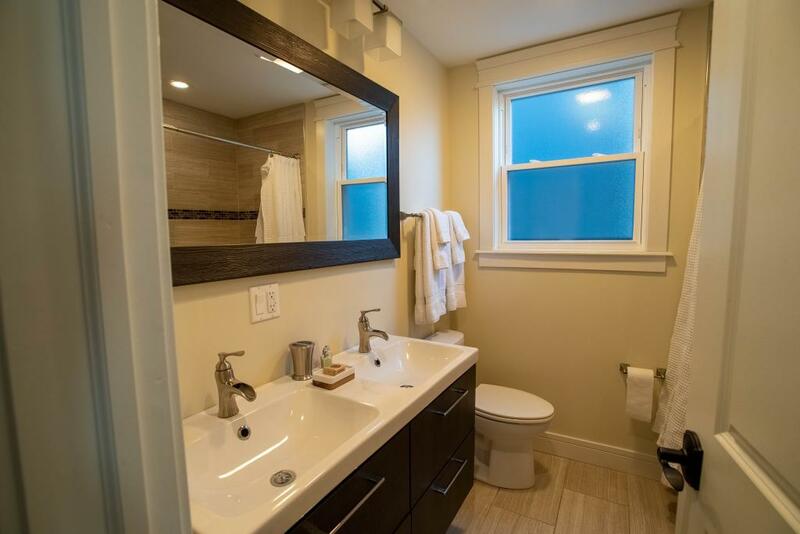 This apartment has a shared and dryer inside the building. 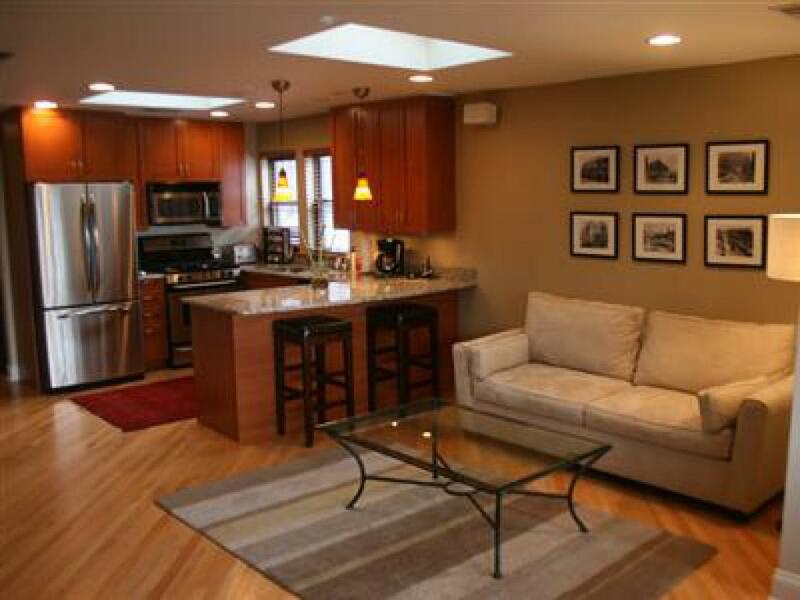 Village North #1 is a first floor apartment, fully furnished and tastefully decorated. In the kitchen you will find stocked shelves with kitchenware along with with stainless steel appliances, coffee pot, complimentary coffee, tea & sugar. 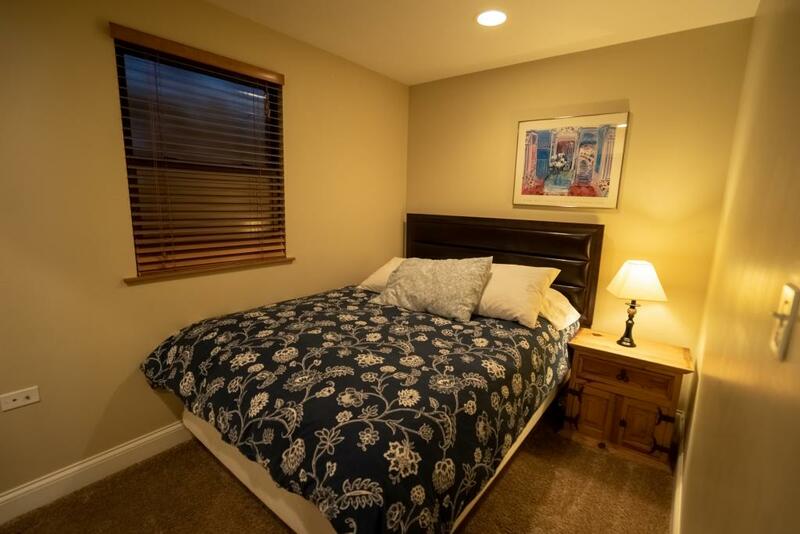 In the bedrooms you will find custom made beds with an independent spring system, memory foam pad, 400-1000 high thread count sheets and down comforters. 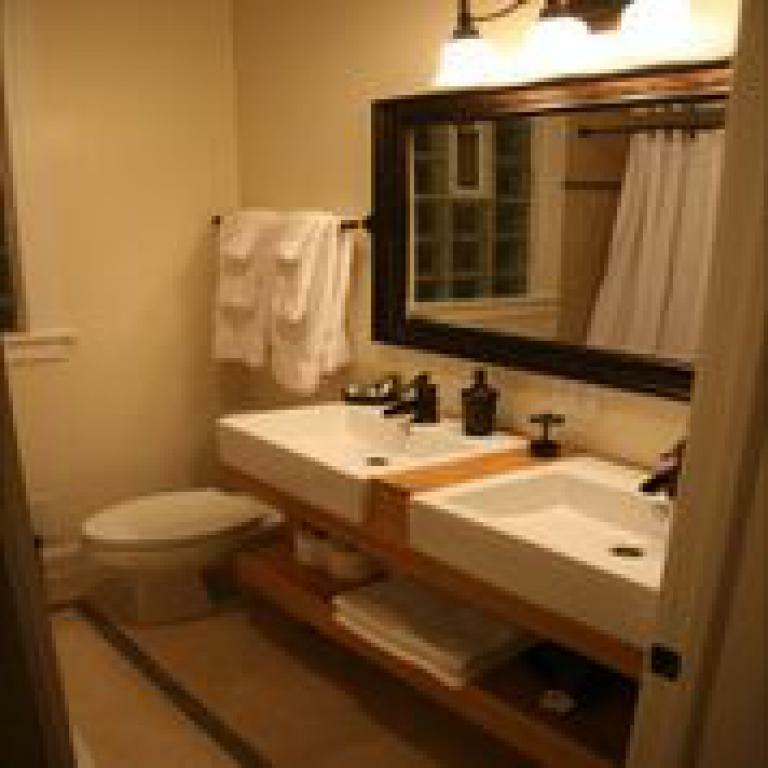 The bathrooms have lush towels and L'Occitane En Provence Verbena amenities. 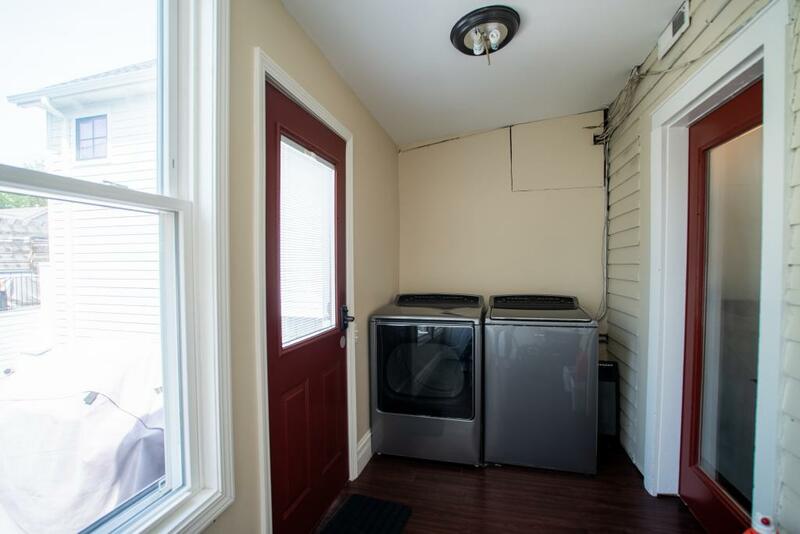 This apartment has a shared washer and dryer inside the building. 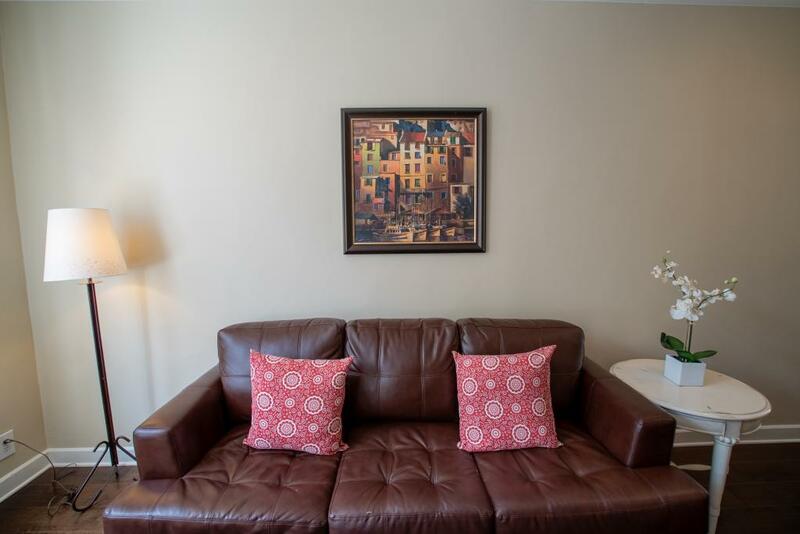 Village South #1 is a first floor apartment, fully furnished and tastefully decorated. 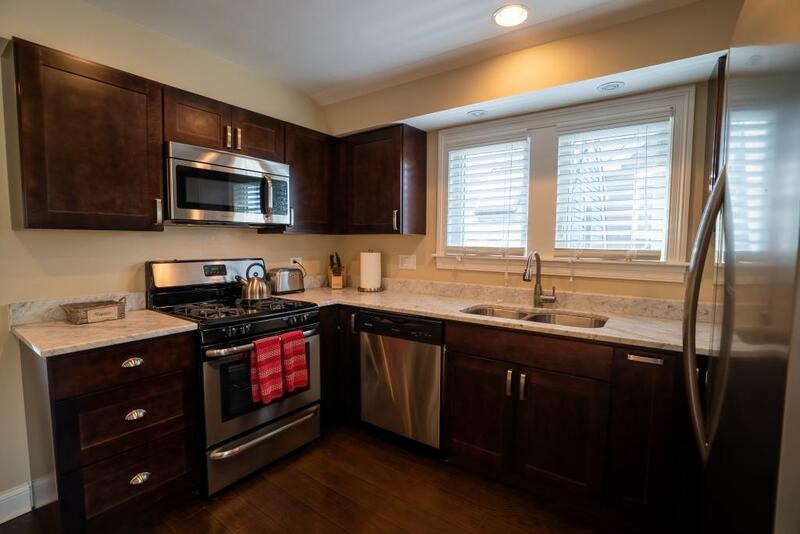 In the kitchen you will find stocked shelves with kitchenware along with with stainless steel appliances, coffee pot, complimentary coffee, tea & sugar. 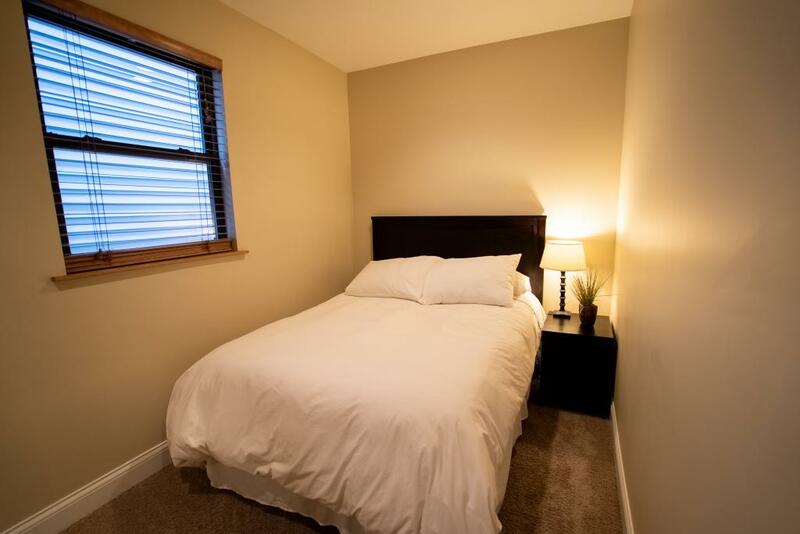 In the bedrooms you will find custom made beds with an independent spring system, memory foam pad, 400-1000 high thread count sheets and down comforters. 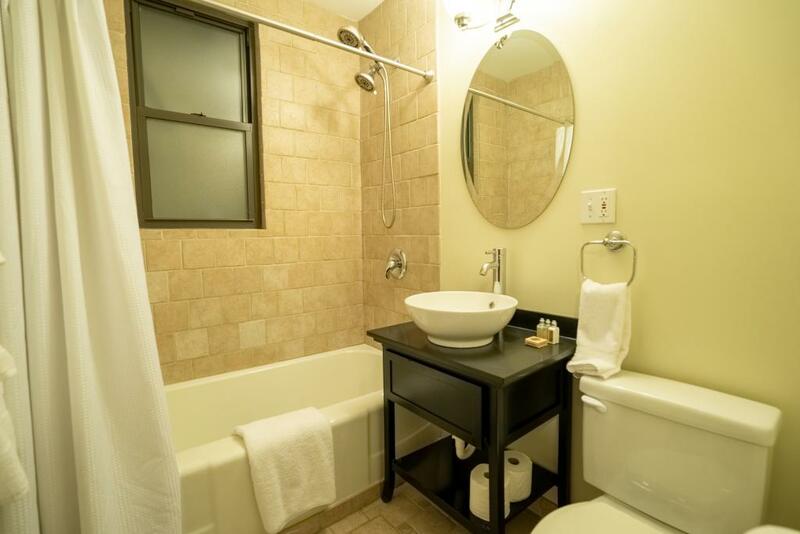 The bathrooms have lush towels and L'Occitane En Provence Verbena amenities. 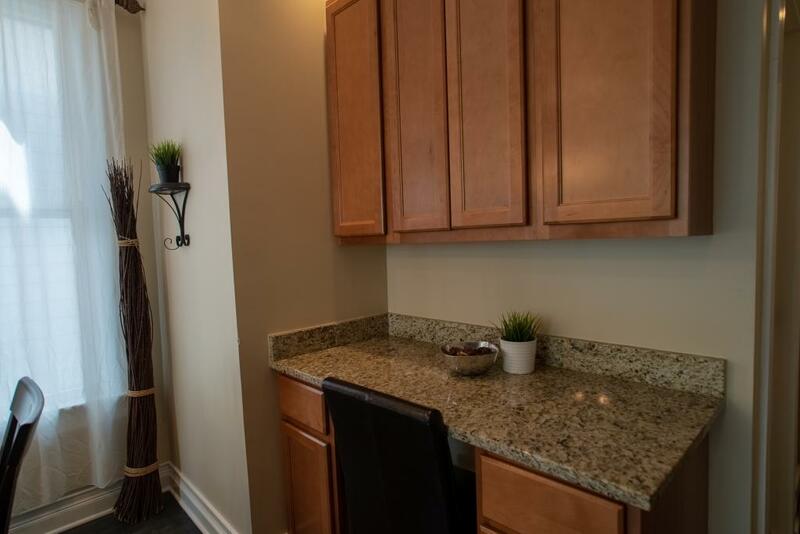 This apartment has a shared washer and dryer inside the building. 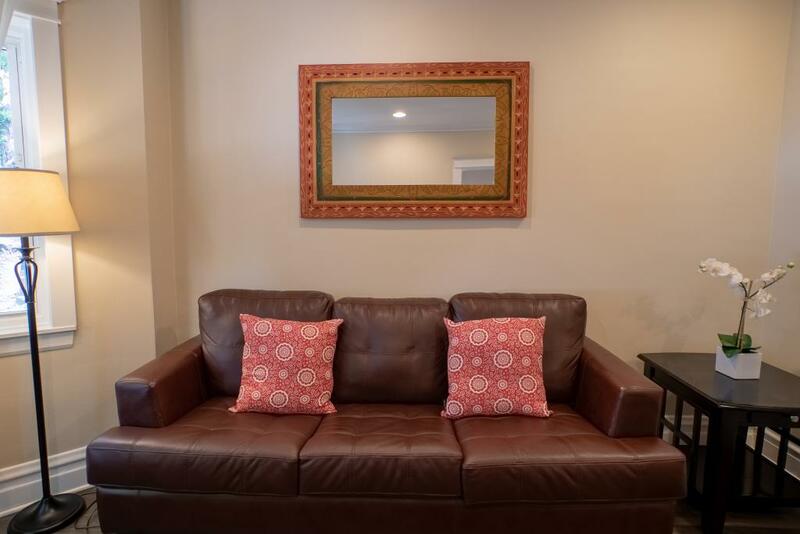 Village South #2 is a 2nd floor apartment, fully furnished and tastefully decorated. 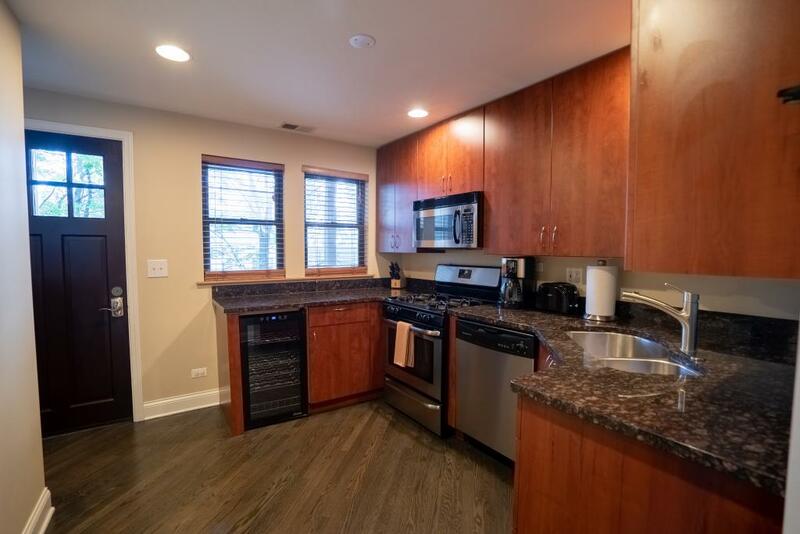 In the kitchen you will find stocked shelves with kitchenware along with with stainless steel appliances, coffee pot, complimentary coffee, tea & sugar. 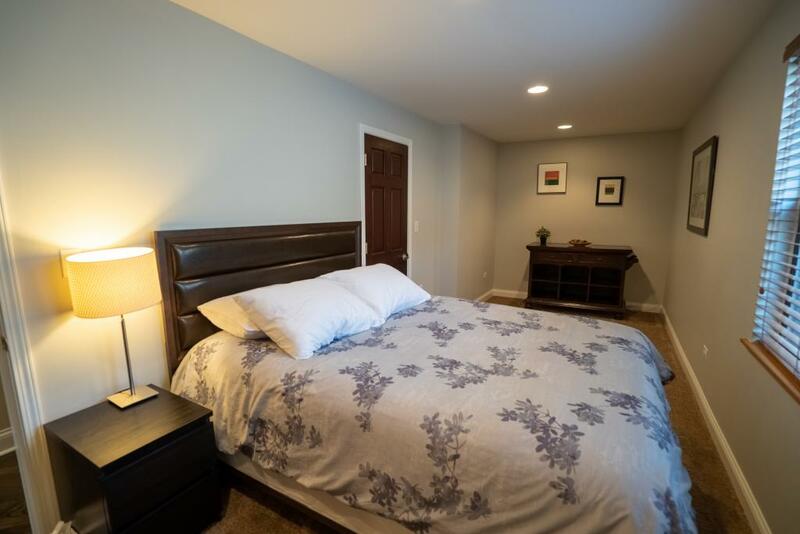 In the bedrooms you will find custom made beds with an independent spring system, memory foam pad, 400-1000 high thread count sheets and down comforters. 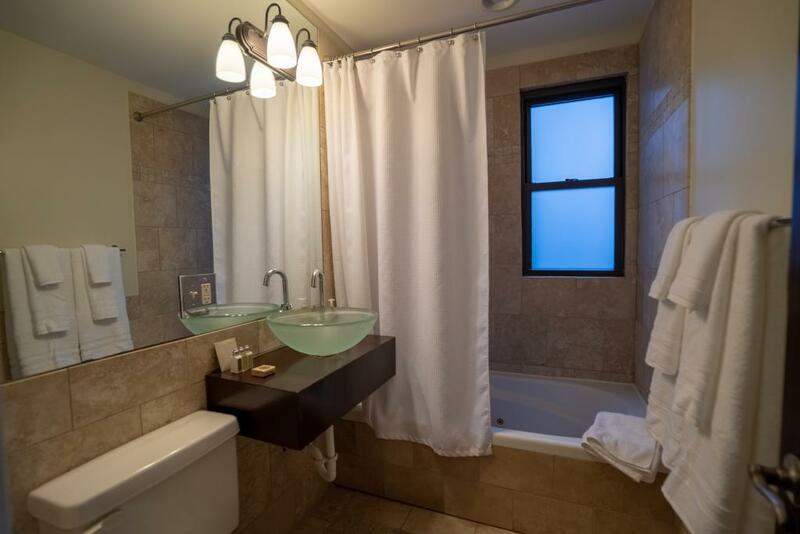 The bathrooms have lush towels and L'Occitane En Provence Verbena amenities. 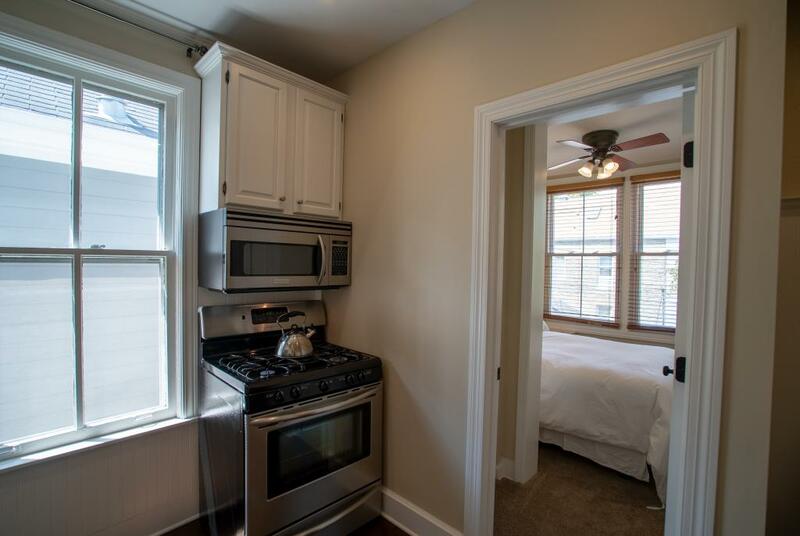 This apartment has a shared washer and dryer inside the building. 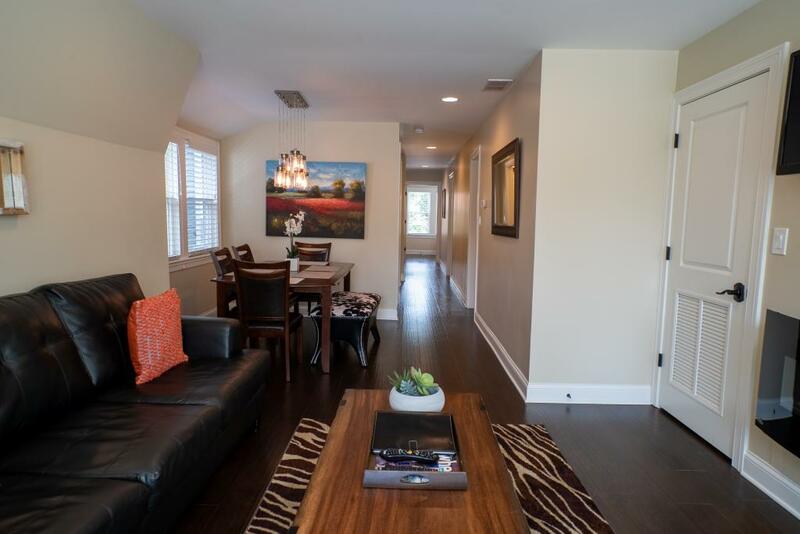 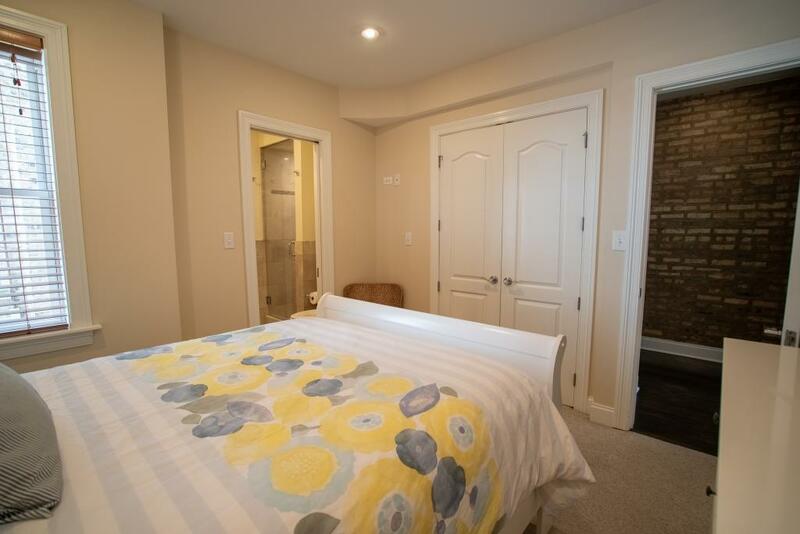 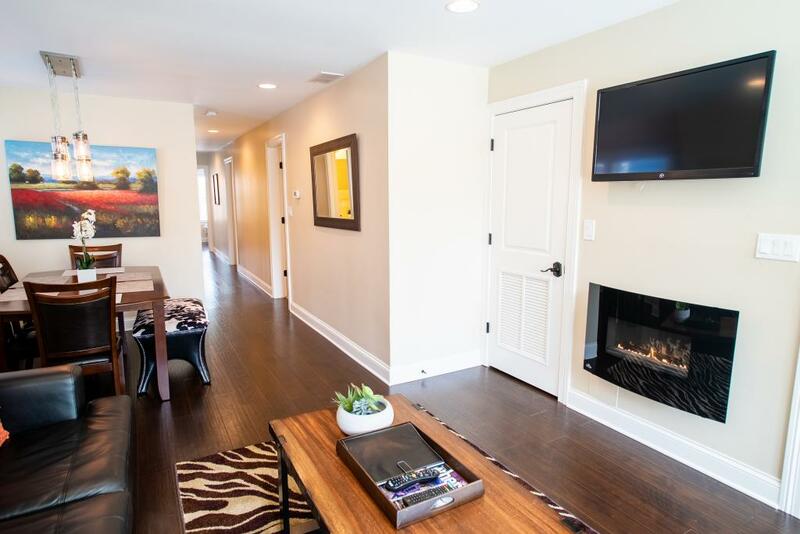 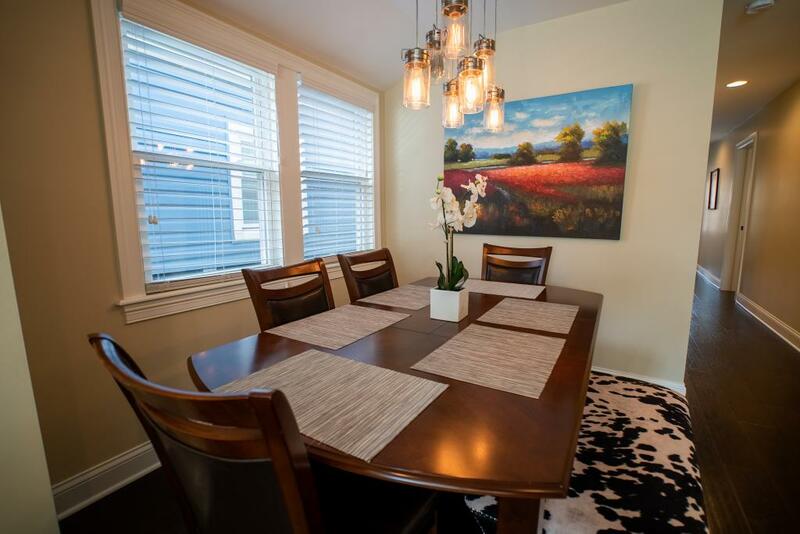 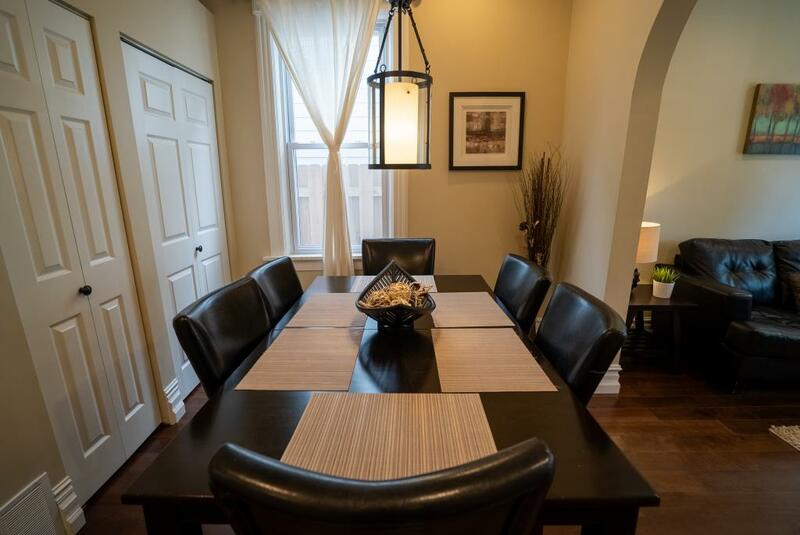 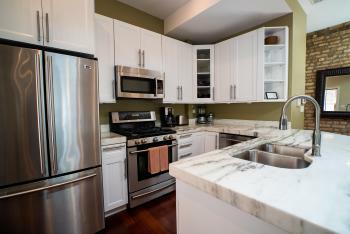 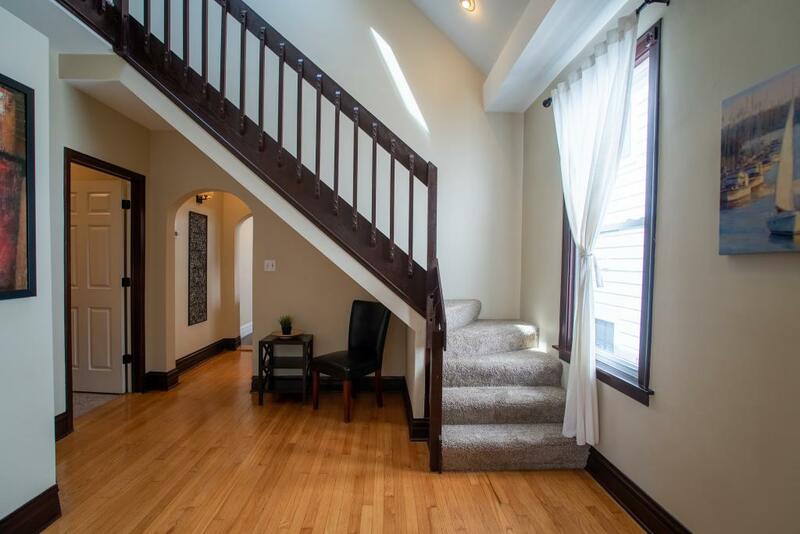 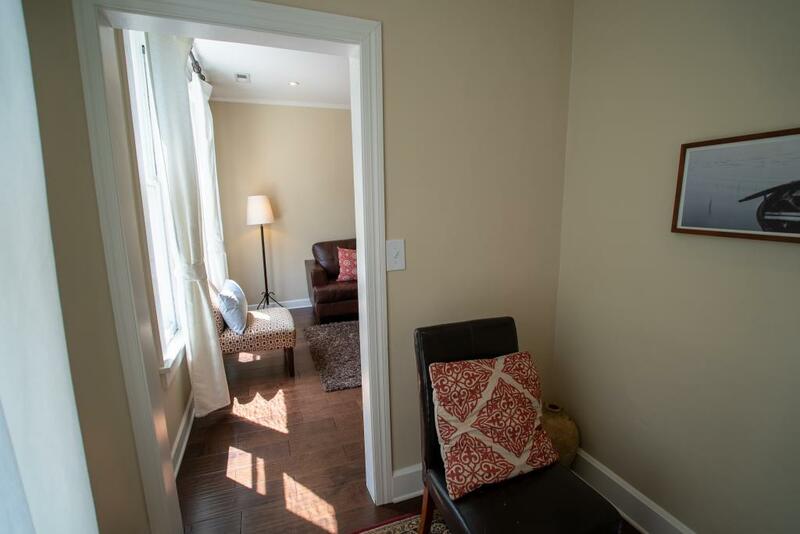 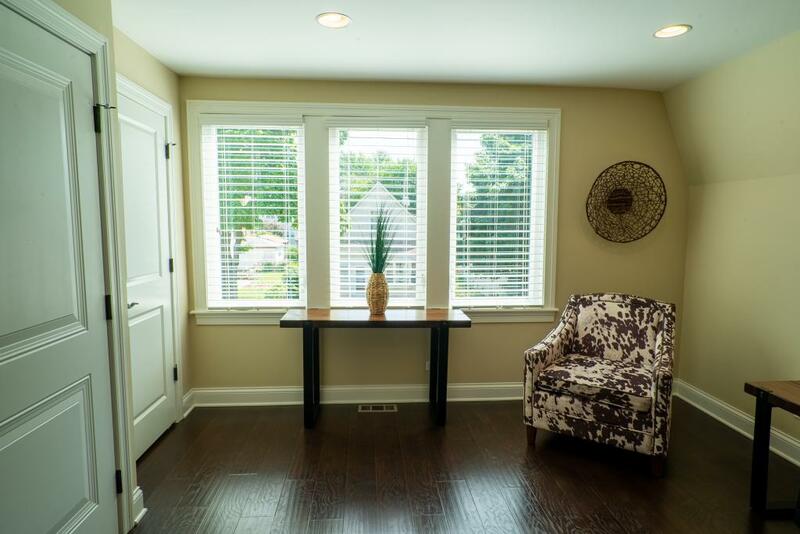 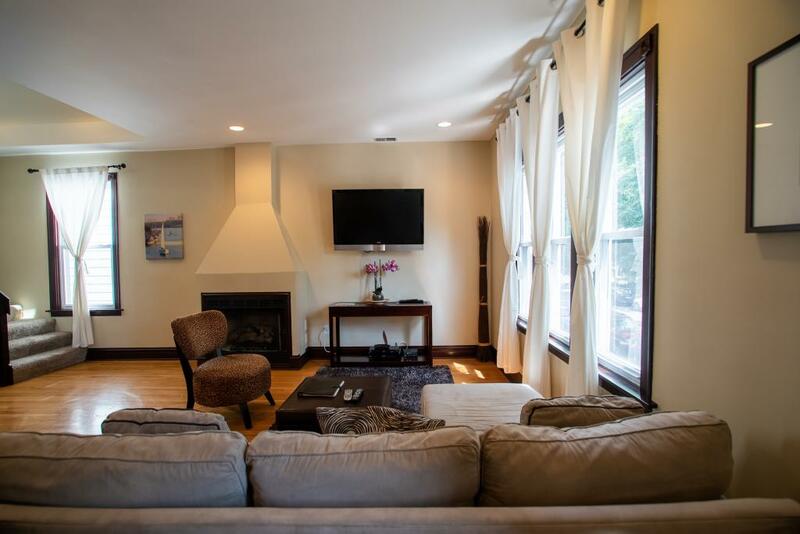 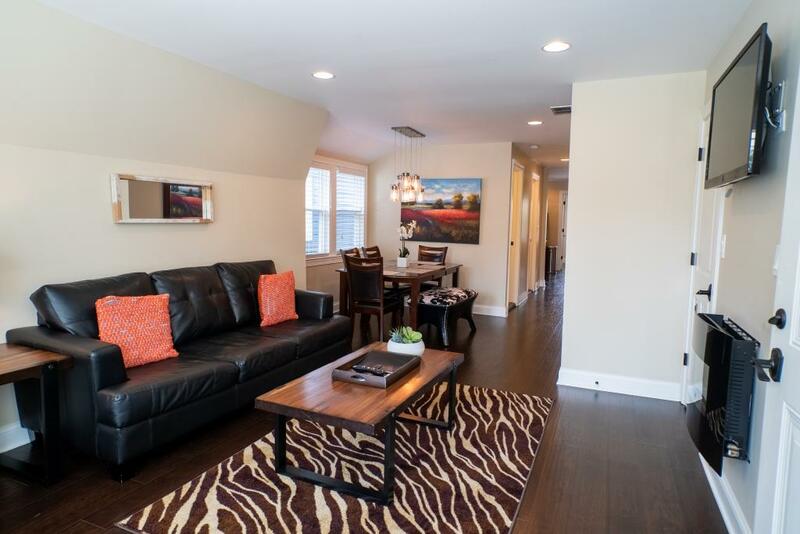 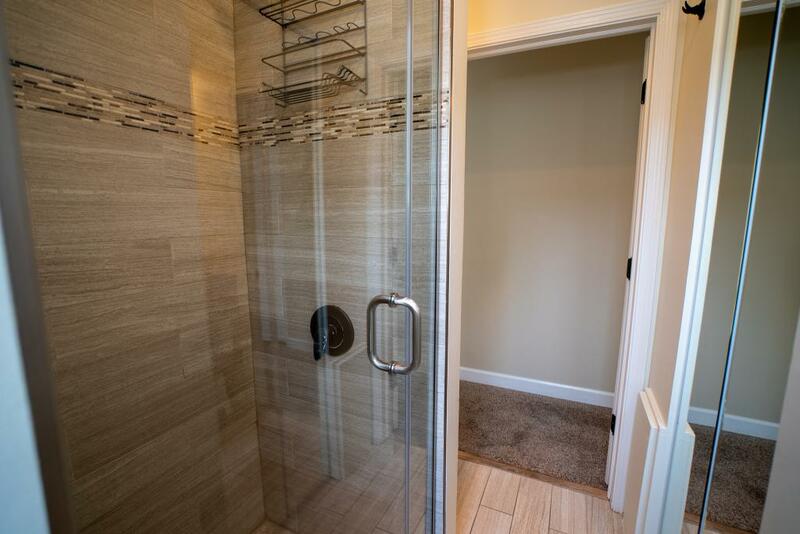 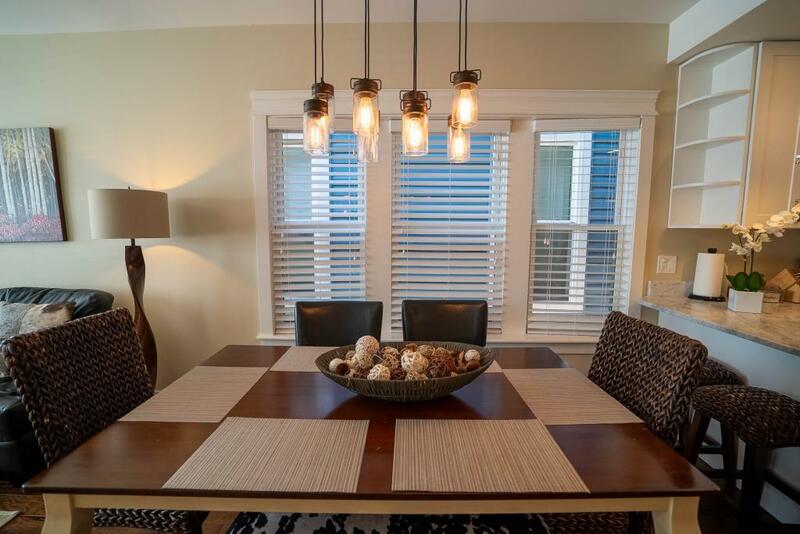 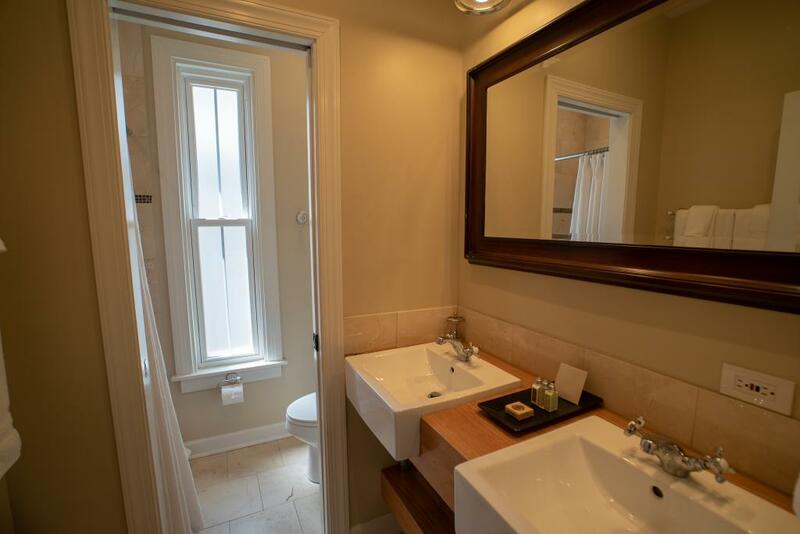 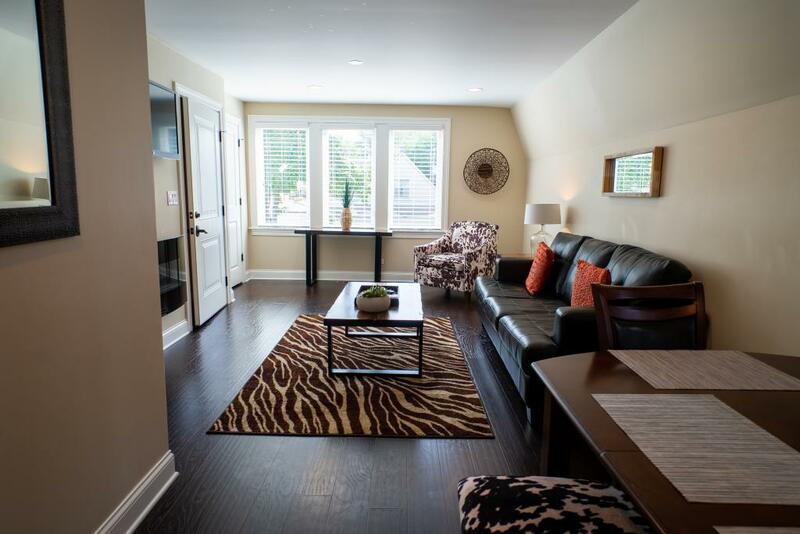 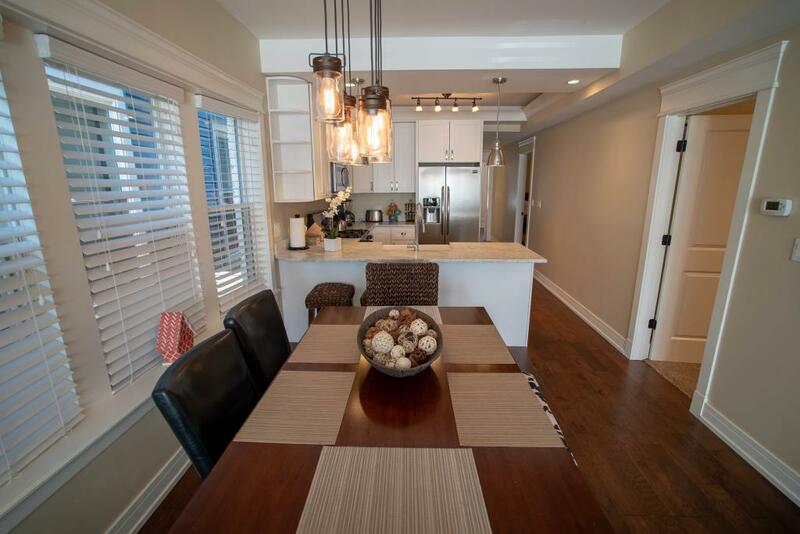 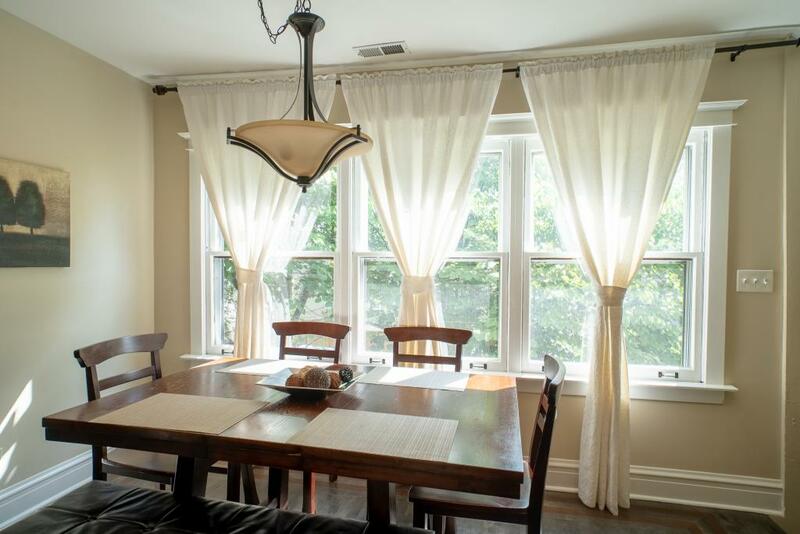 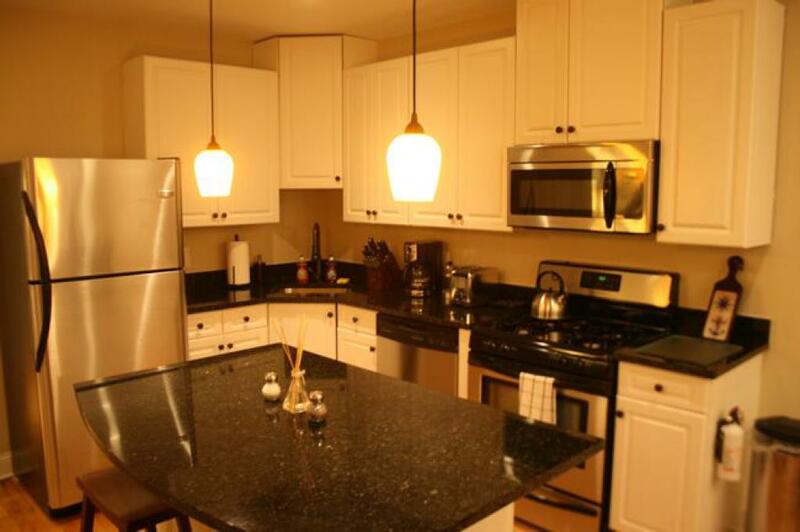 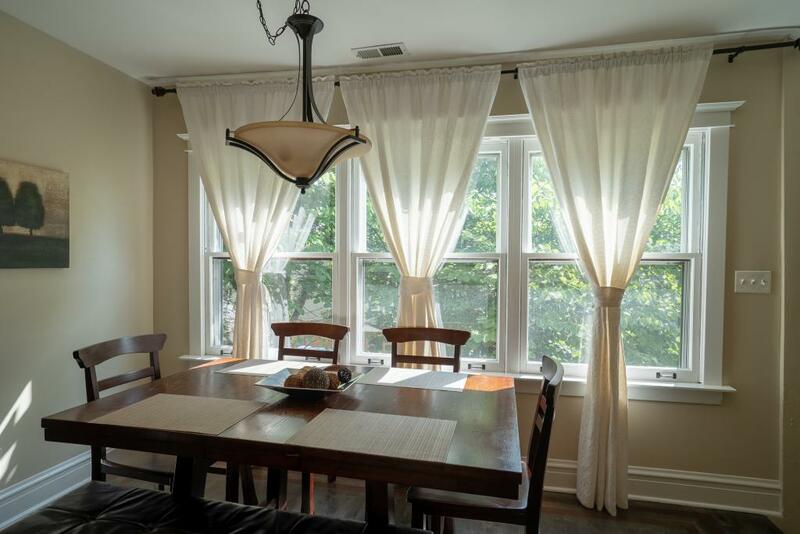 Hamlin #2 is a second & third floor apartment, fully furnished and tastefully decorated. 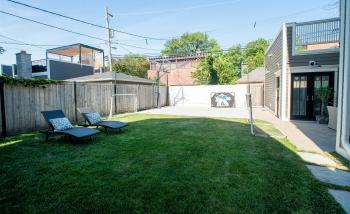 Located on Leavitt & Barry. 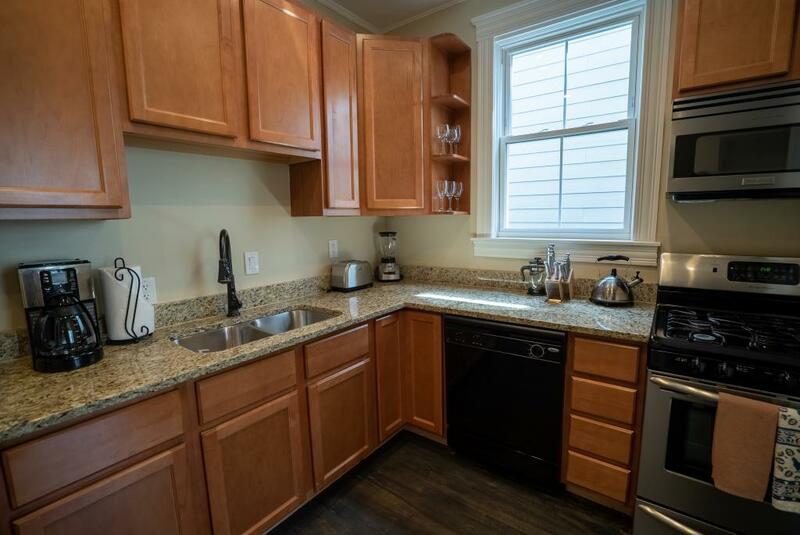 In the kitchen you will find stocked shelves with kitchenware along with with stainless steel appliances, coffee pot, complimentary coffee, tea & sugar. 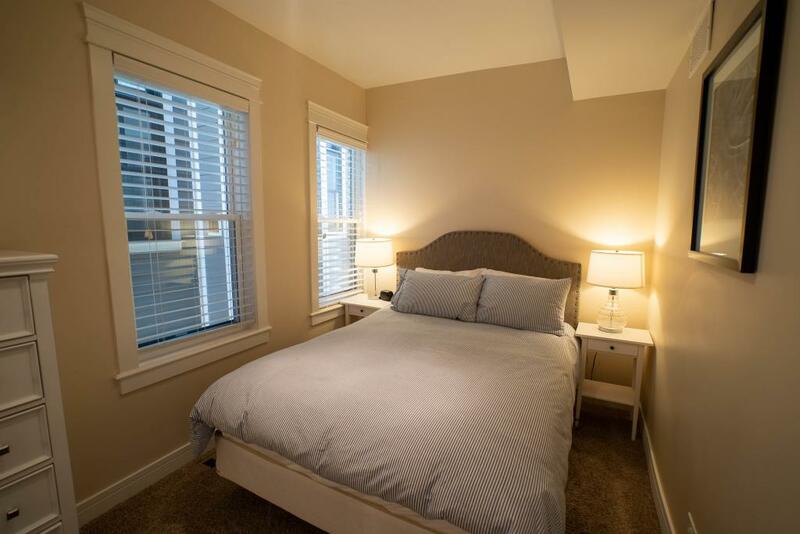 In the bedrooms you will find custom made beds with an independent spring system, memory foam pad, 400-1000 high thread count sheets and down comforters. 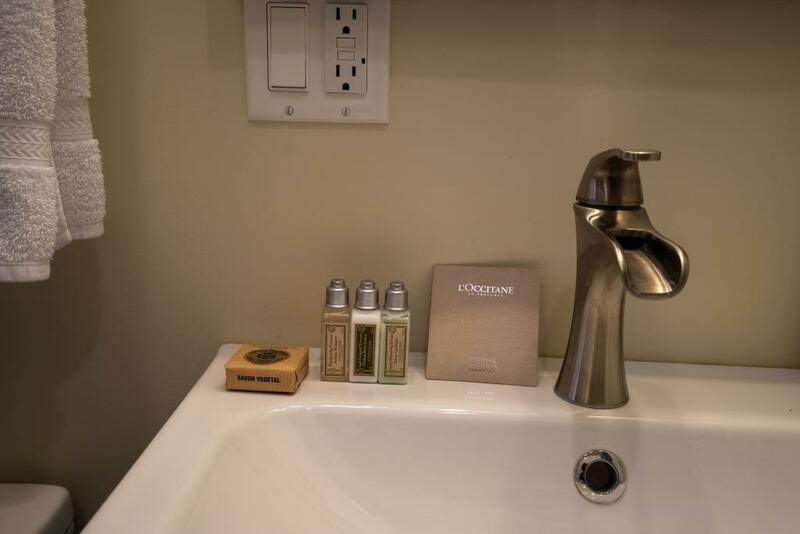 The bathrooms have lush towels and L'Occitane En Provence Verbena amenities. 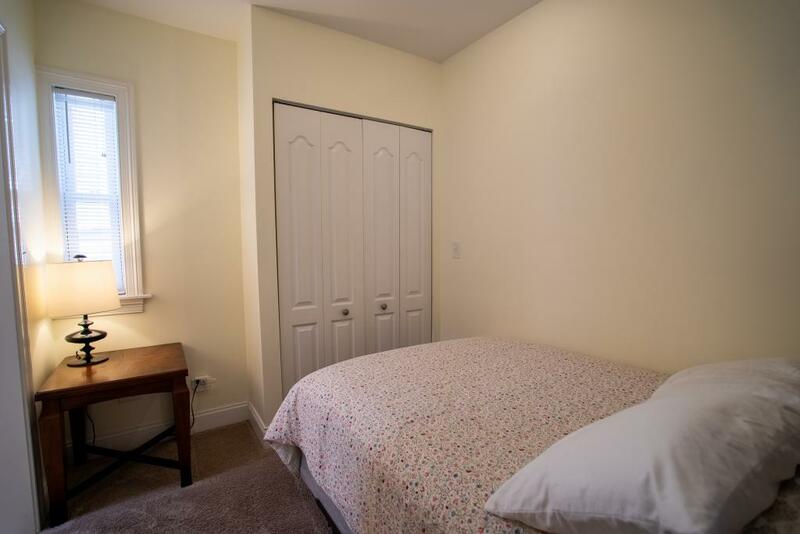 This apartment has a shared washer and dryer in the basement of the building. 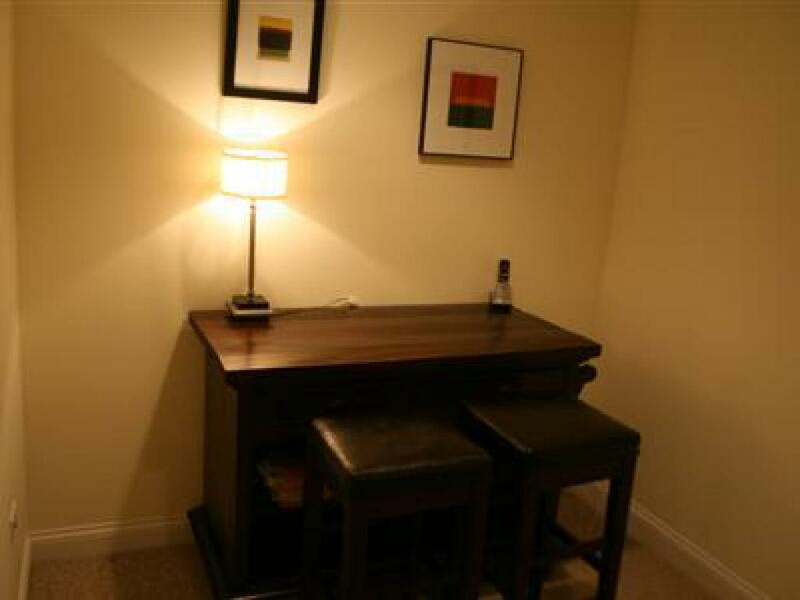 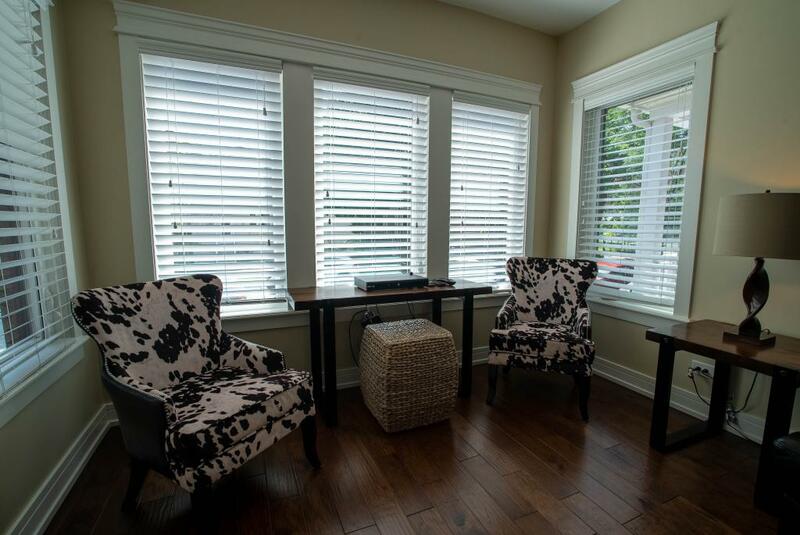 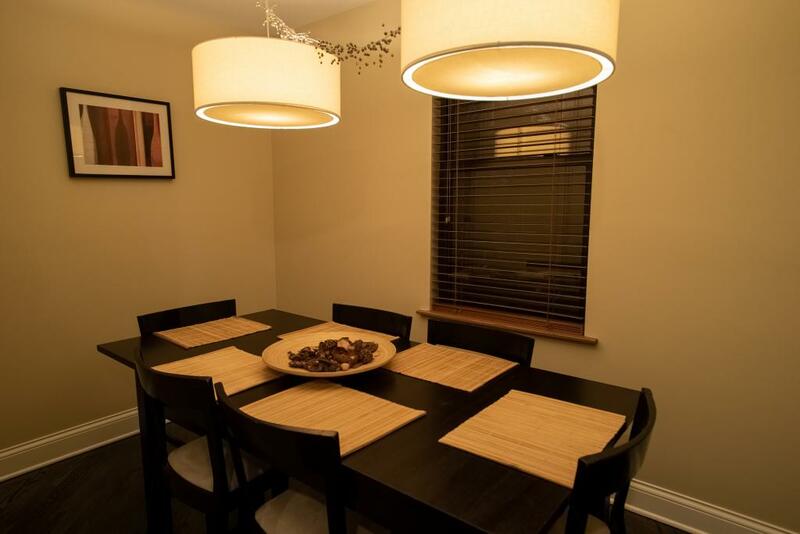 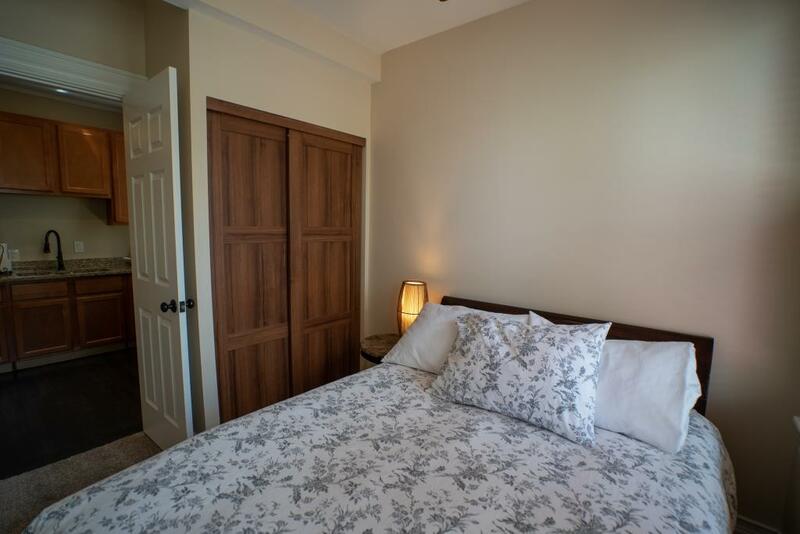 Our properties are all fully furnished and tastefully decorated. 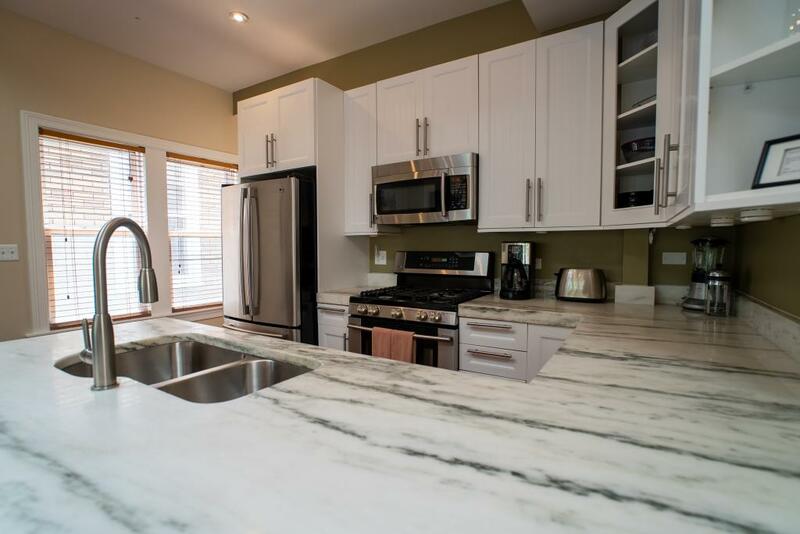 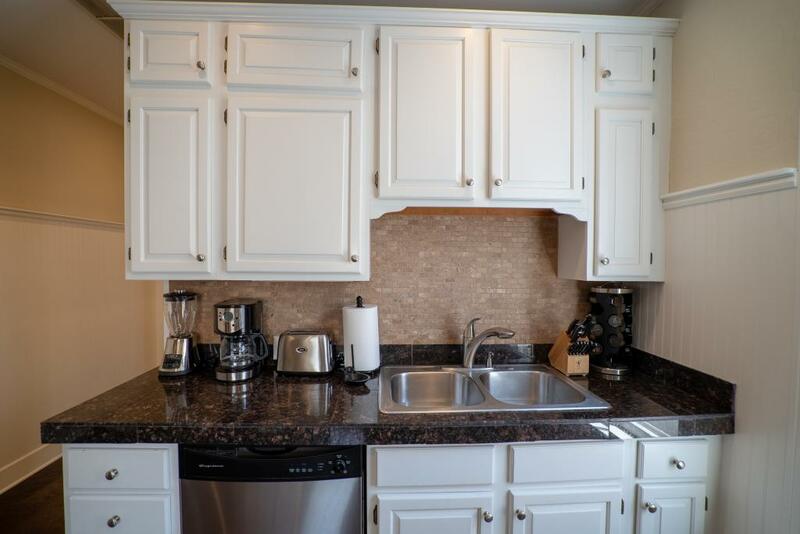 In the kitchens you will find stocked shelves with kitchenware along with with stainless steel appliances, coffee pot, complimentary coffee, tea & sugar. 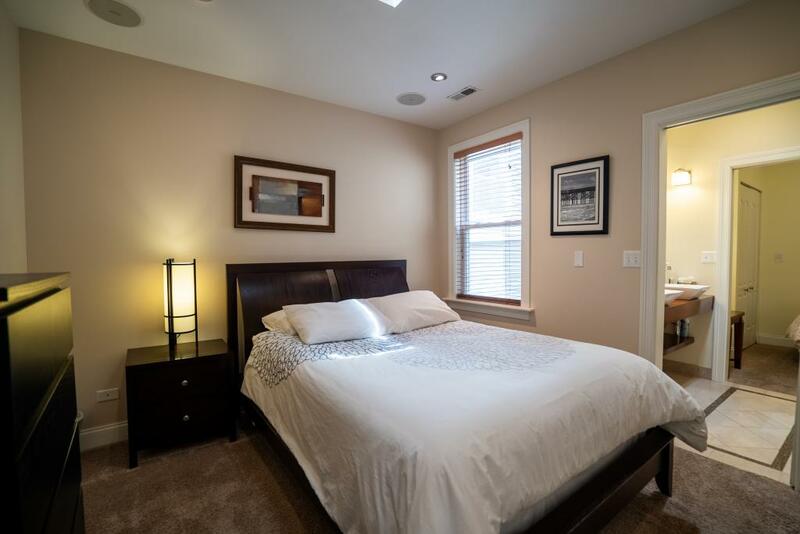 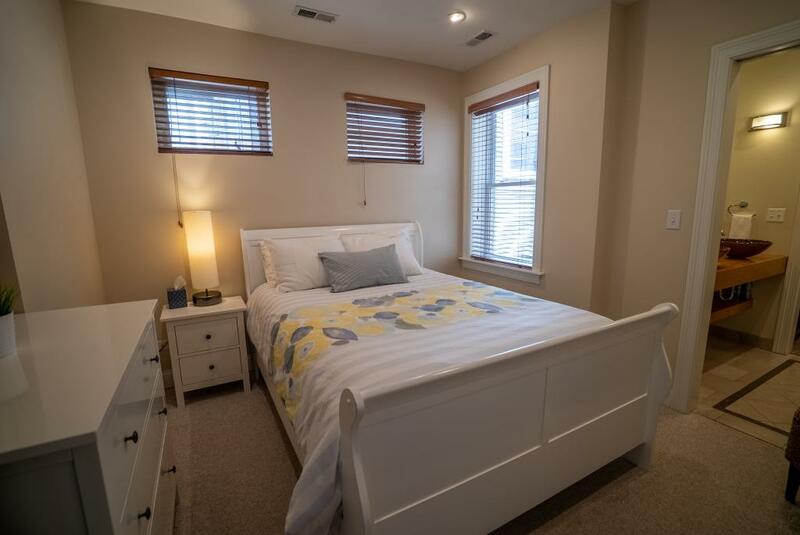 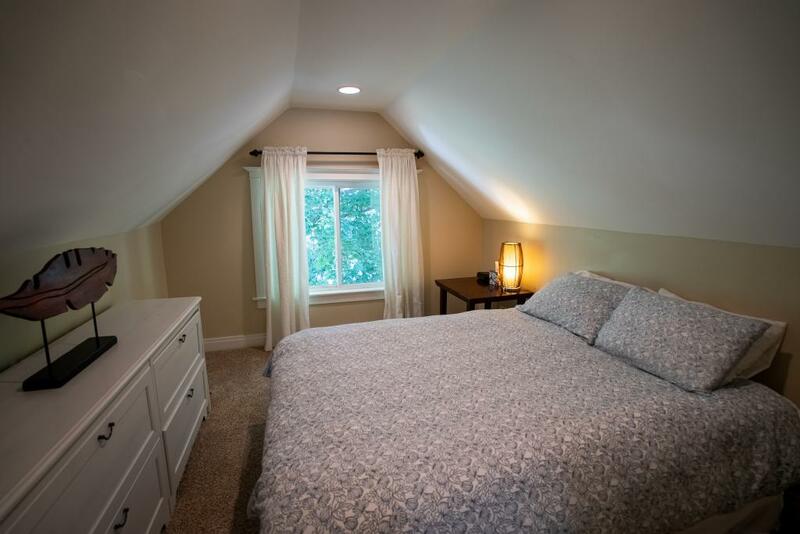 In the bedrooms you will find custom made beds with an independent spring system, memory foam pad, 400-1000 high thread count sheets and down comforters. 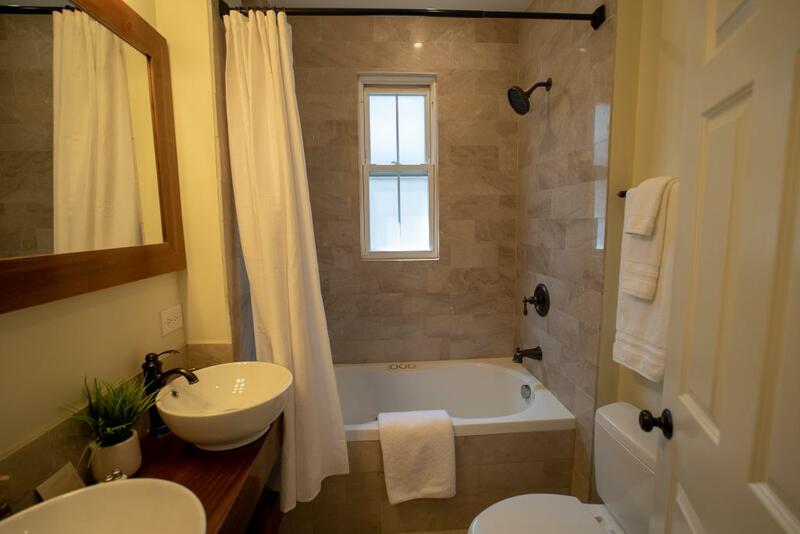 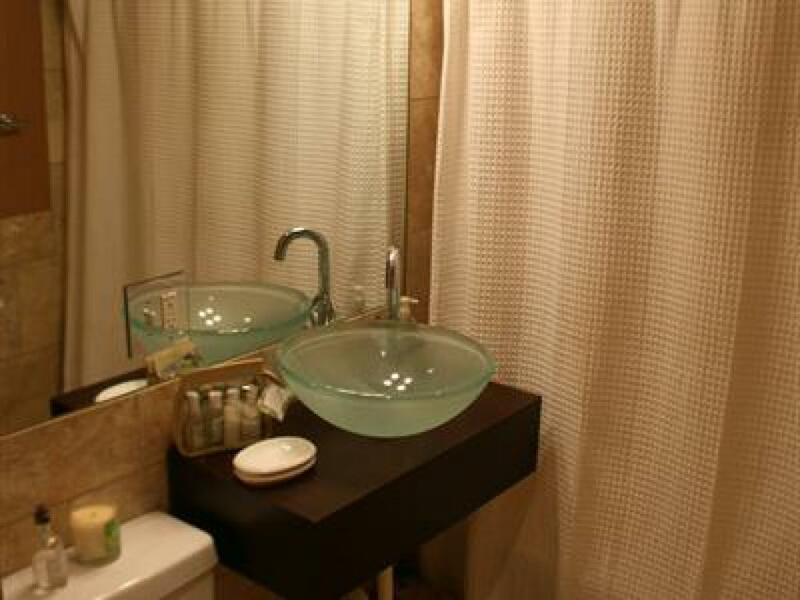 The bathrooms have lush towels and L'Occitane En Provence Verbena amenities. Chicago's neighborhoods are served by multiple bus and train lines for public transportation. Get fare details, schedule timetables and maps for the Chicago Transit Authority (CTA) at transitchicago.com. 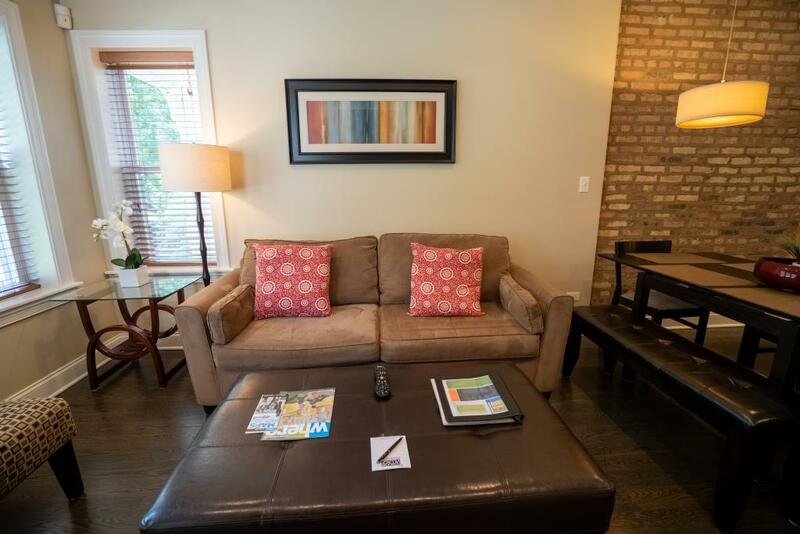 For visitors traveling by suburban commuter train, get station maps and full schedules from Metra at metrarail.com. 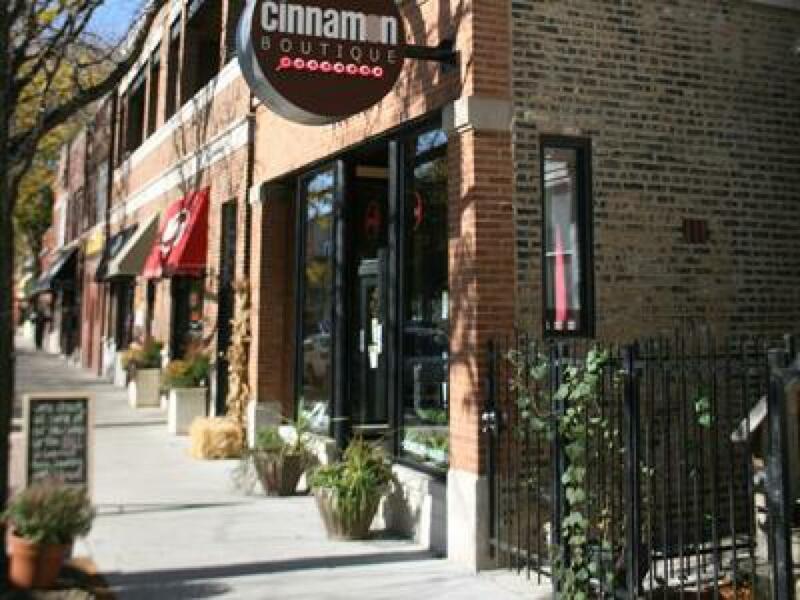 No matter how you get around, you'll have no trouble navigating the city, thanks to Chicago's grid system. The State/Madison intersection marks the origin of the grid—the 0/0 mark—with every eight blocks equaling one mile. 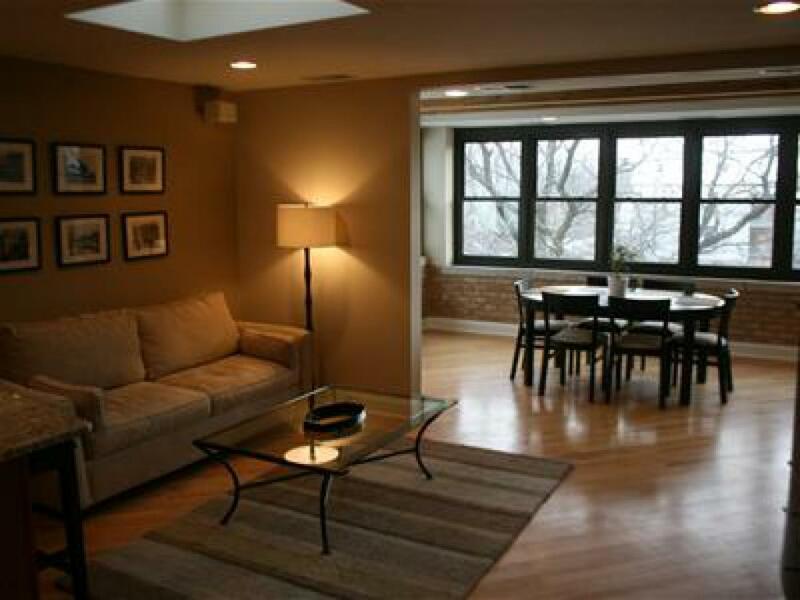 State Street divides the city east and west, while Madison Street divides the city north and south. 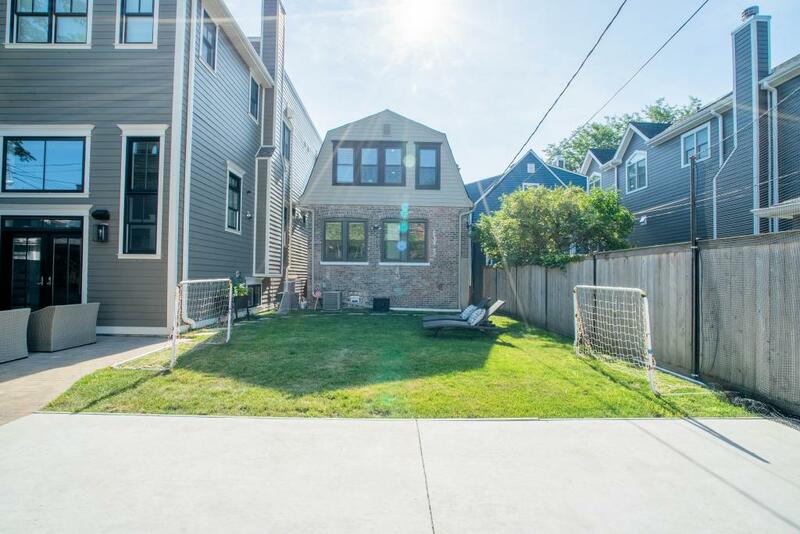 Every address is relative to the 0/0 mark. 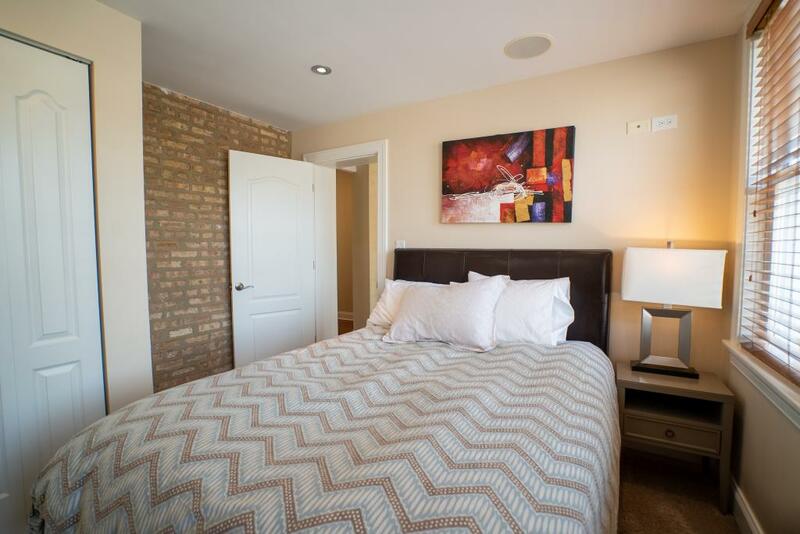 For example, 900 N. Michigan Avenue is roughly nine blocks north of Madison Street on Michigan Avenue.